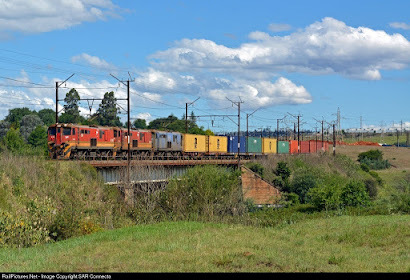 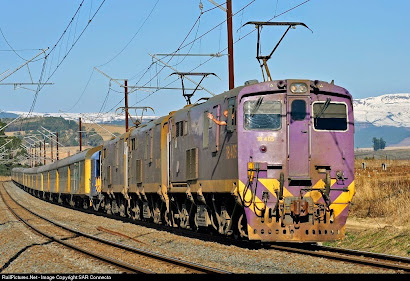 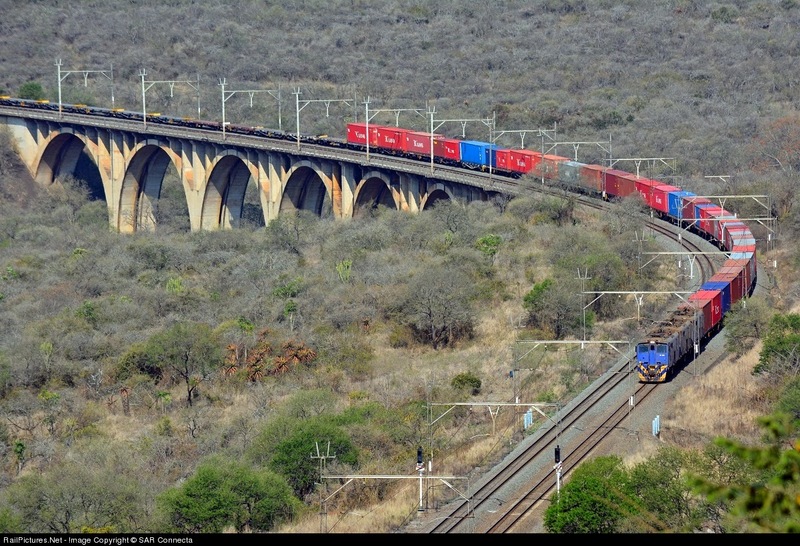 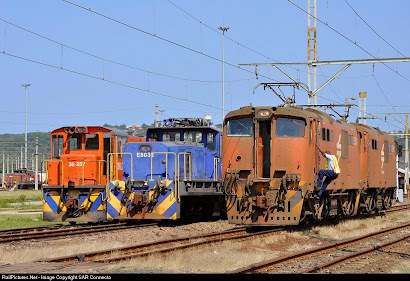 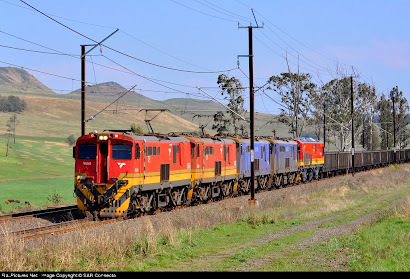 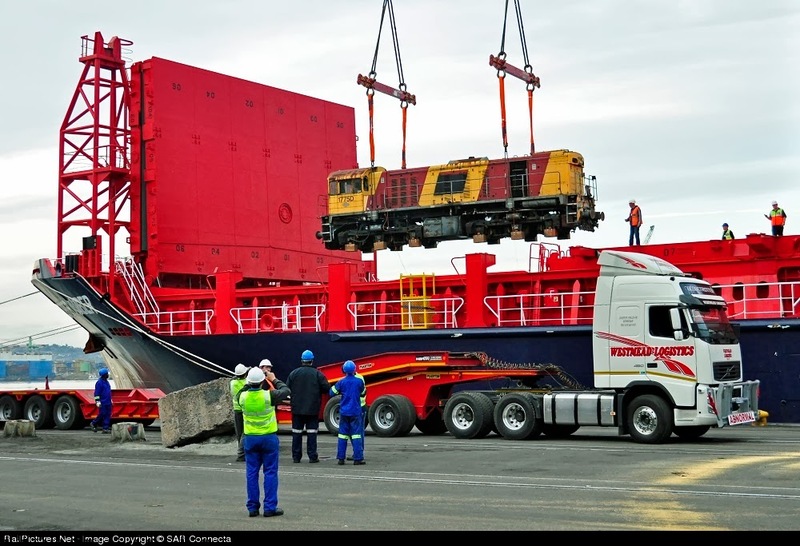 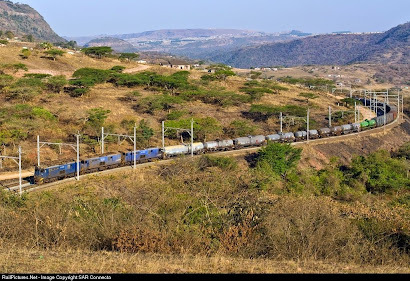 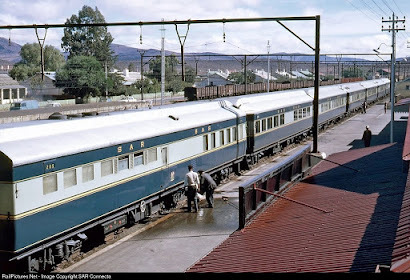 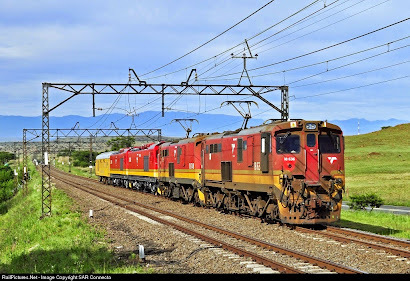 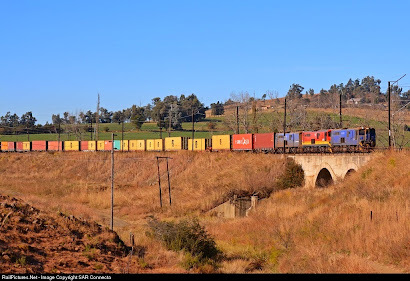 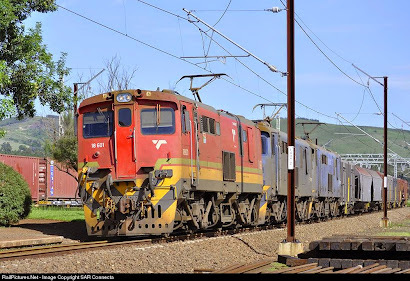 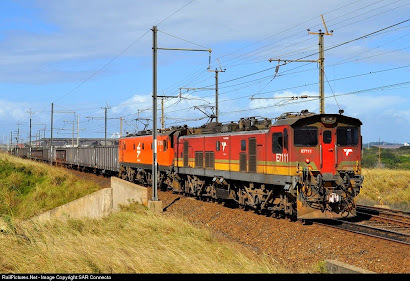 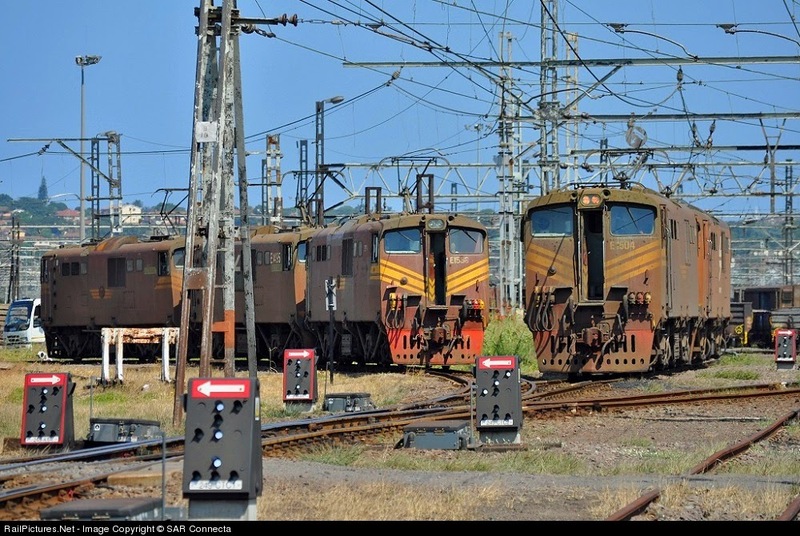 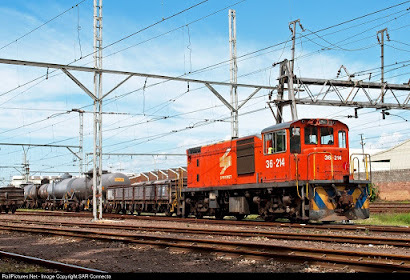 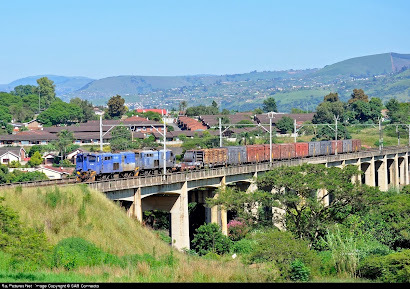 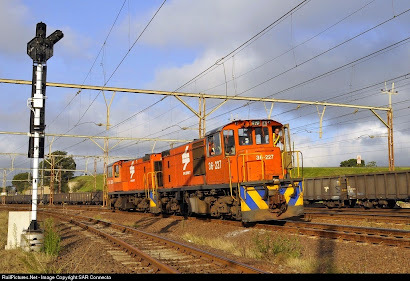 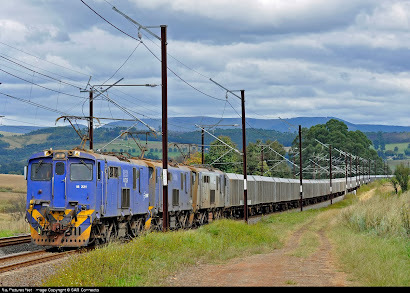 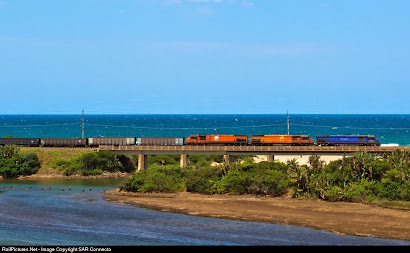 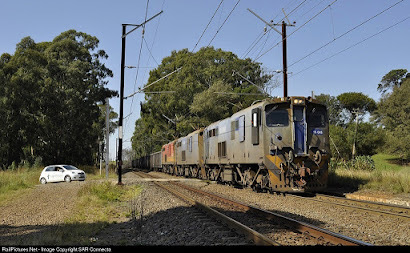 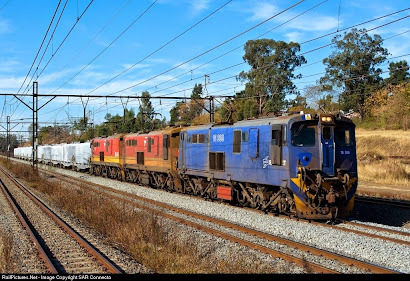 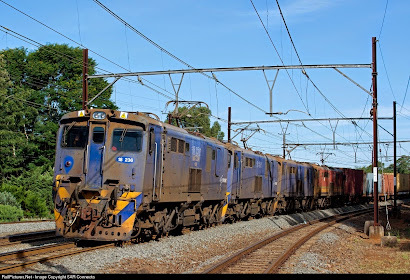 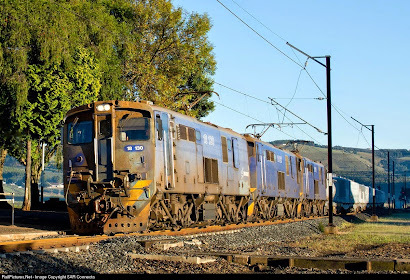 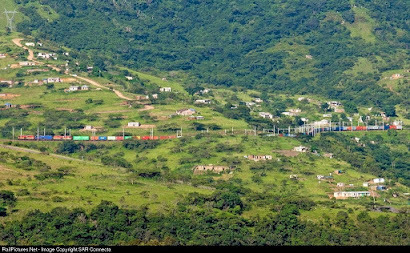 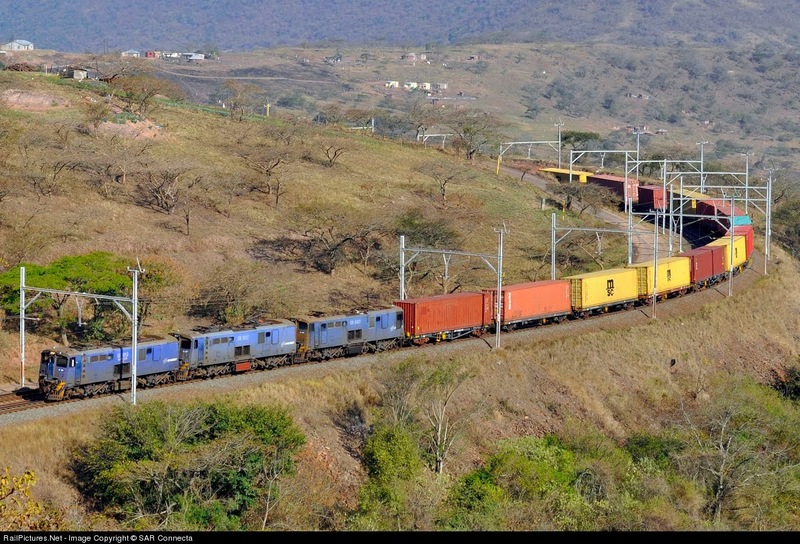 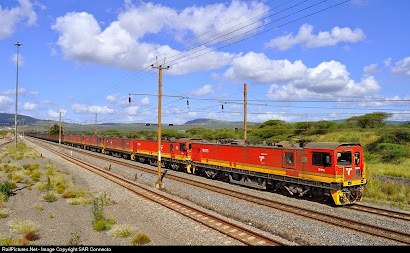 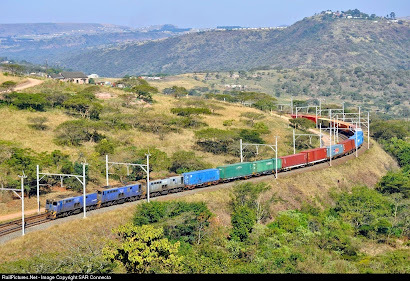 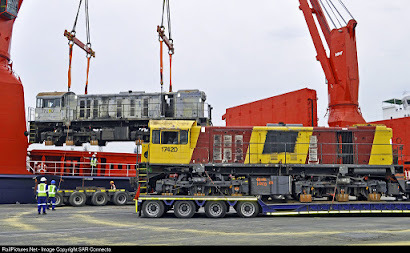 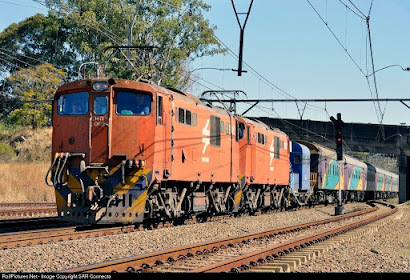 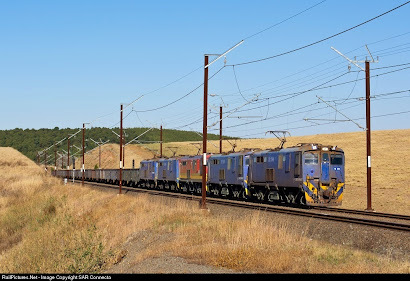 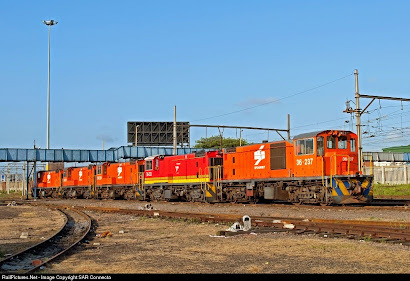 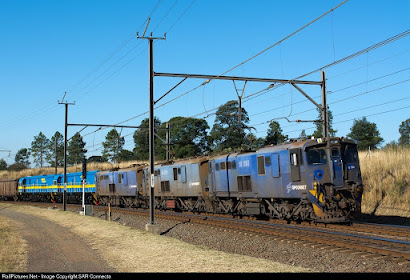 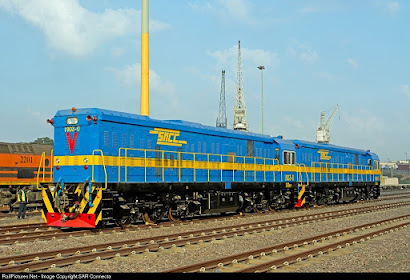 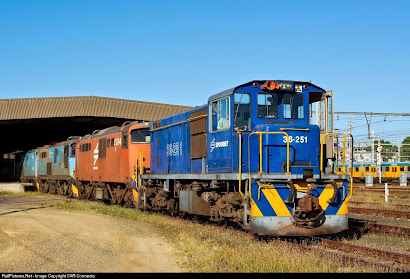 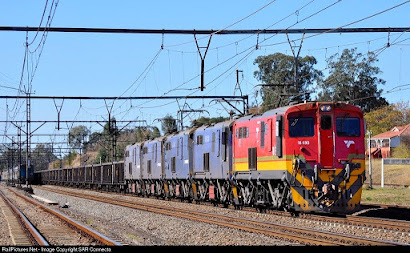 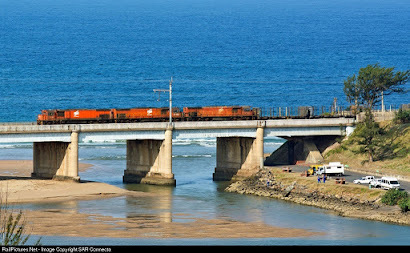 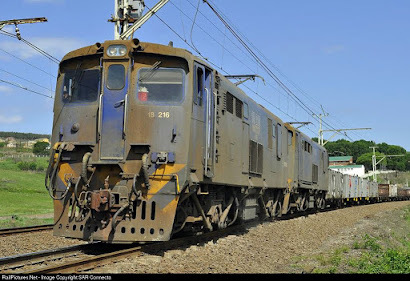 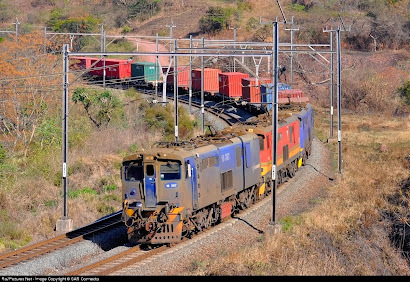 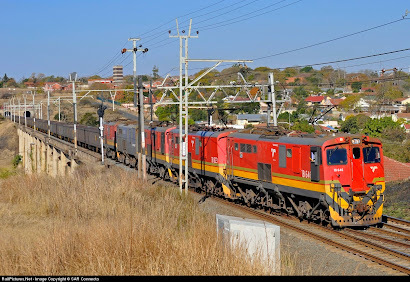 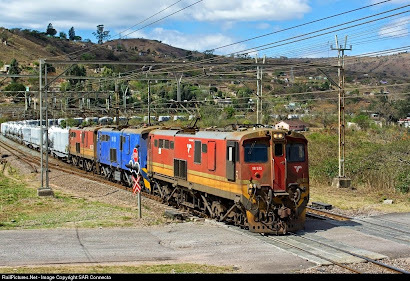 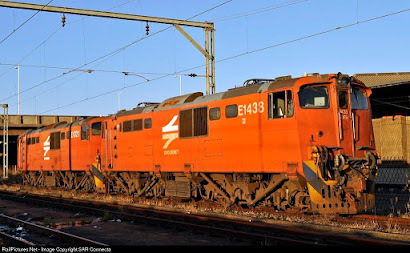 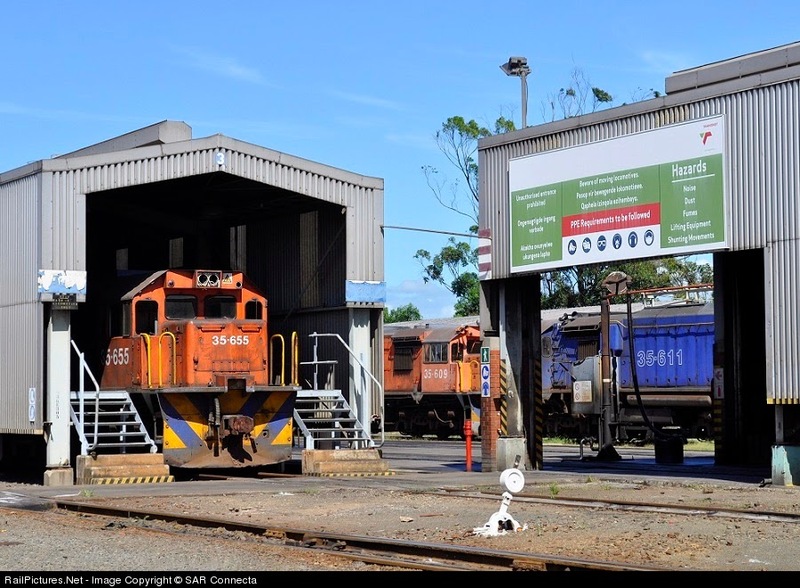 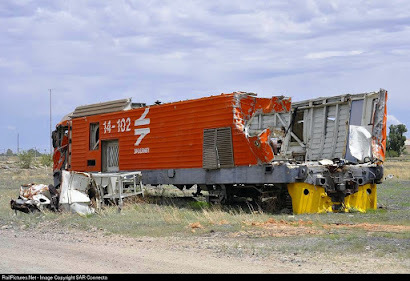 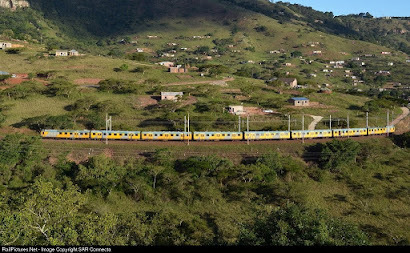 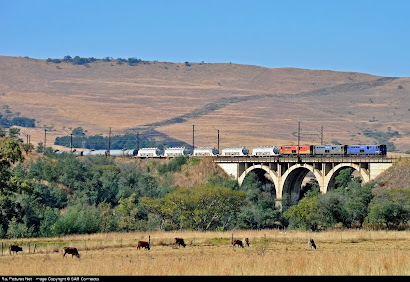 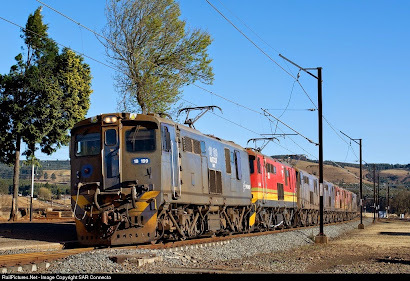 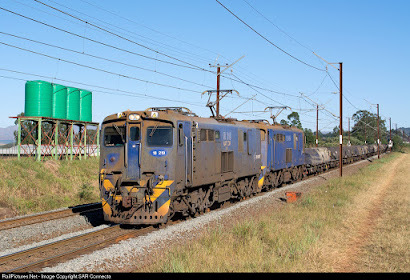 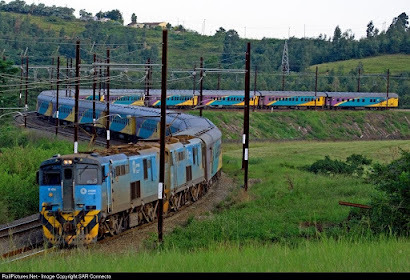 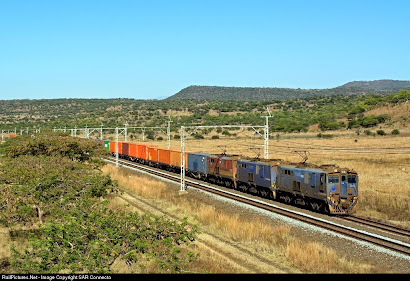 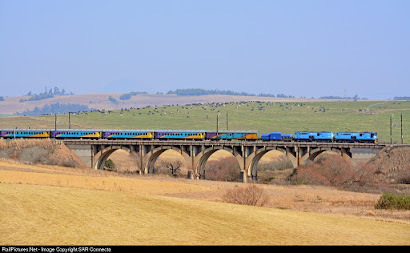 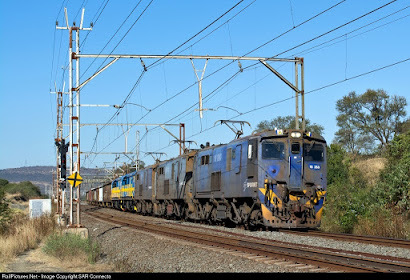 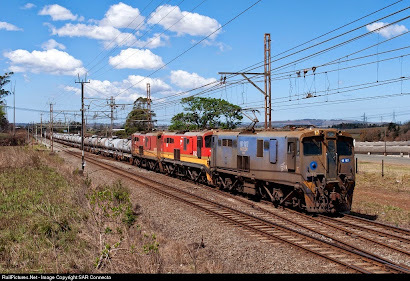 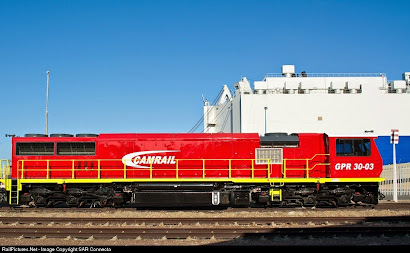 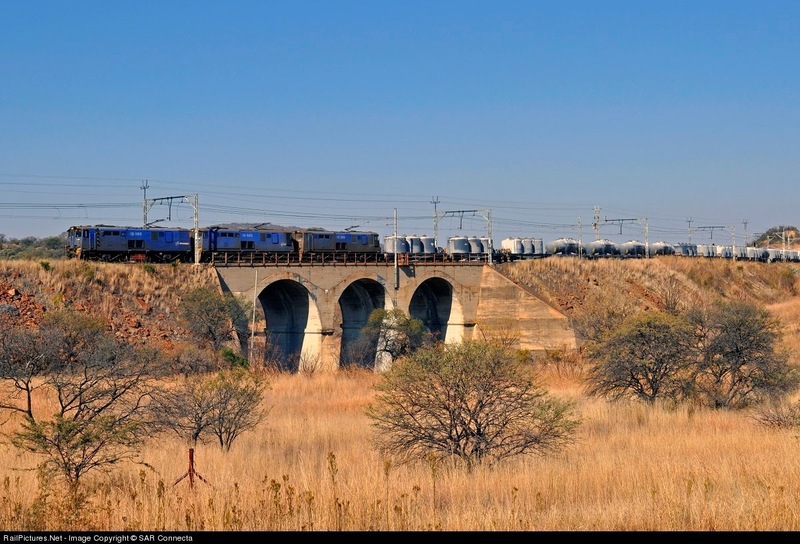 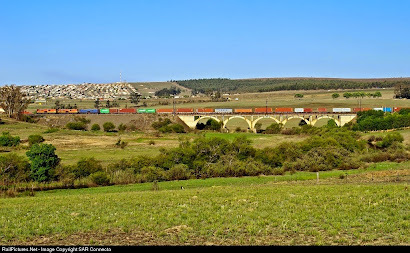 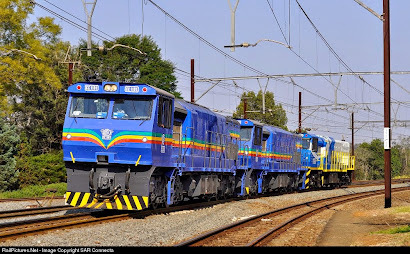 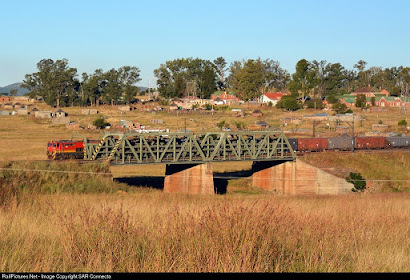 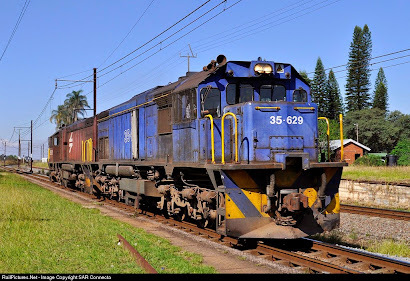 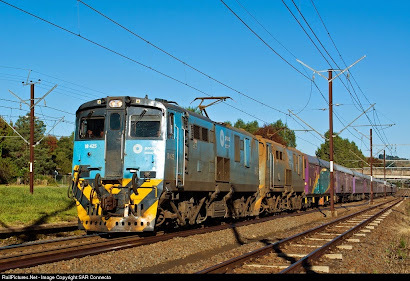 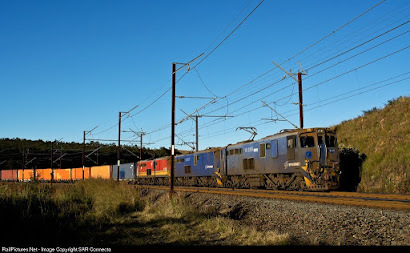 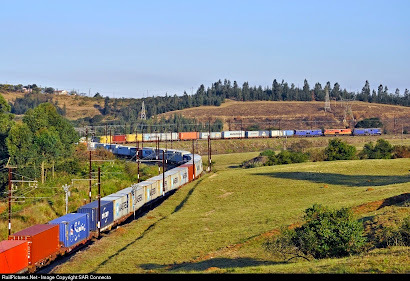 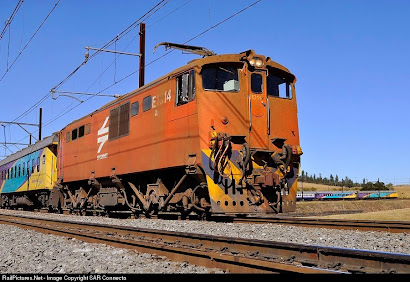 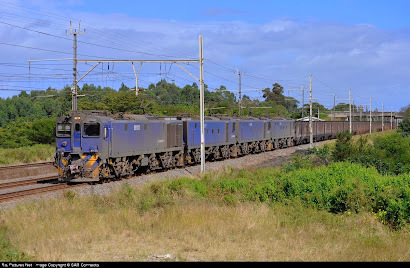 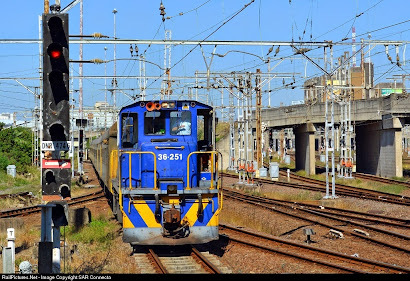 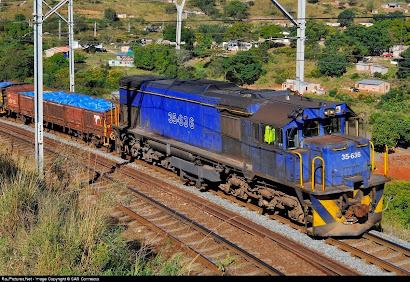 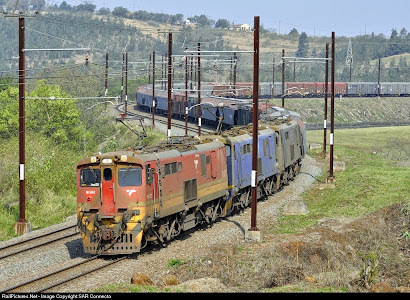 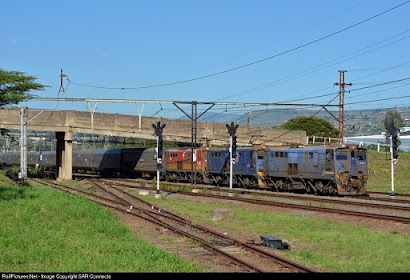 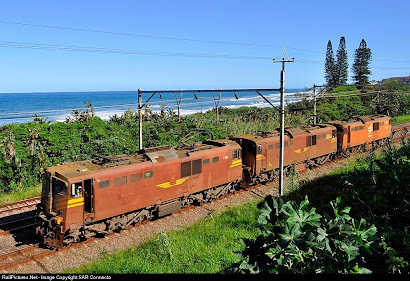 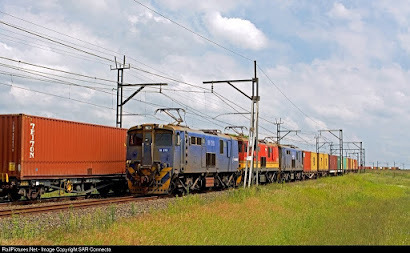 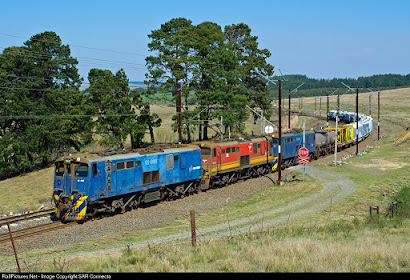 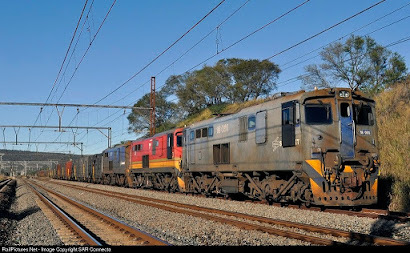 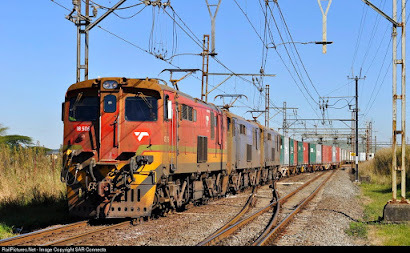 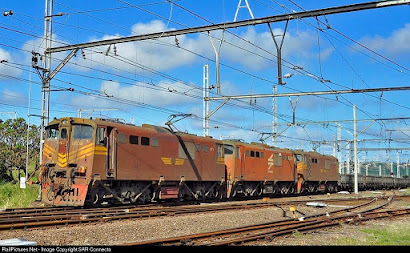 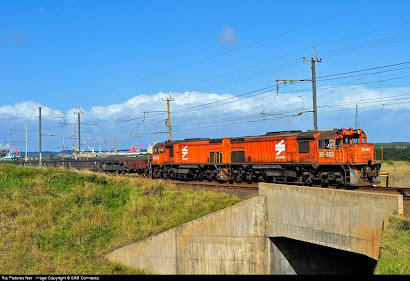 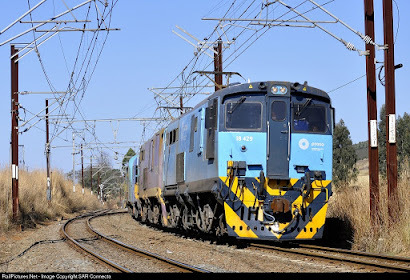 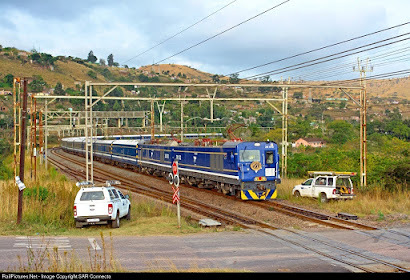 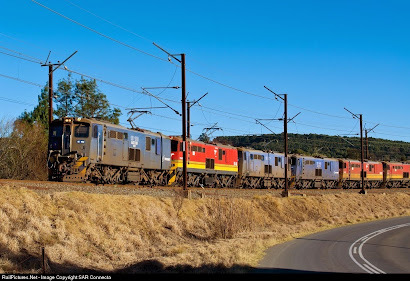 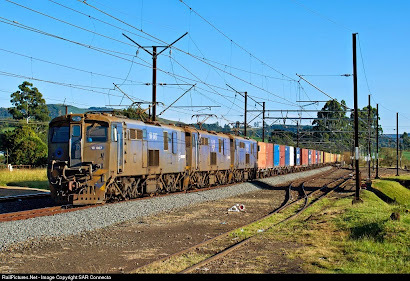 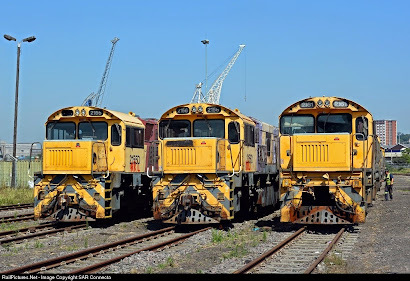 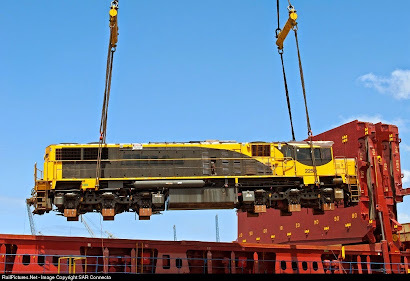 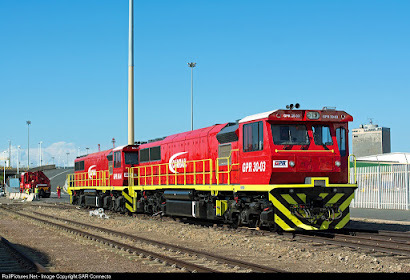 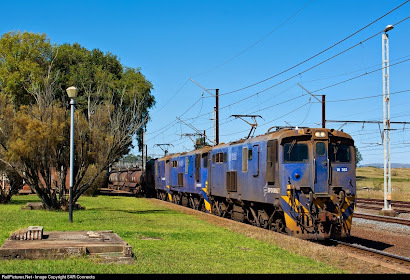 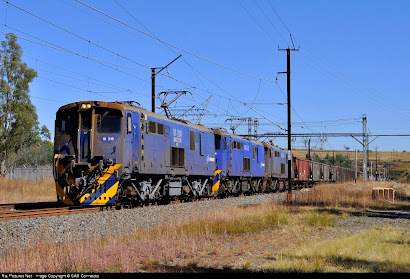 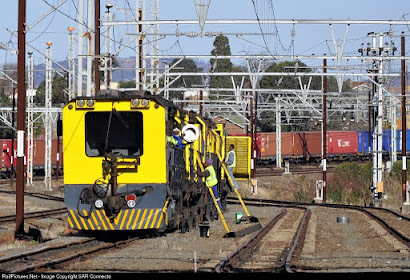 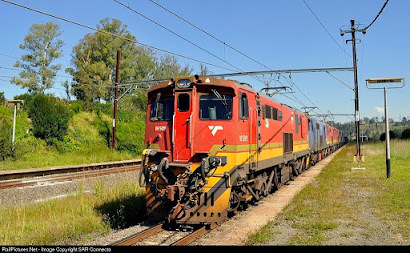 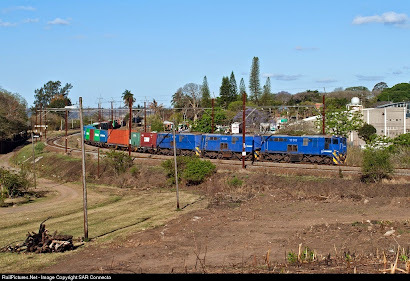 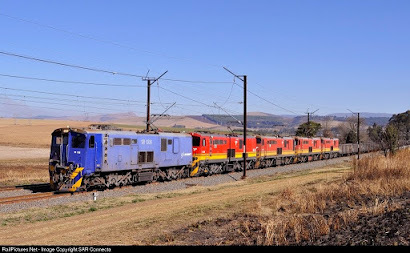 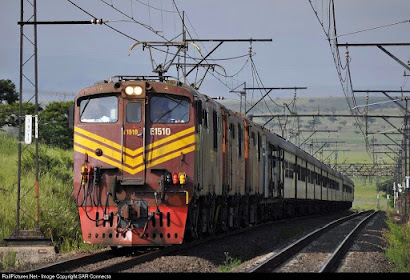 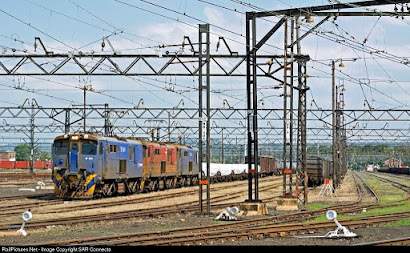 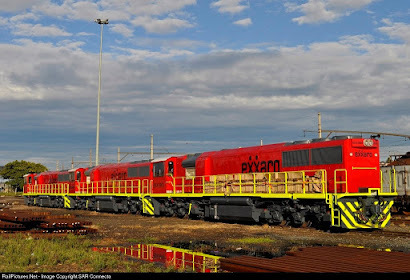 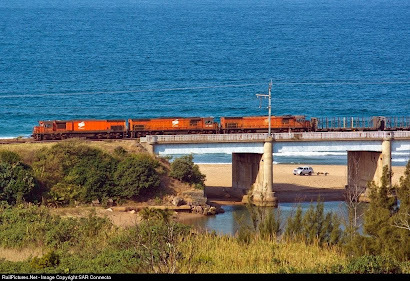 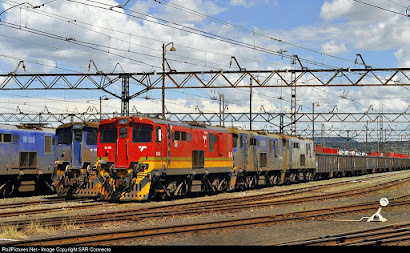 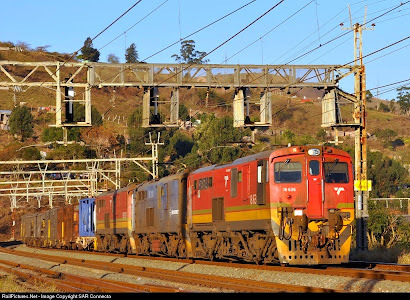 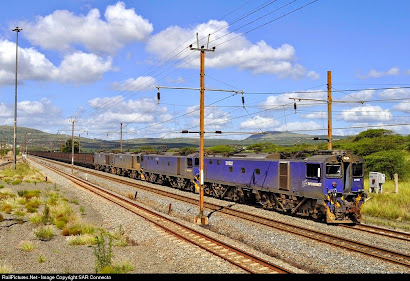 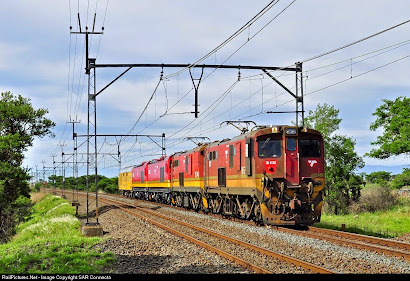 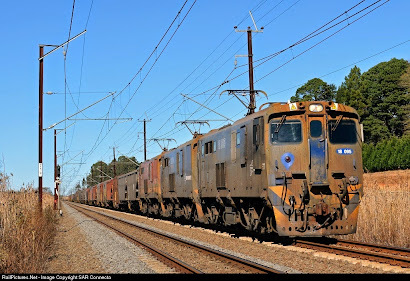 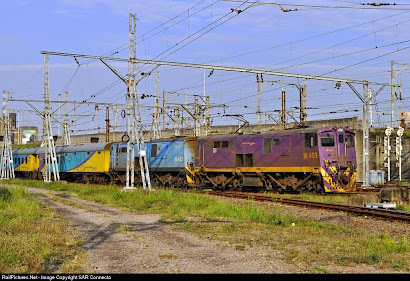 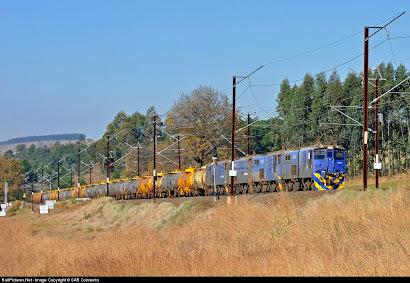 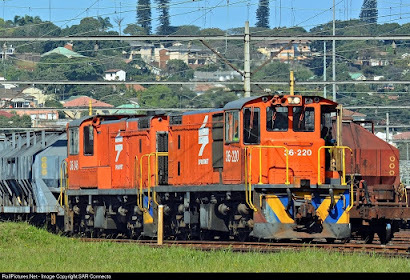 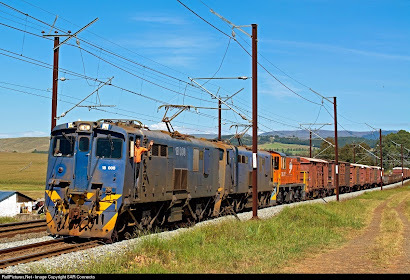 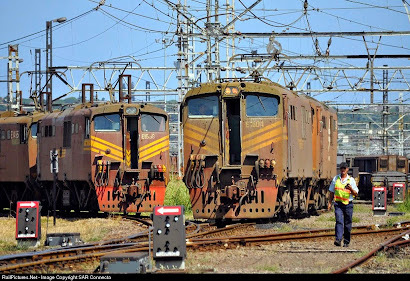 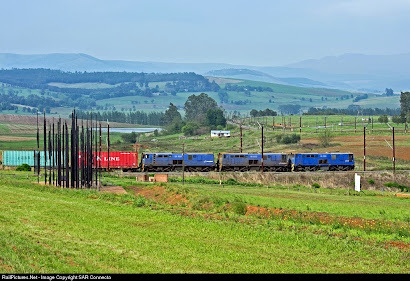 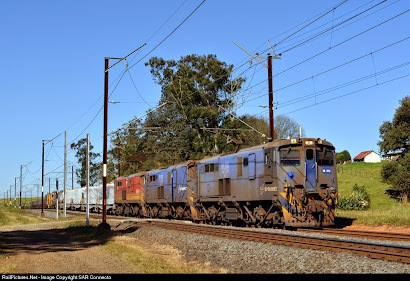 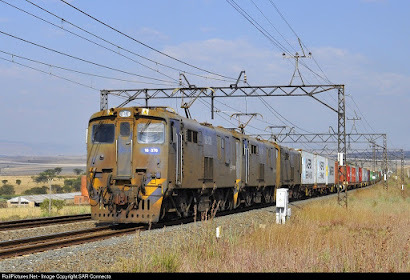 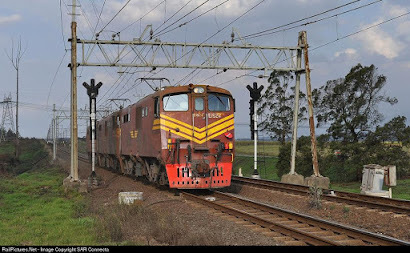 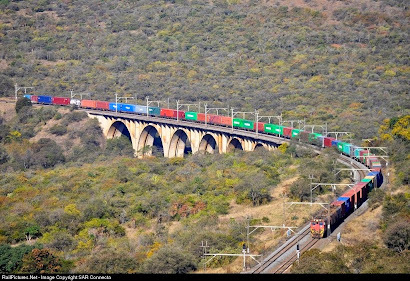 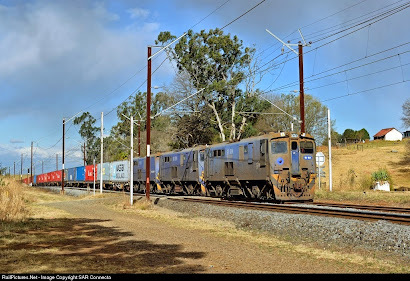 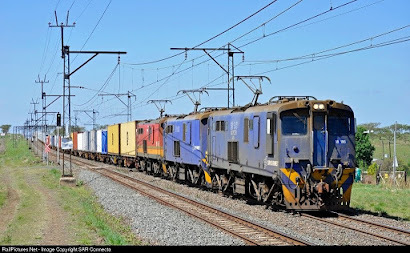 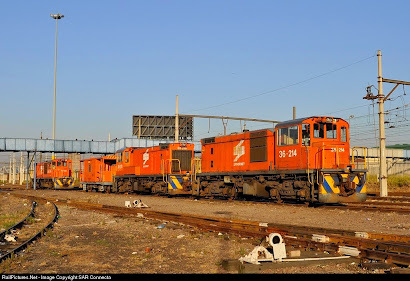 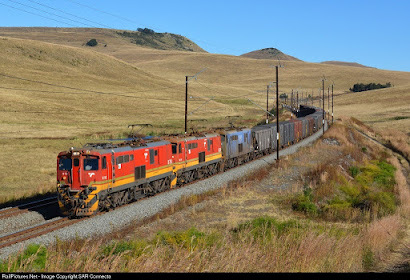 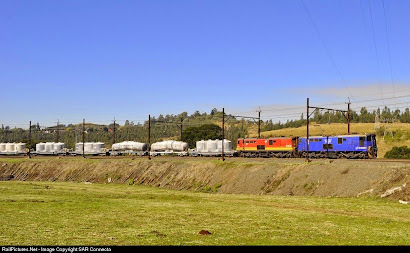 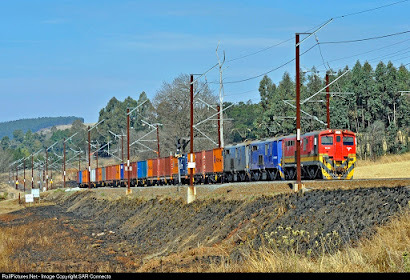 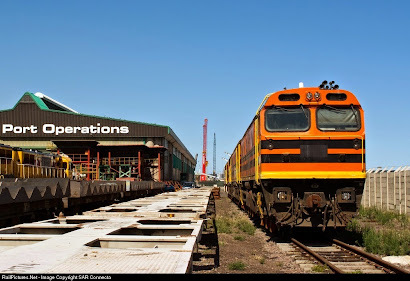 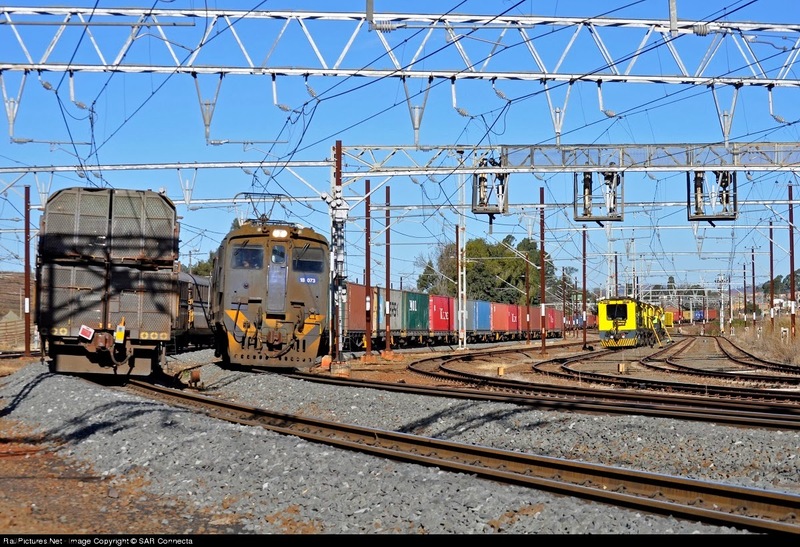 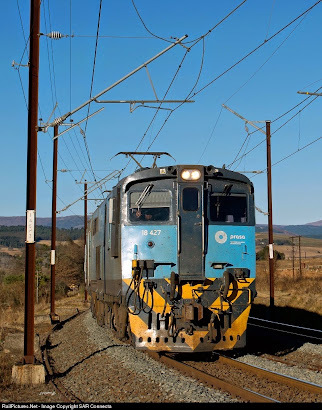 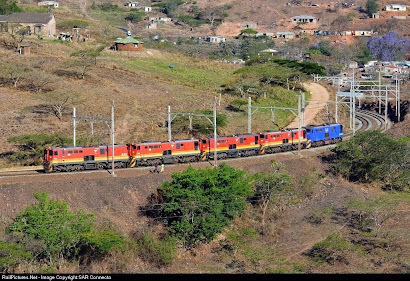 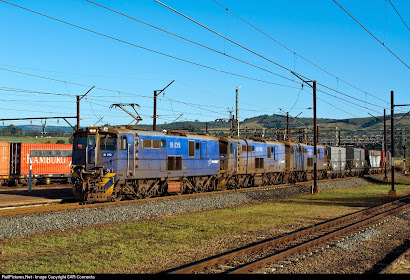 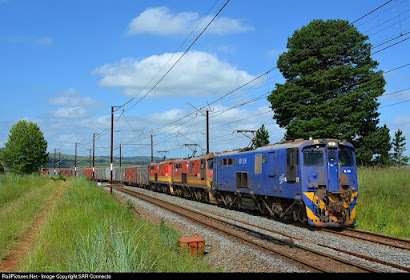 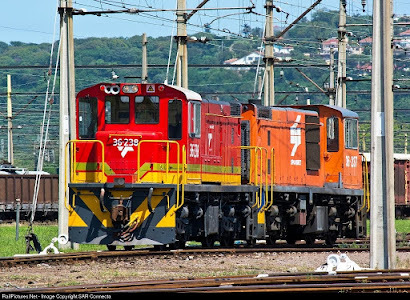 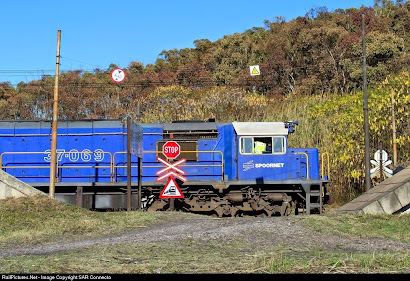 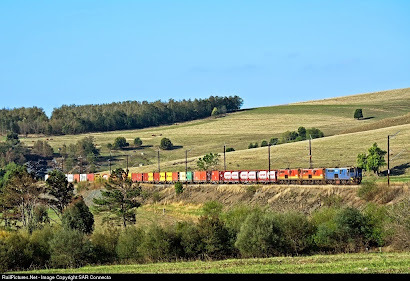 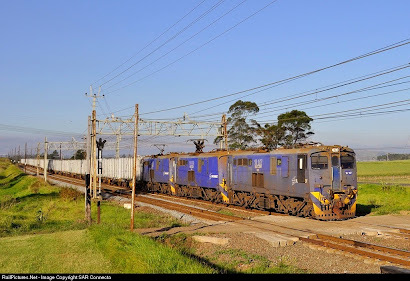 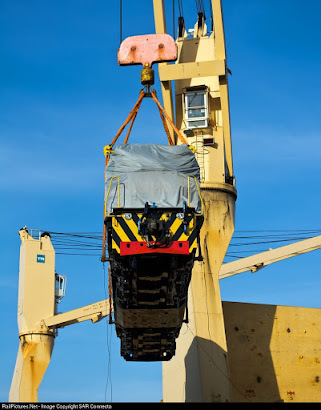 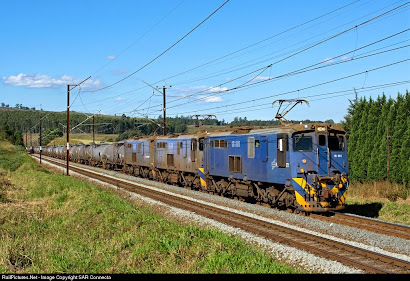 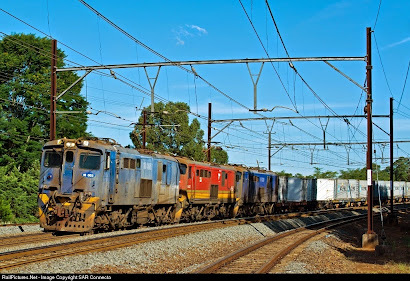 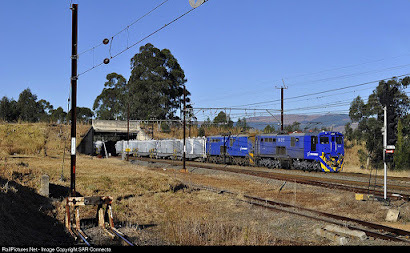 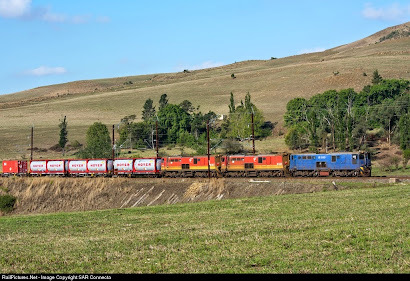 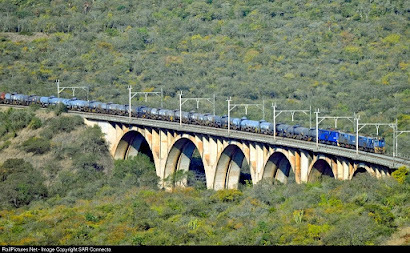 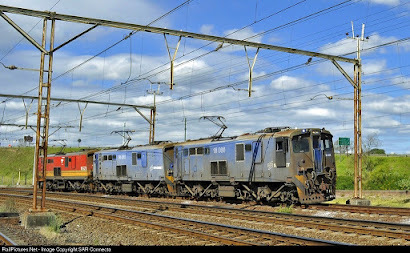 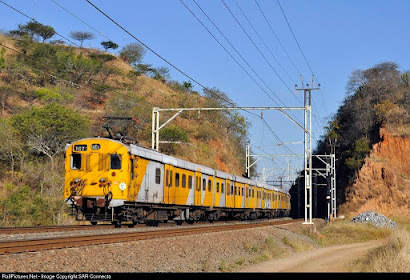 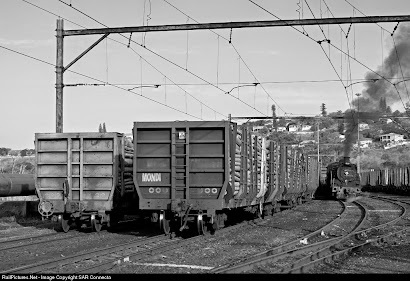 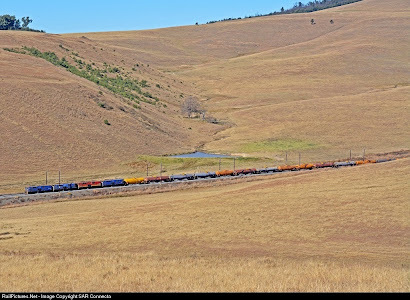 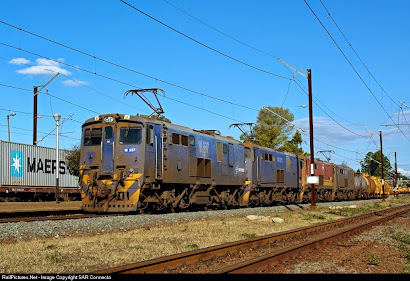 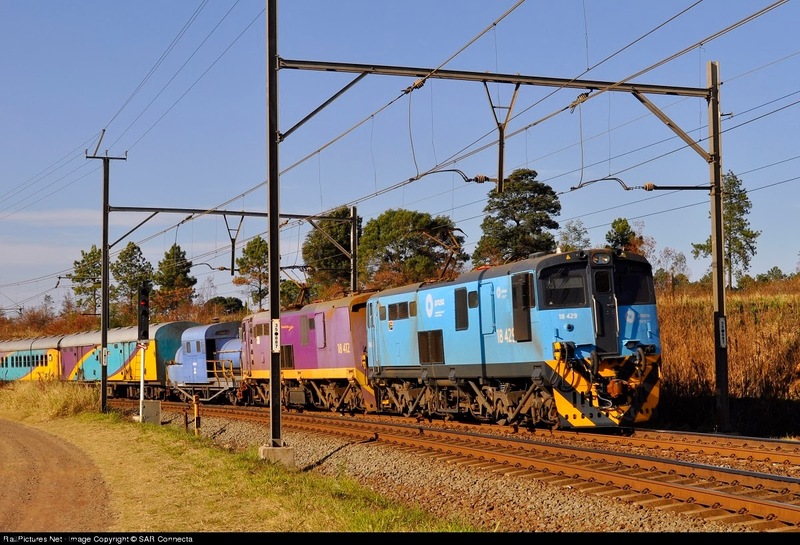 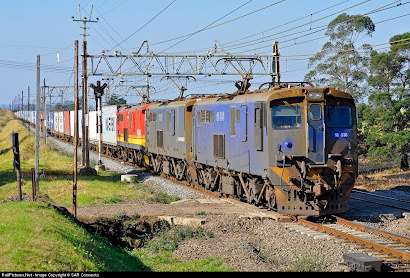 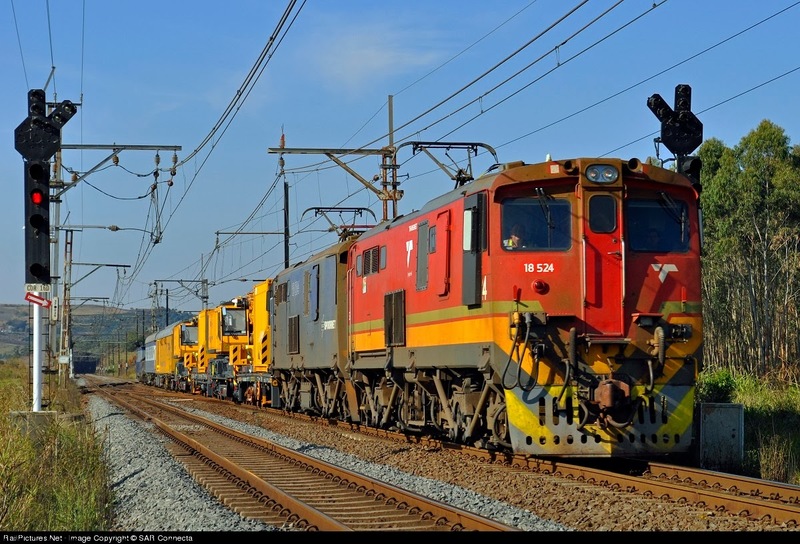 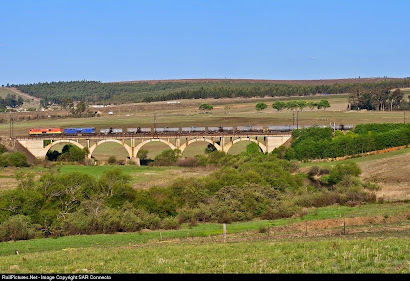 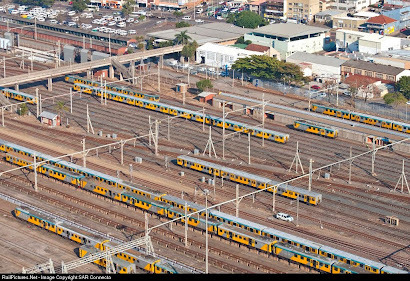 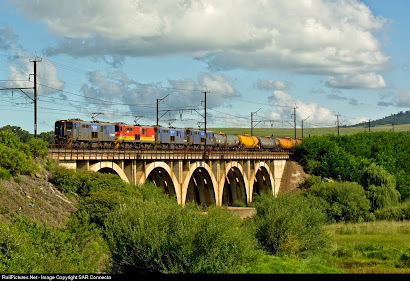 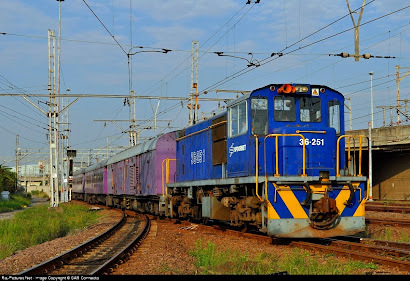 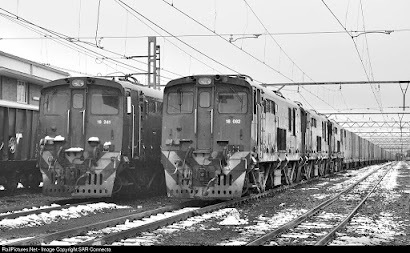 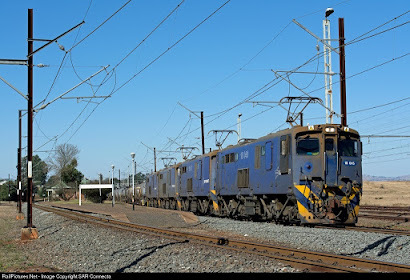 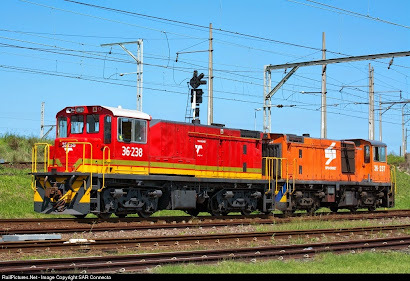 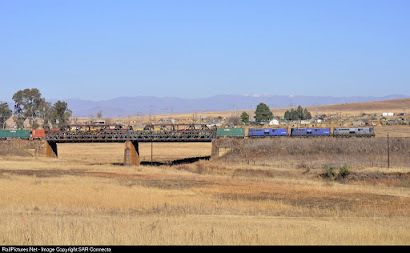 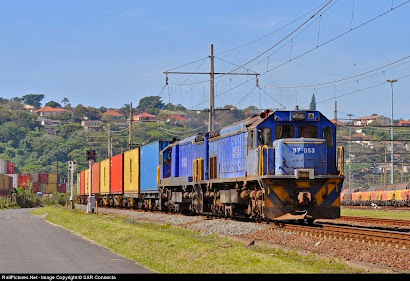 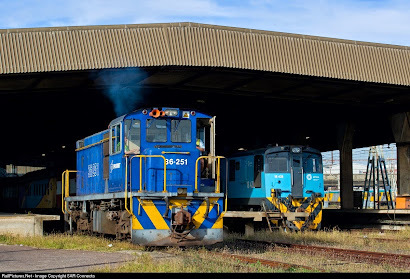 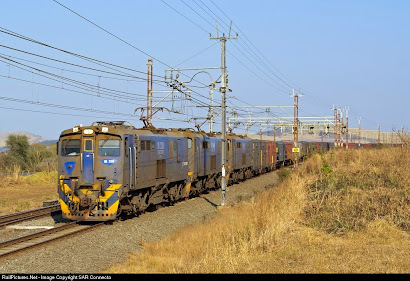 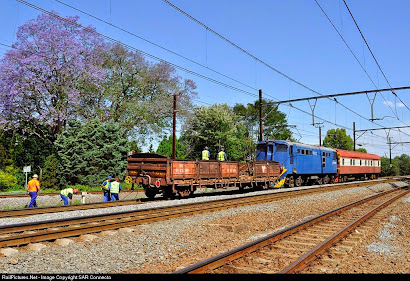 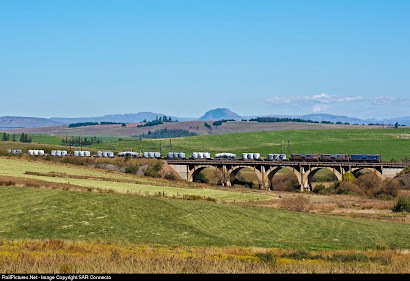 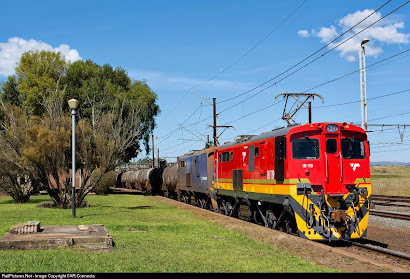 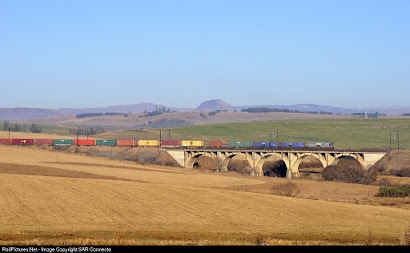 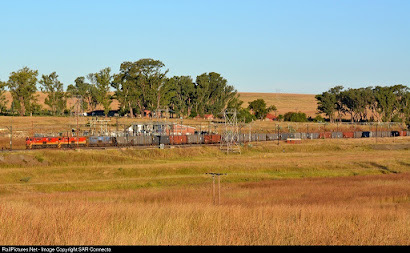 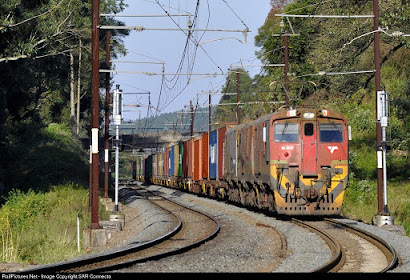 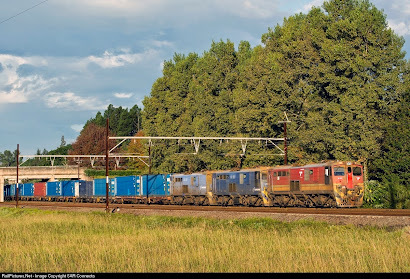 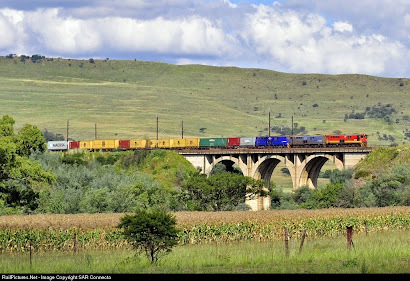 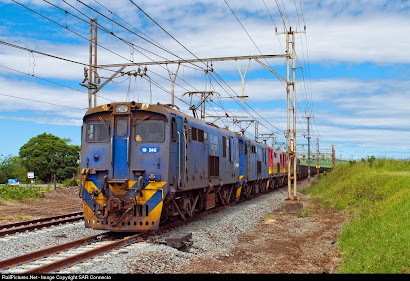 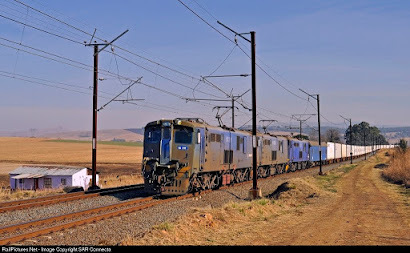 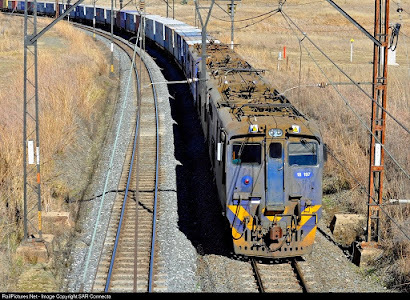 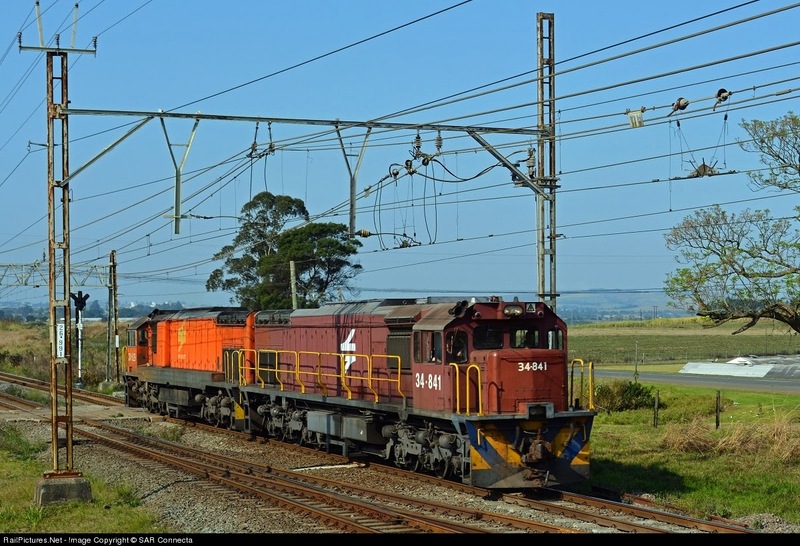 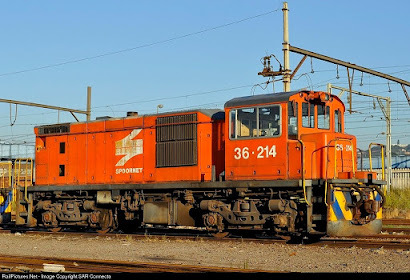 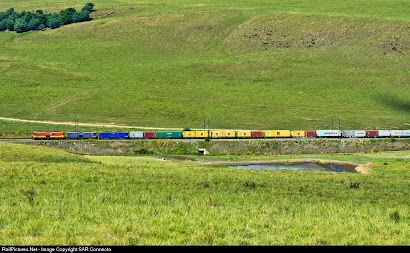 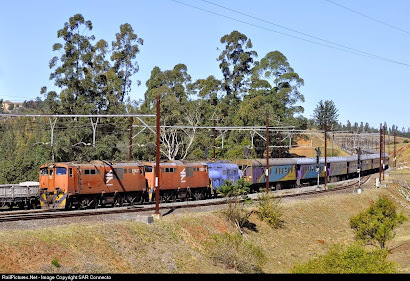 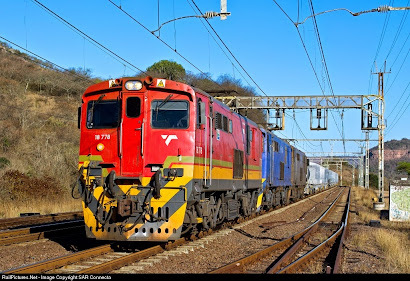 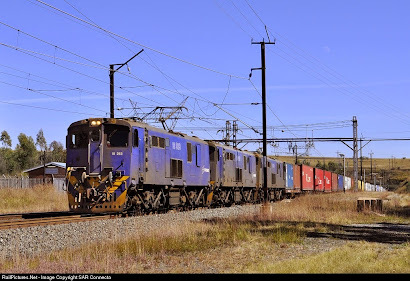 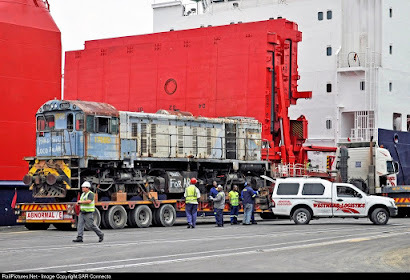 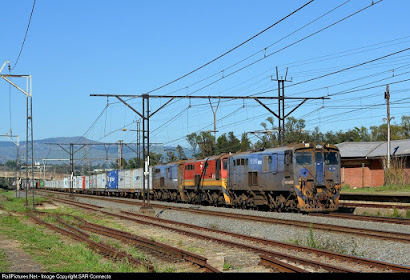 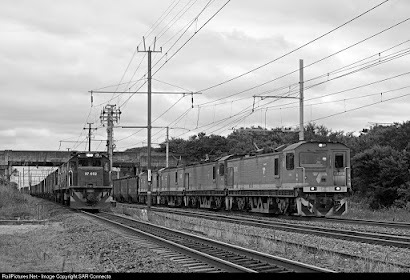 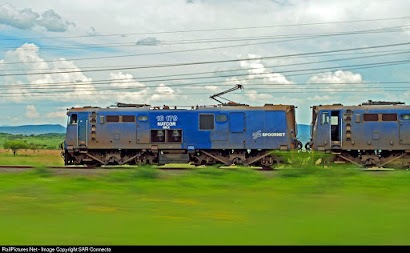 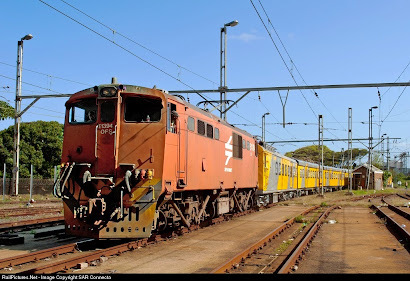 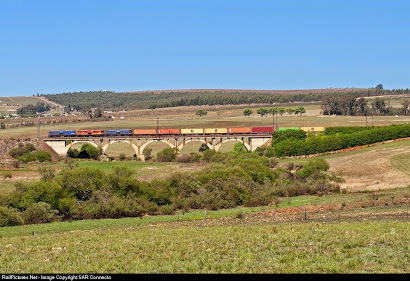 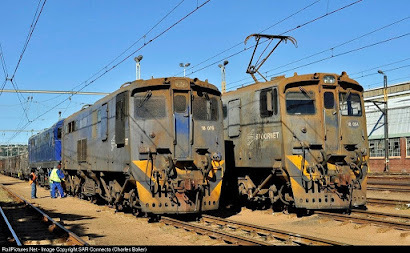 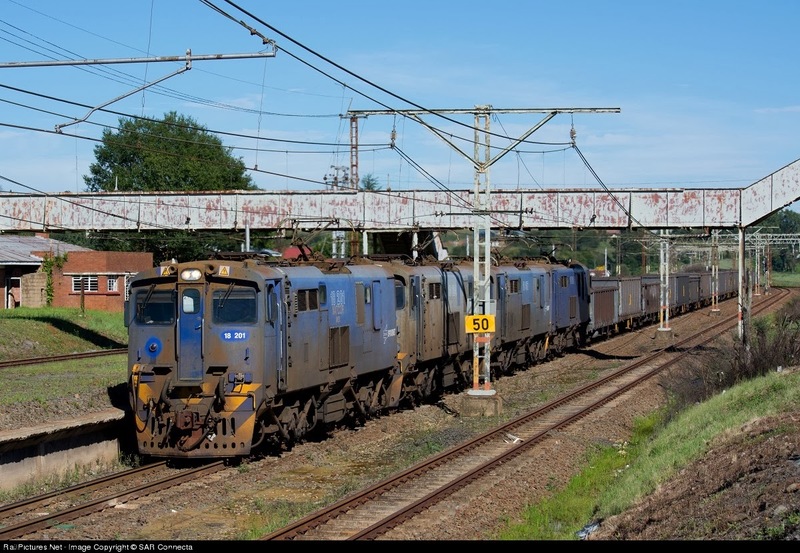 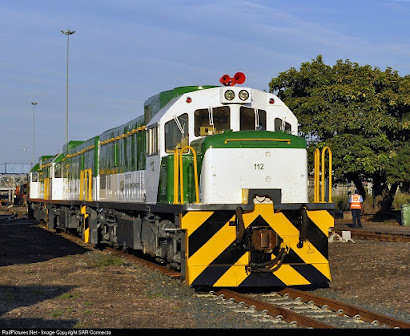 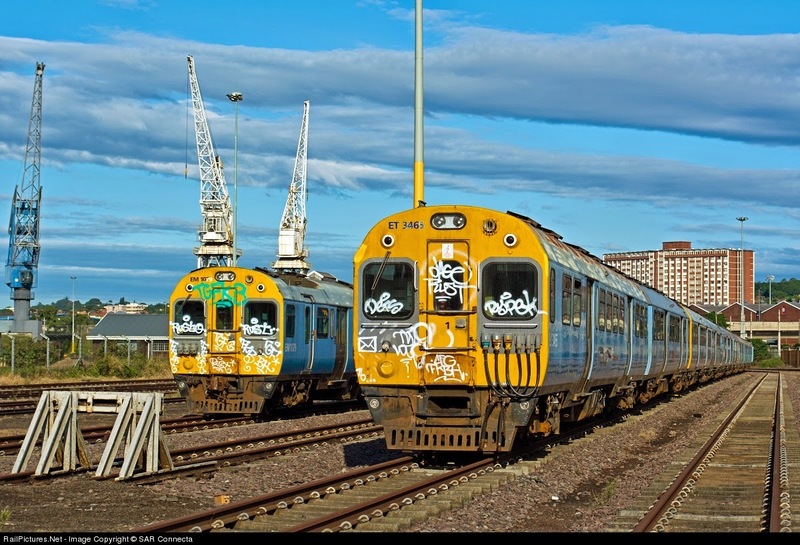 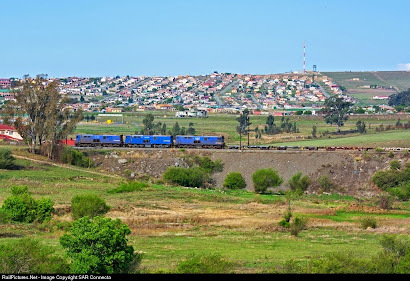 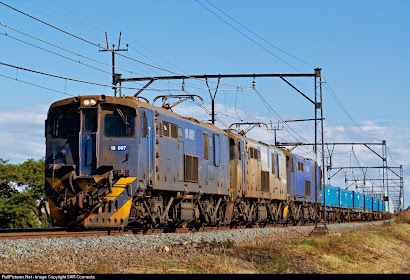 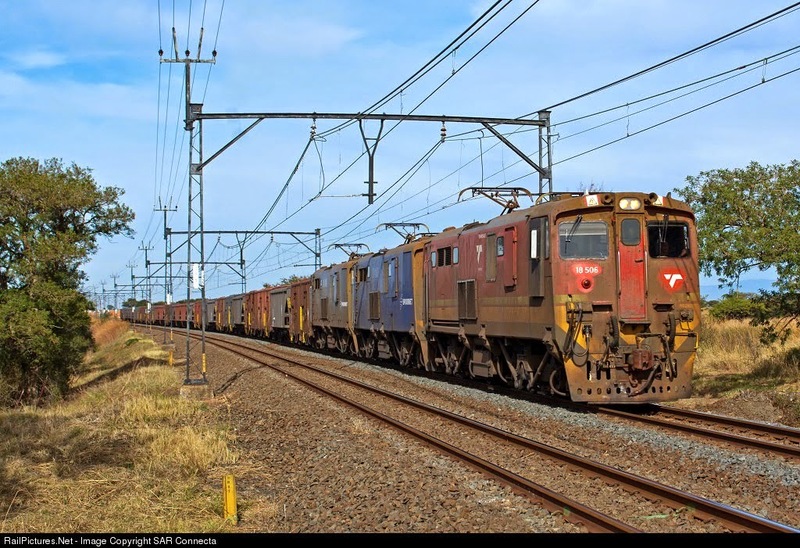 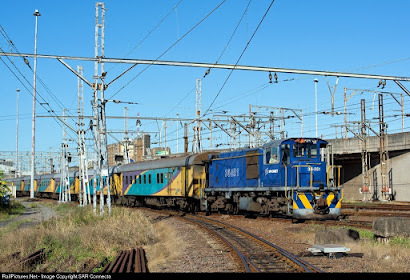 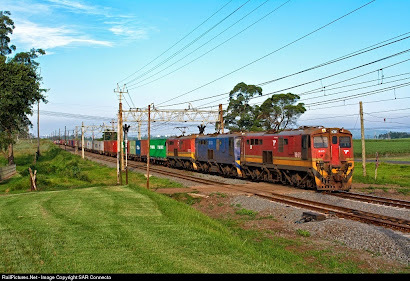 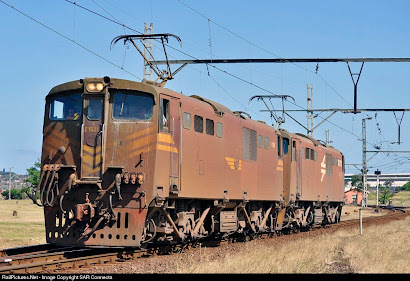 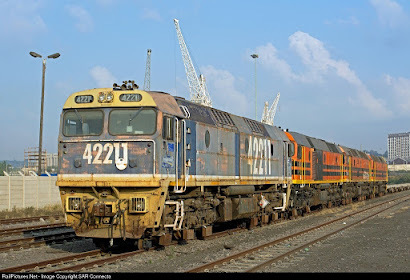 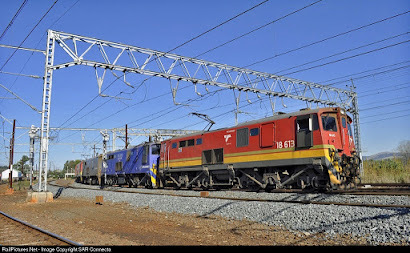 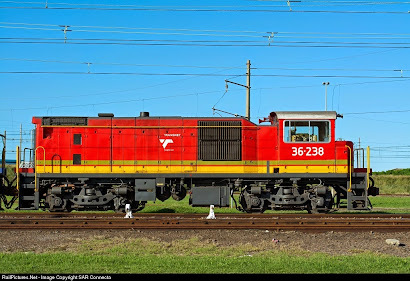 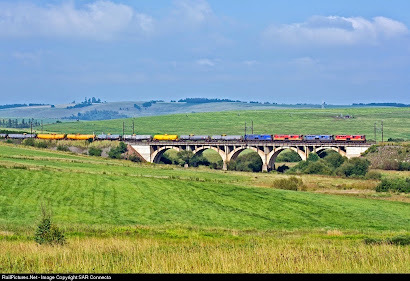 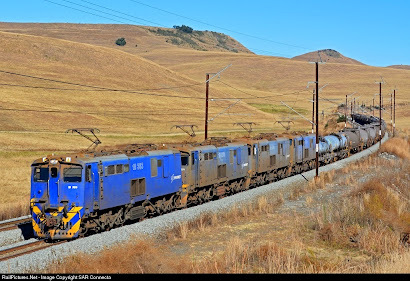 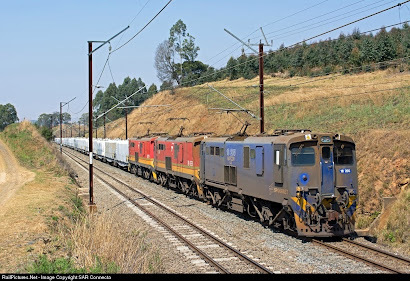 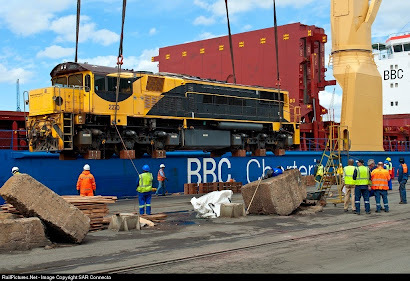 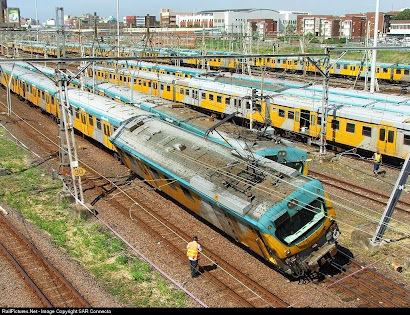 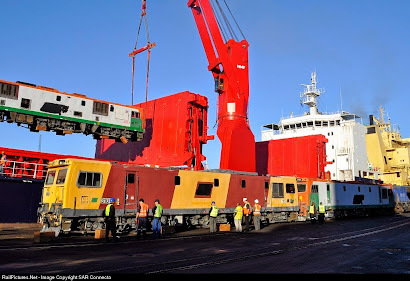 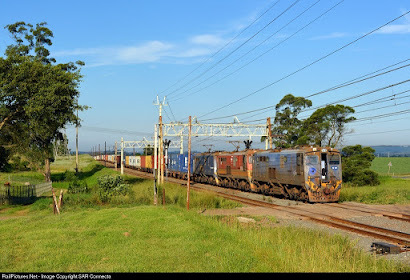 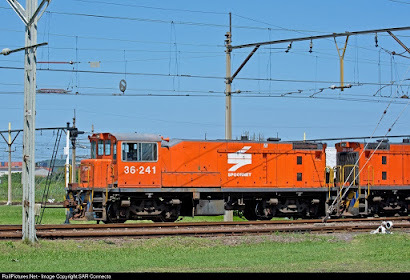 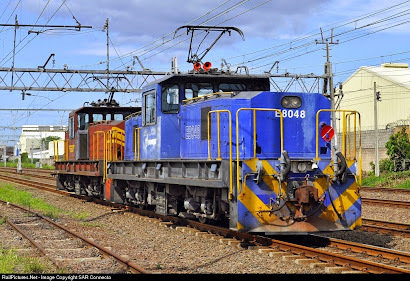 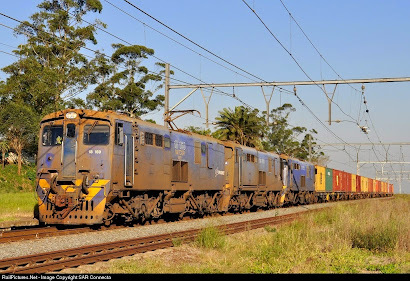 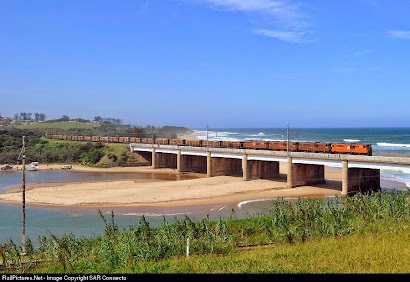 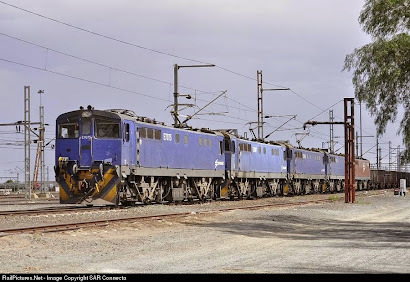 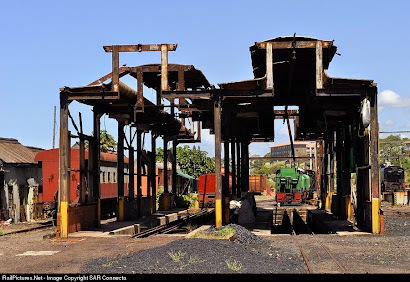 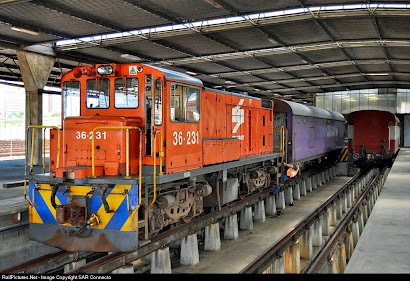 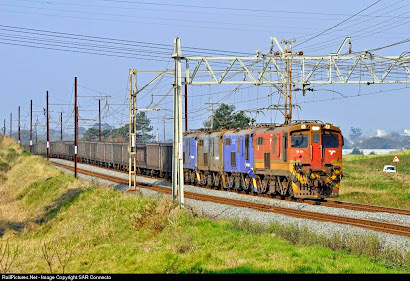 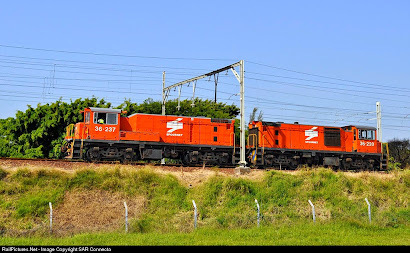 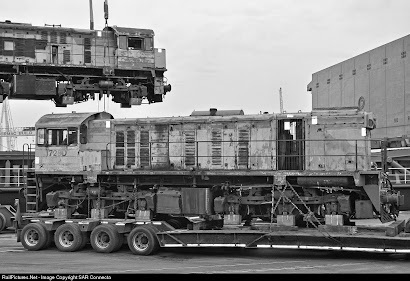 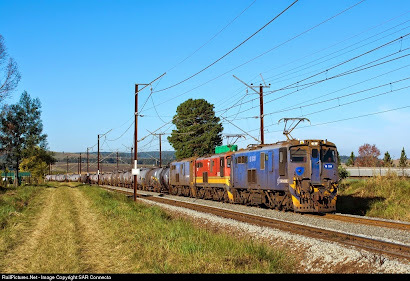 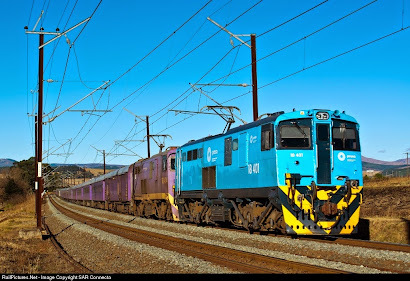 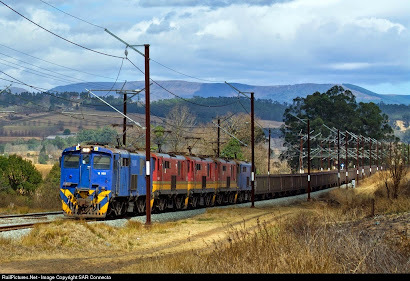 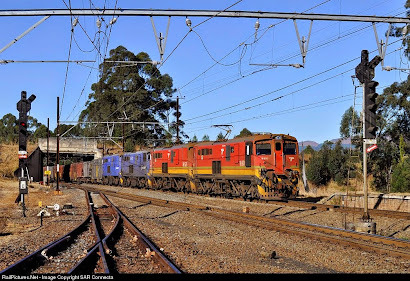 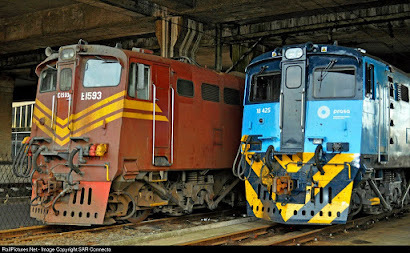 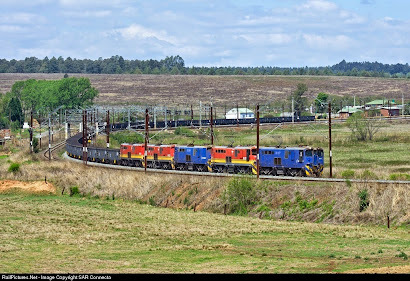 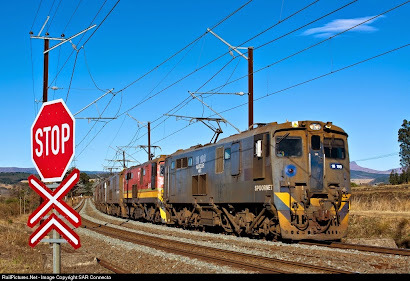 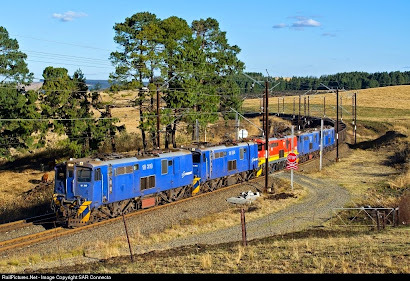 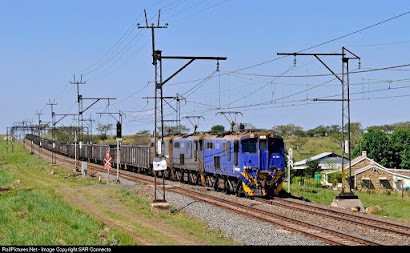 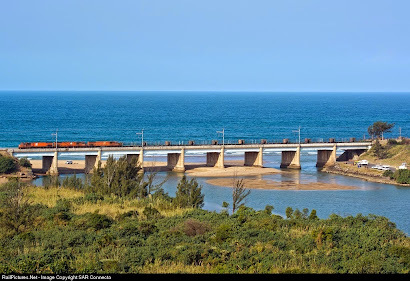 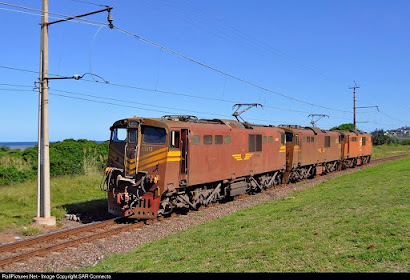 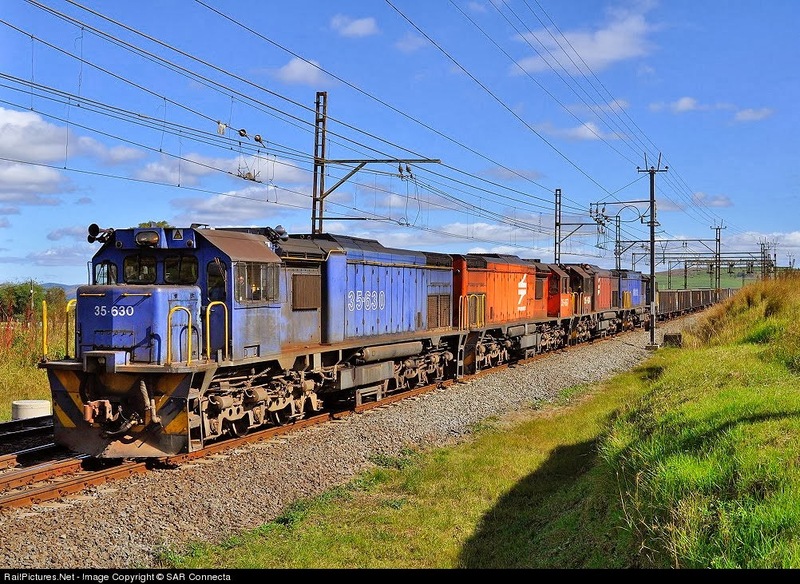 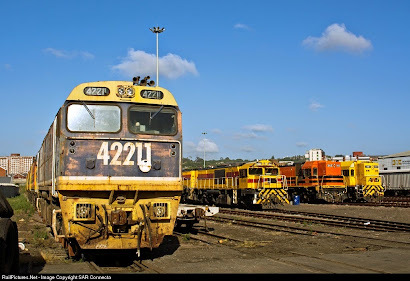 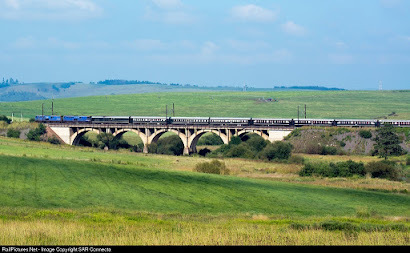 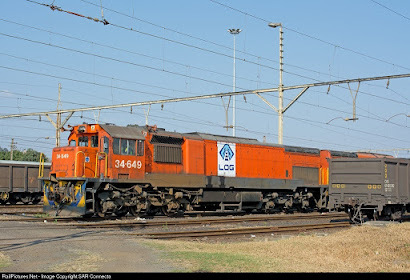 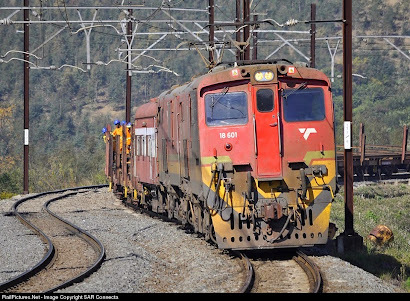 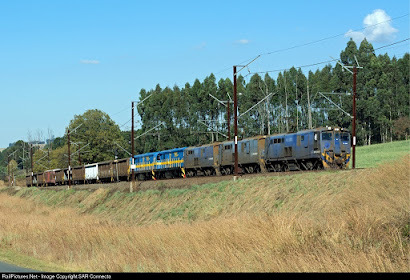 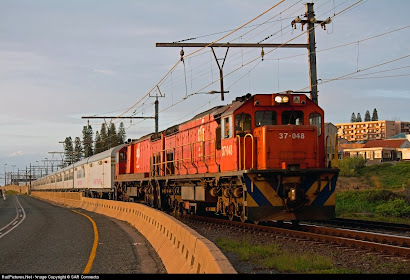 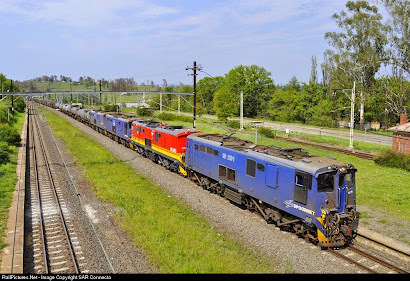 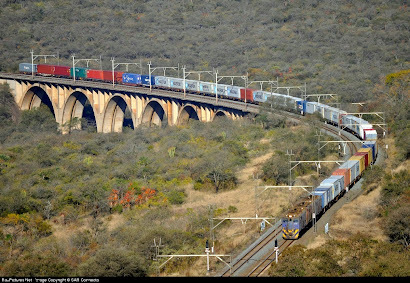 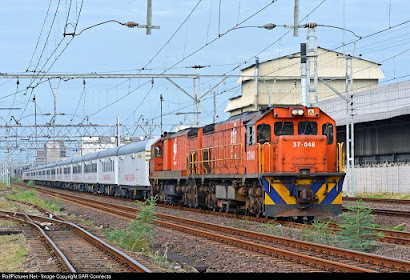 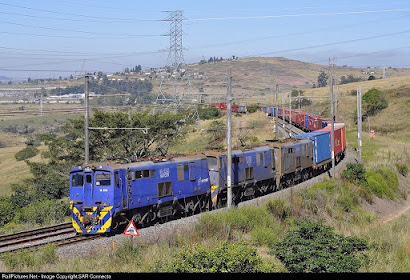 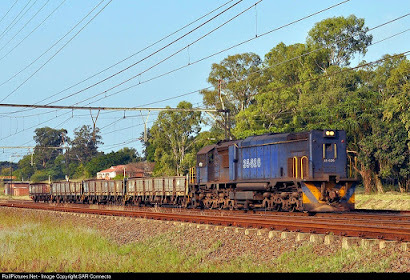 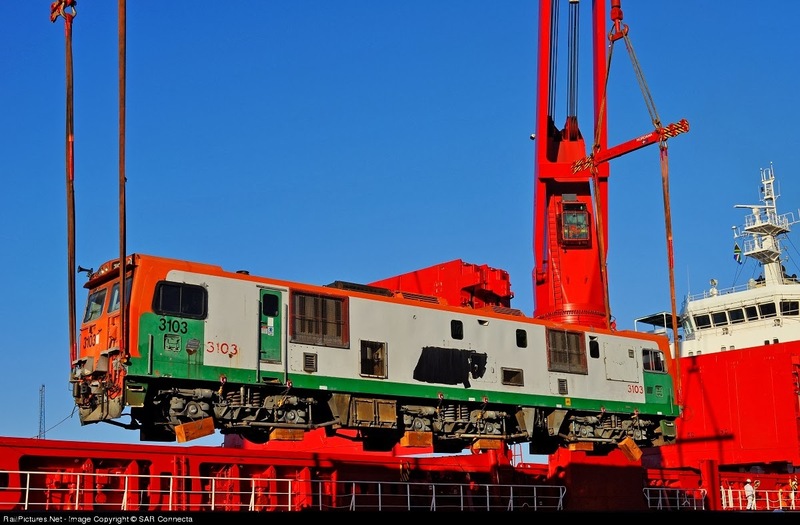 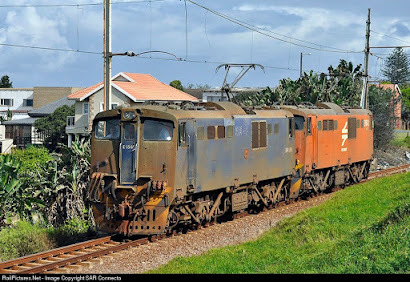 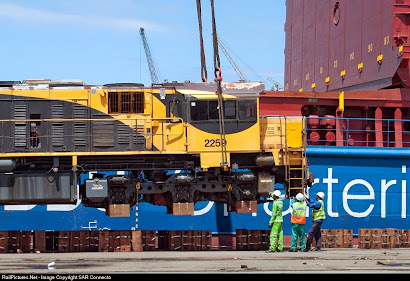 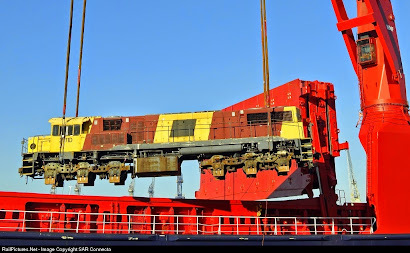 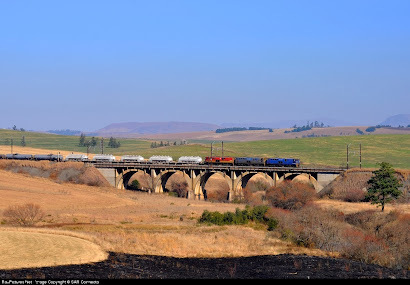 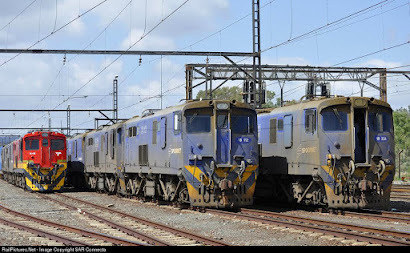 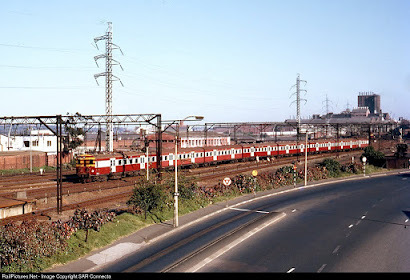 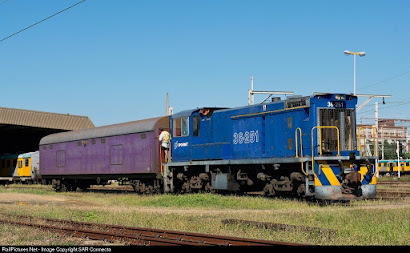 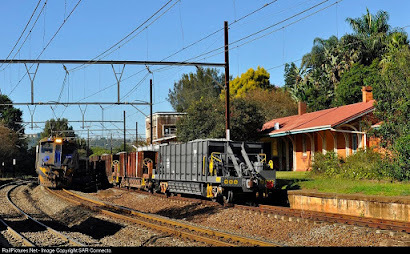 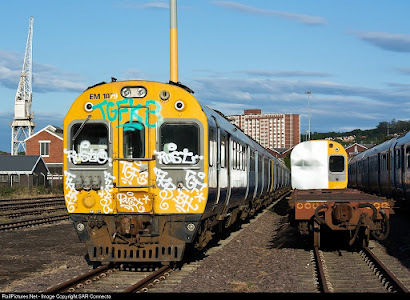 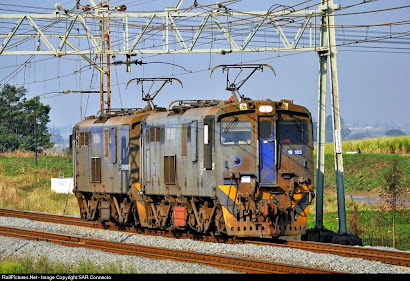 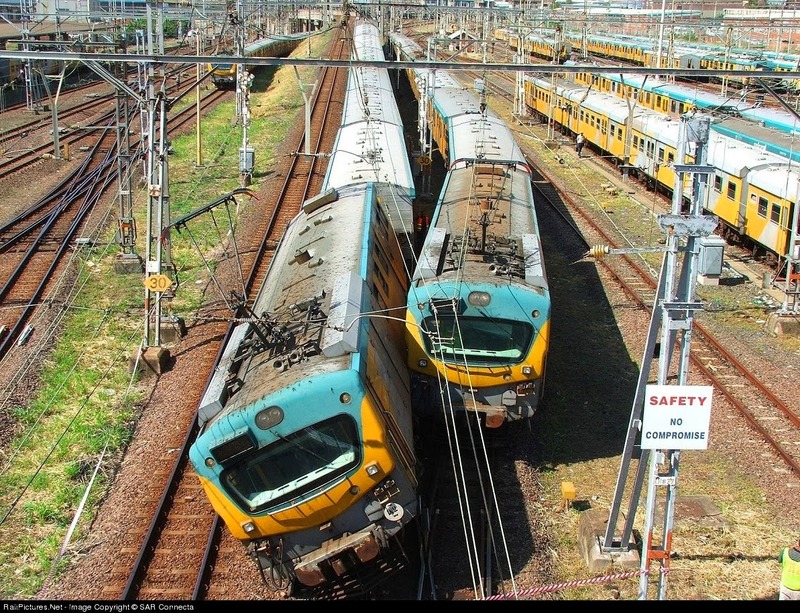 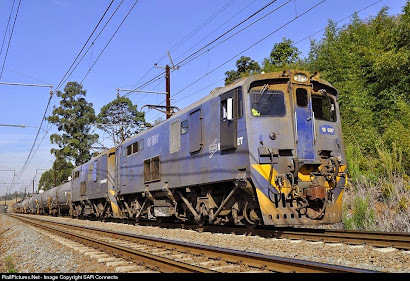 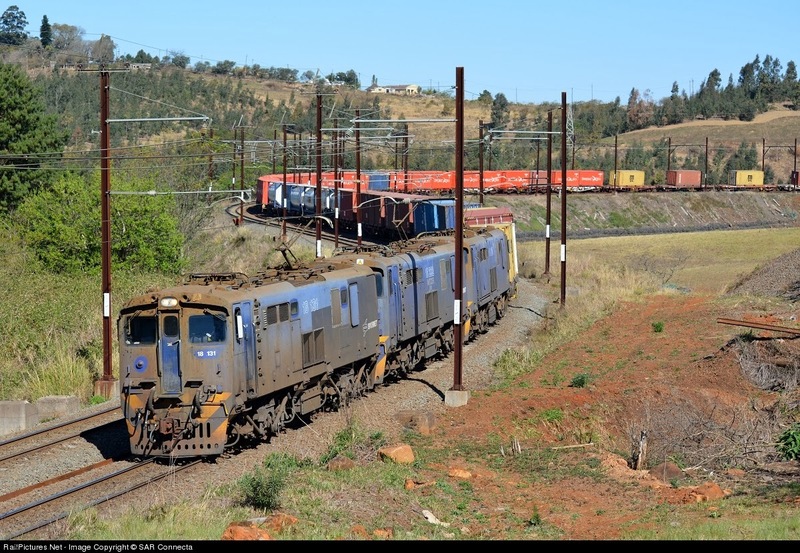 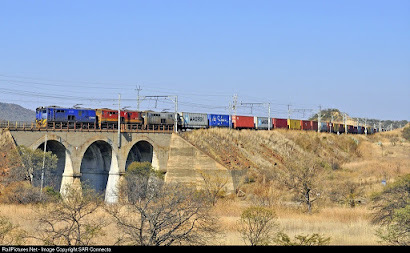 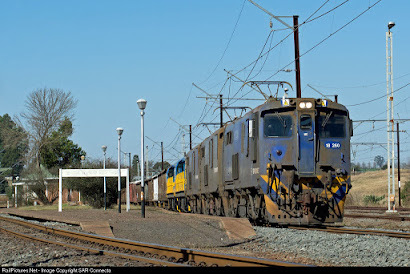 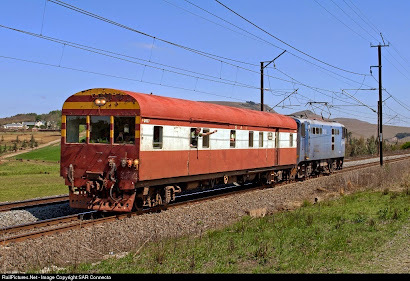 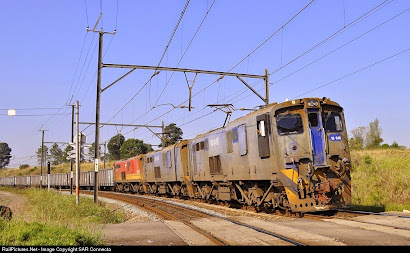 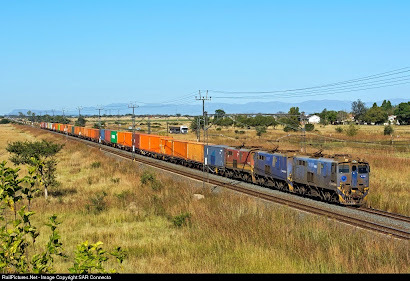 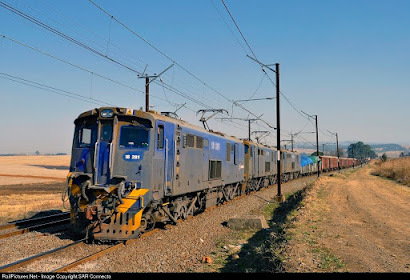 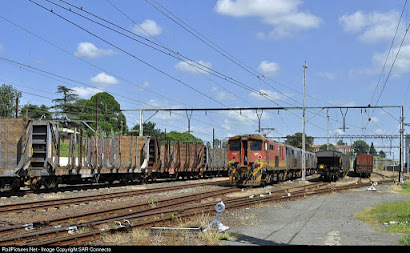 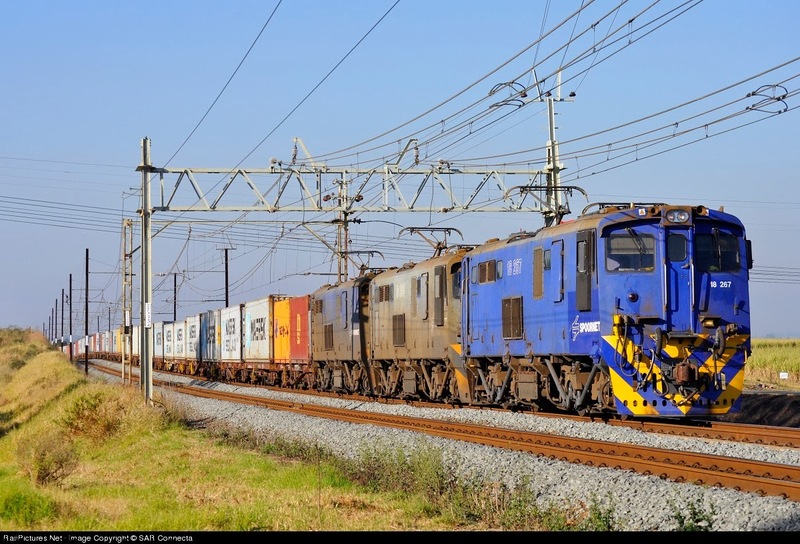 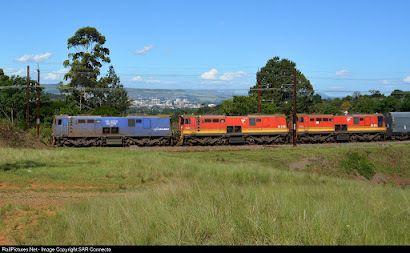 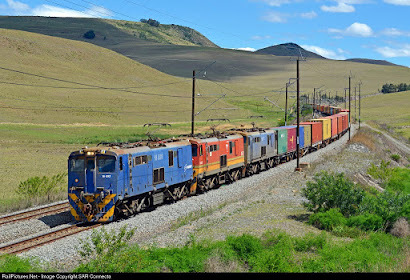 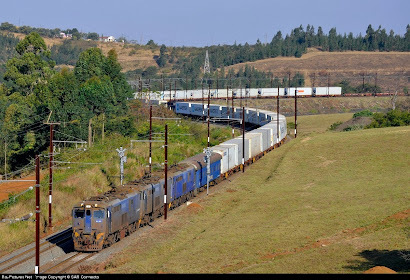 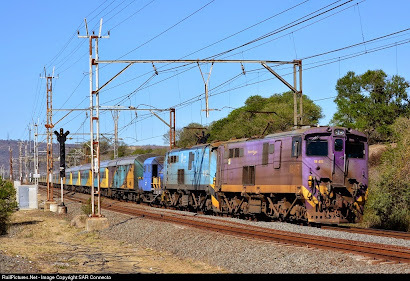 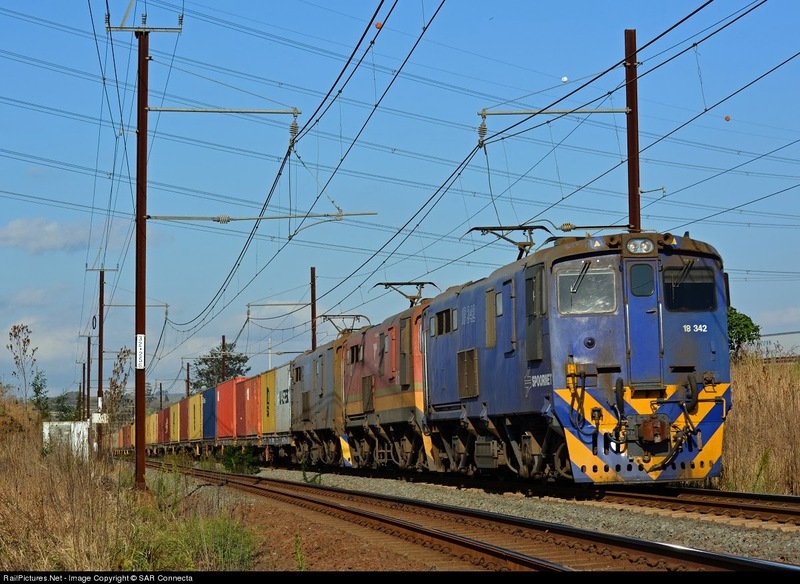 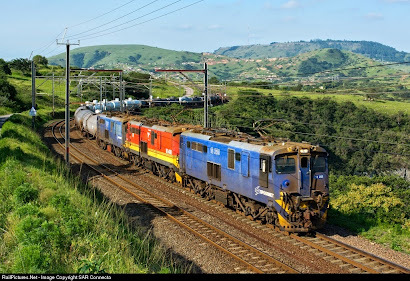 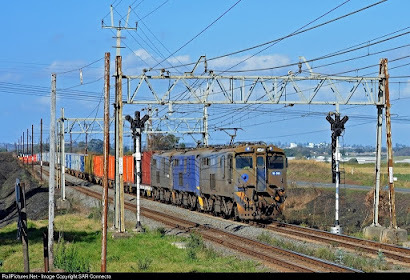 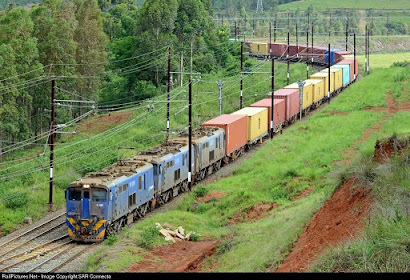 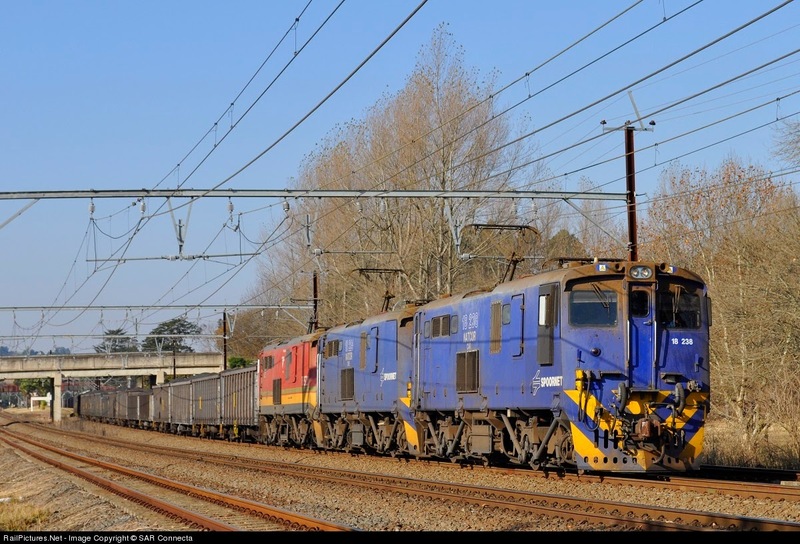 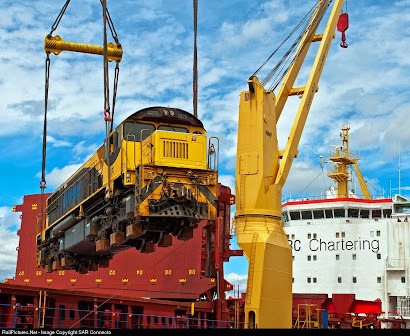 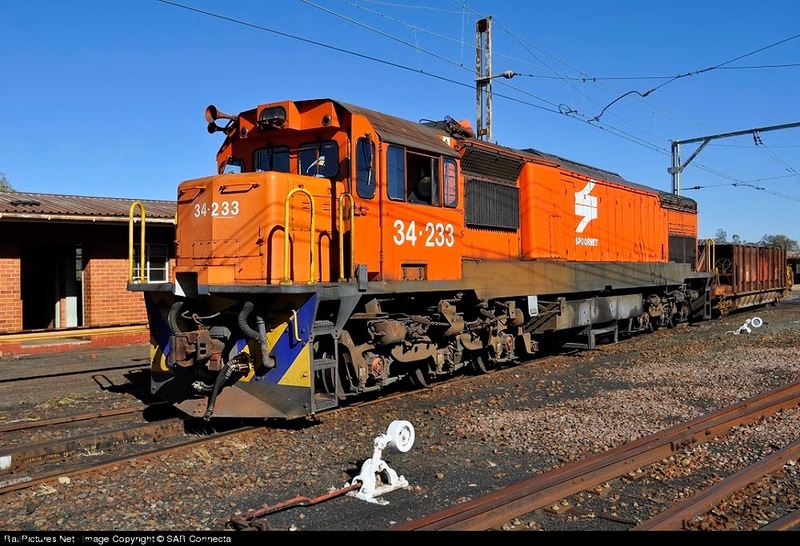 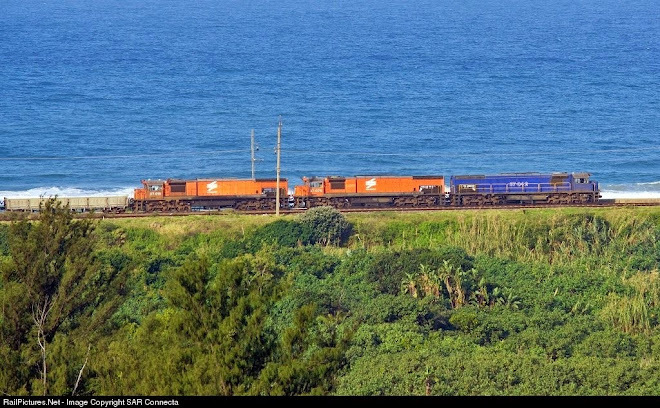 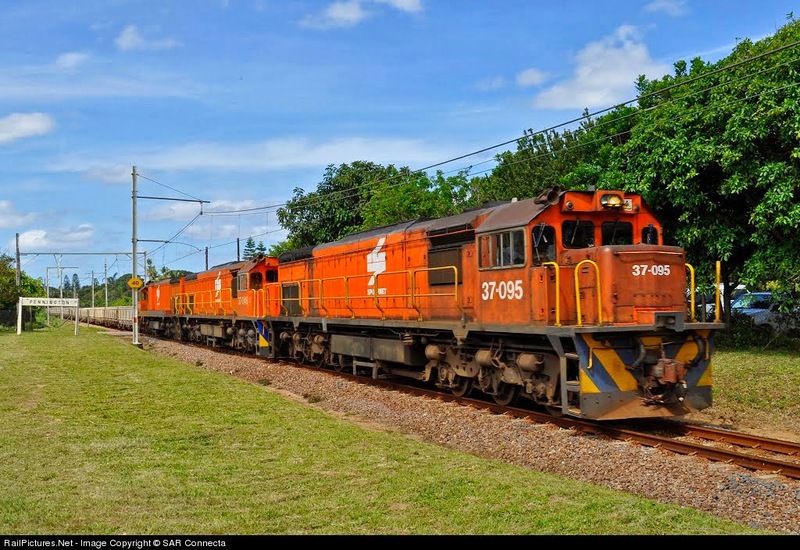 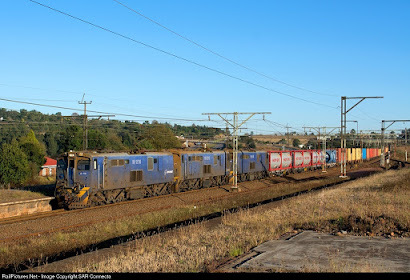 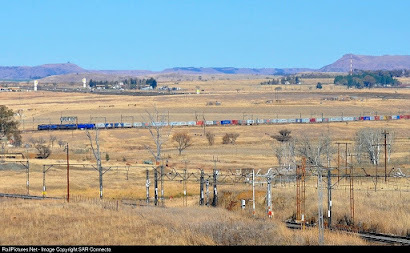 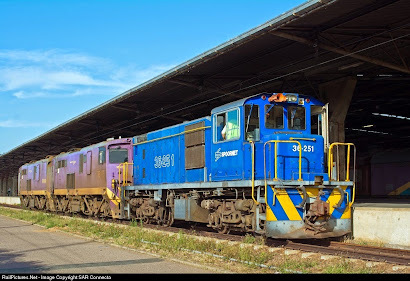 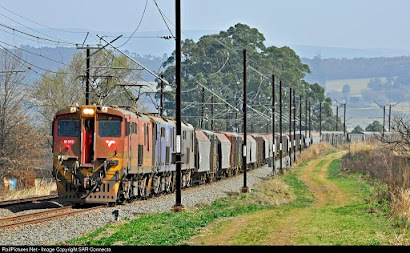 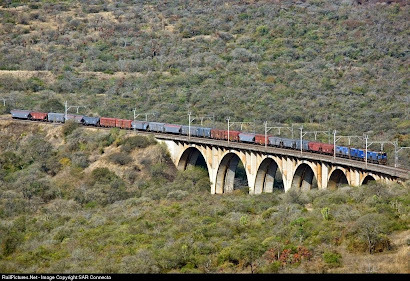 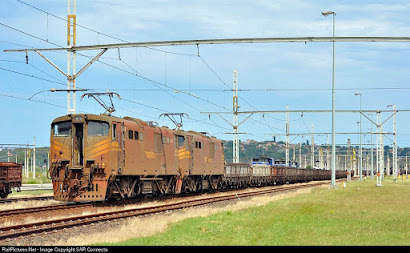 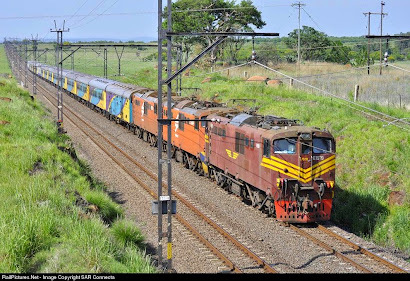 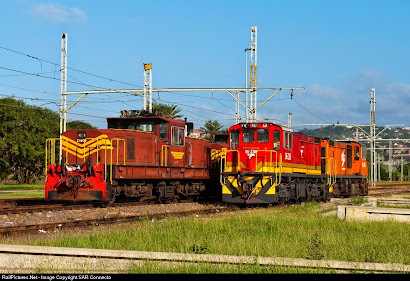 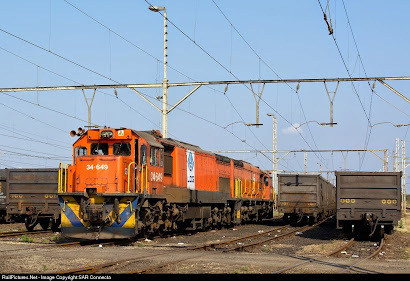 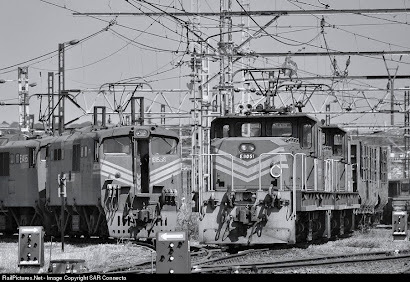 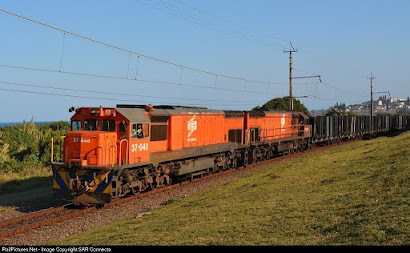 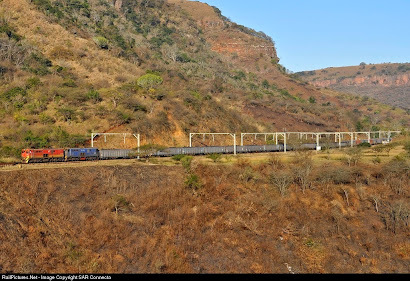 SAR CONNECTA: ‎18-102 / 18-245 / 18-624 / 18-646 & 65 X empty CAR Wagons (I counted them) - Cato Ridge (26th April 2012). 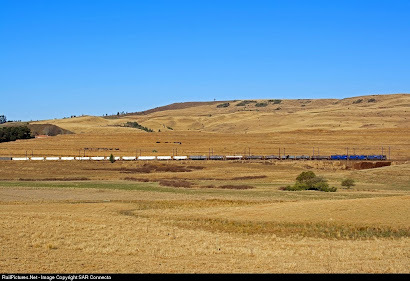 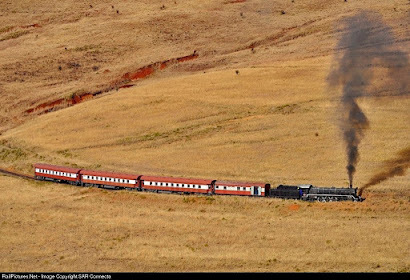 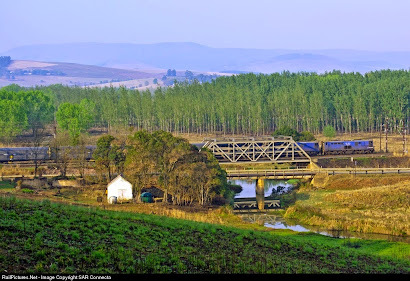 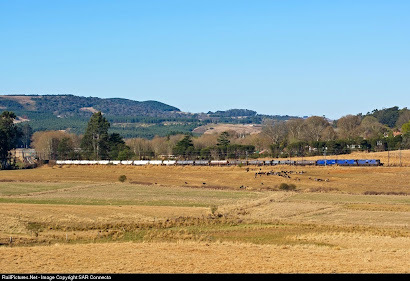 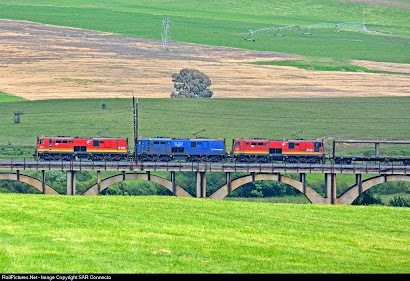 ‎18-102 / 18-245 / 18-624 / 18-646 & 65 X empty CAR Wagons (I counted them) - Cato Ridge (26th April 2012). 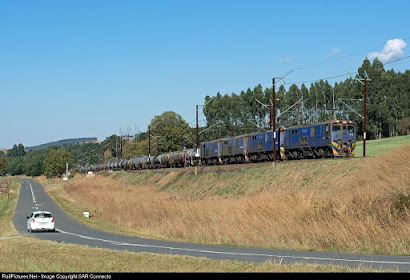 ‎35-629 / 35-621 Cato Ridge (24th April 2012). 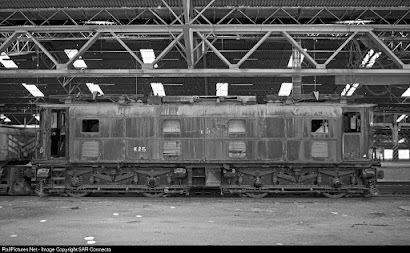 36-218 Maydon Wharf (21st April 2012). 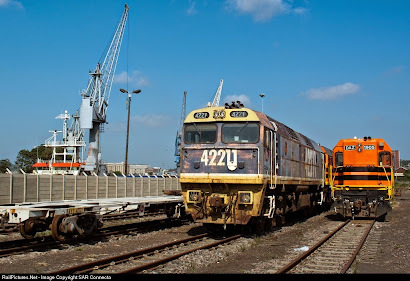 36-214 Maydon Wharf (21st April 2012). 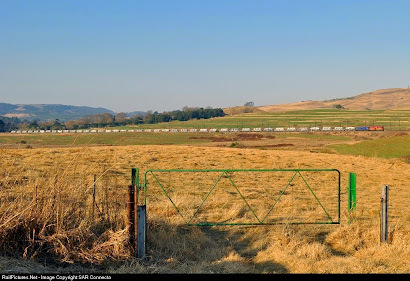 36-227 / 36-230 Cato Ridge (19th April 2012). 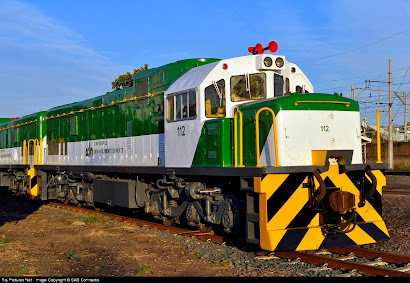 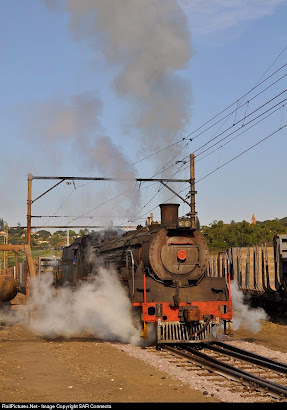 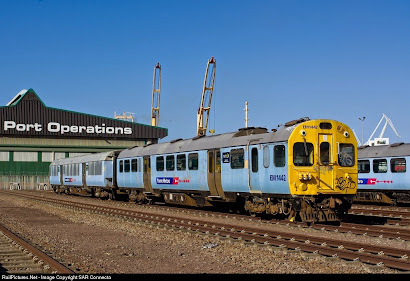 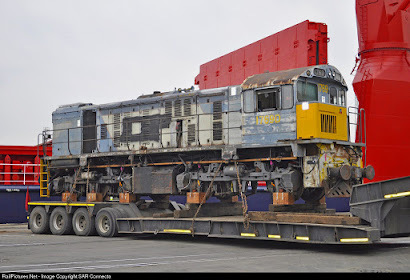 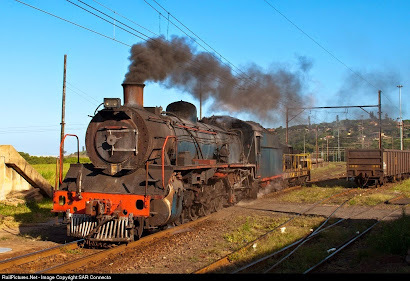 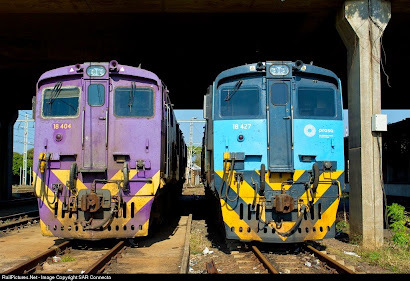 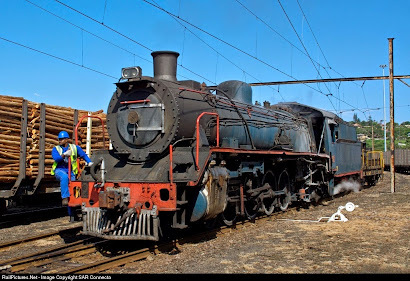 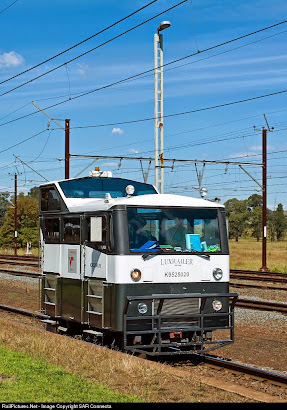 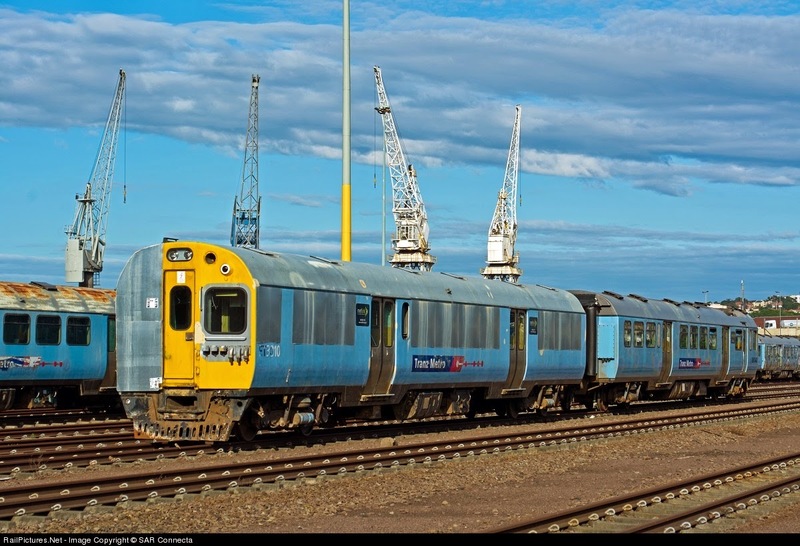 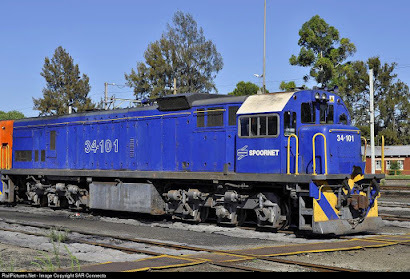 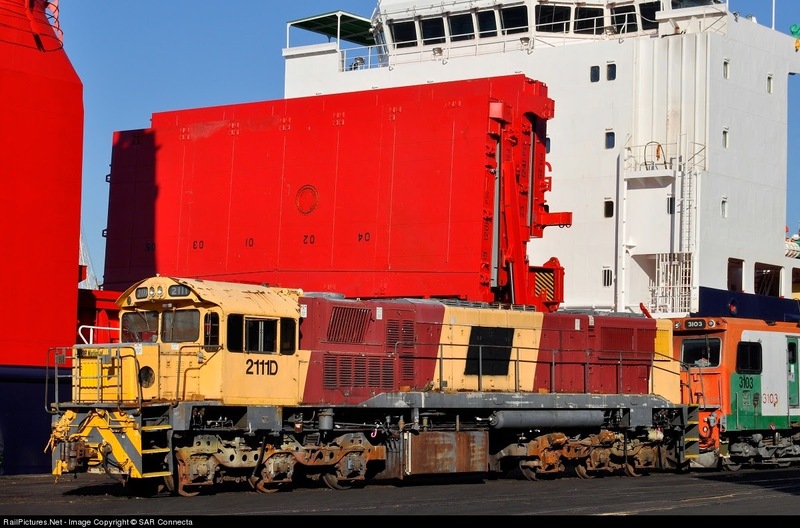 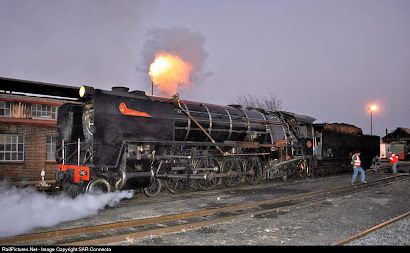 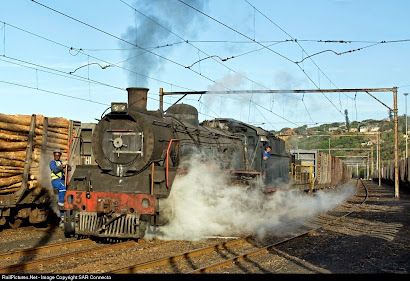 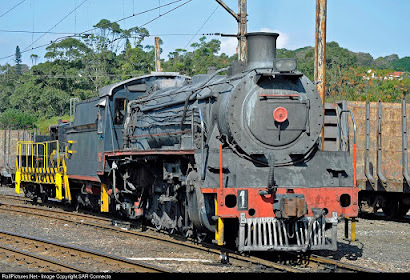 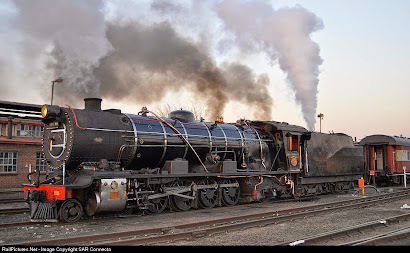 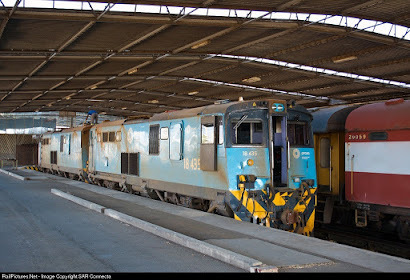 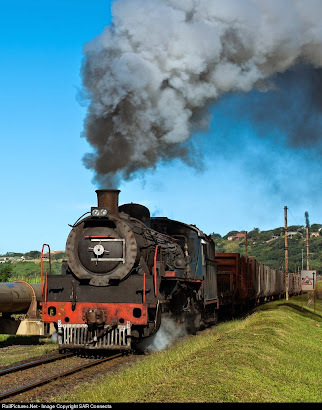 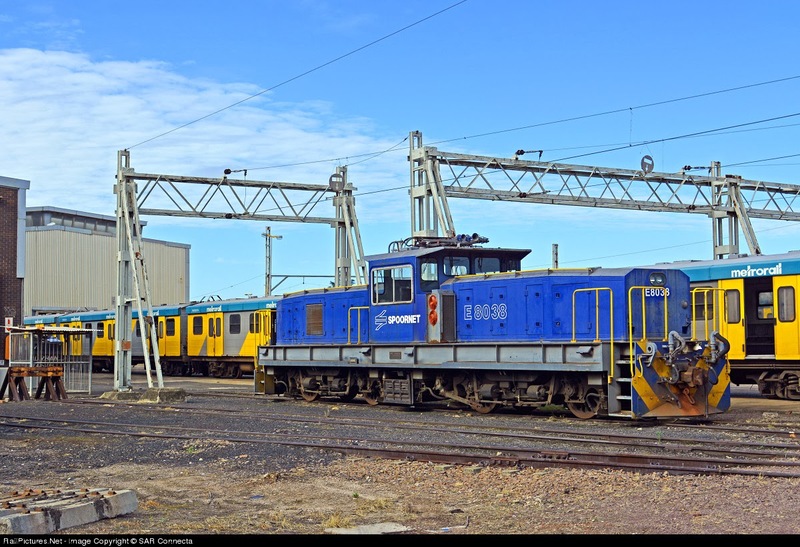 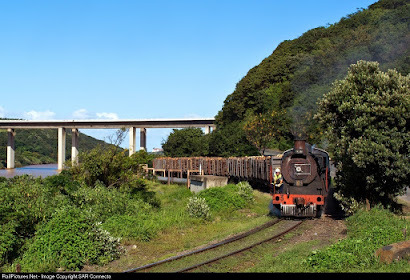 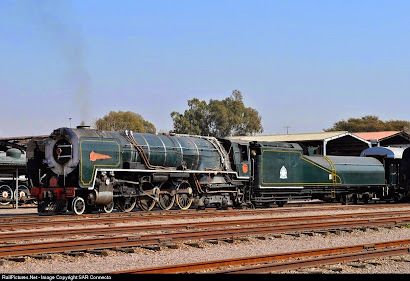 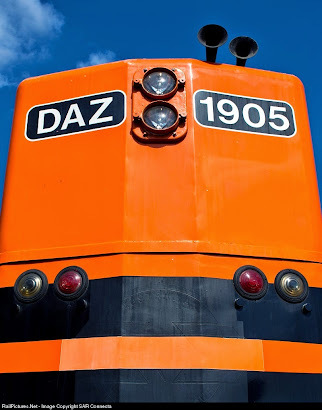 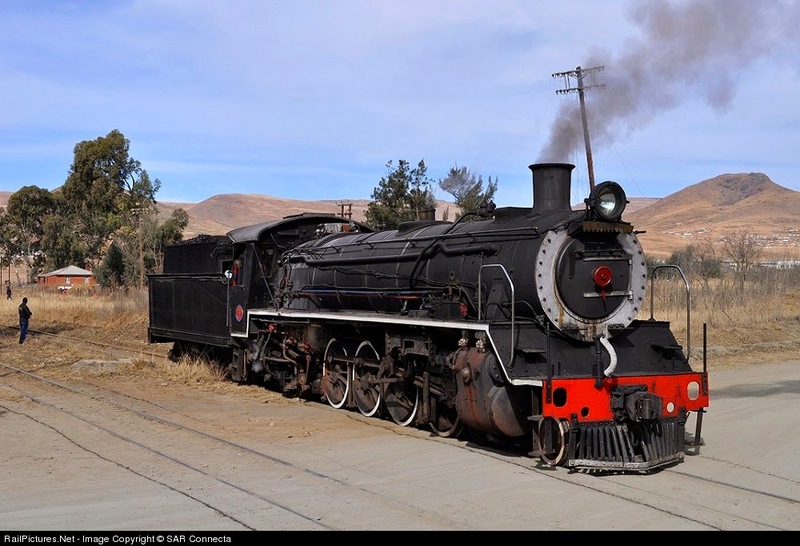 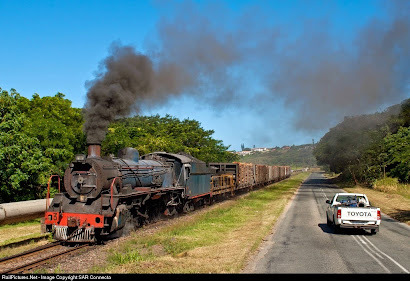 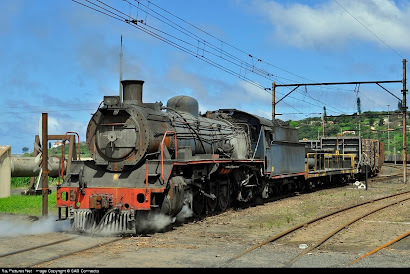 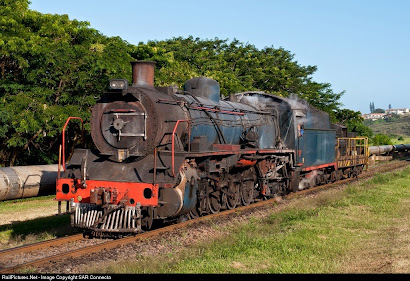 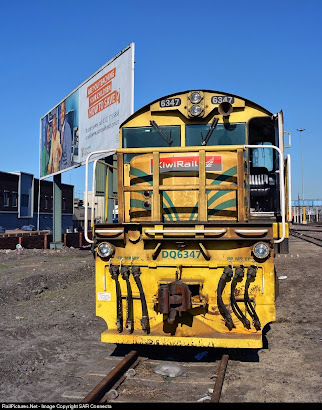 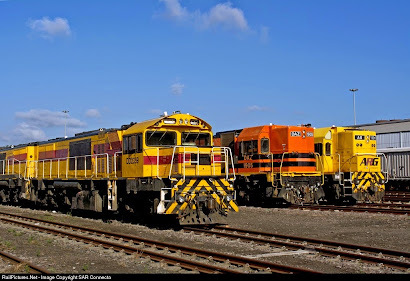 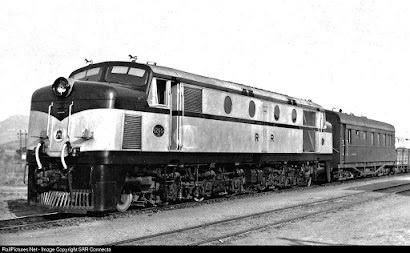 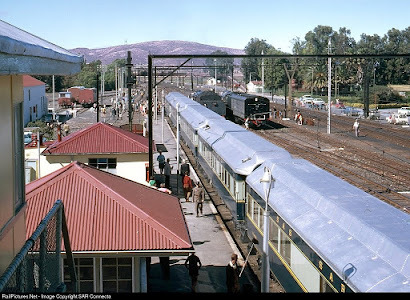 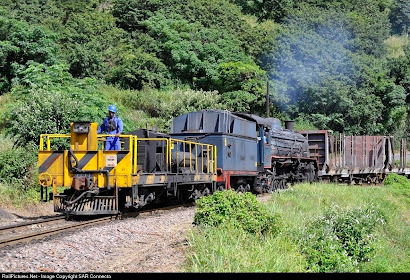 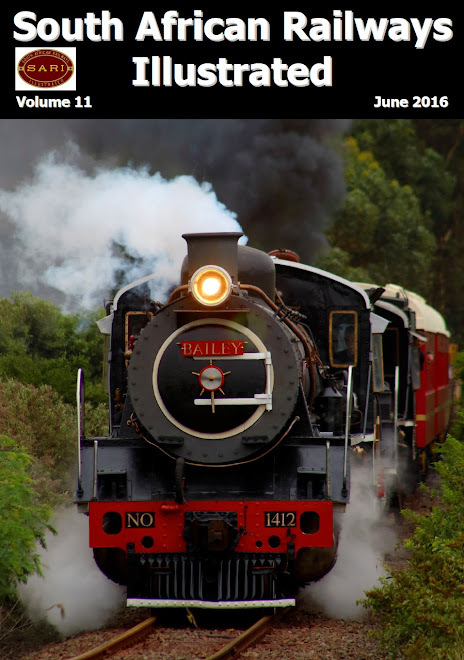 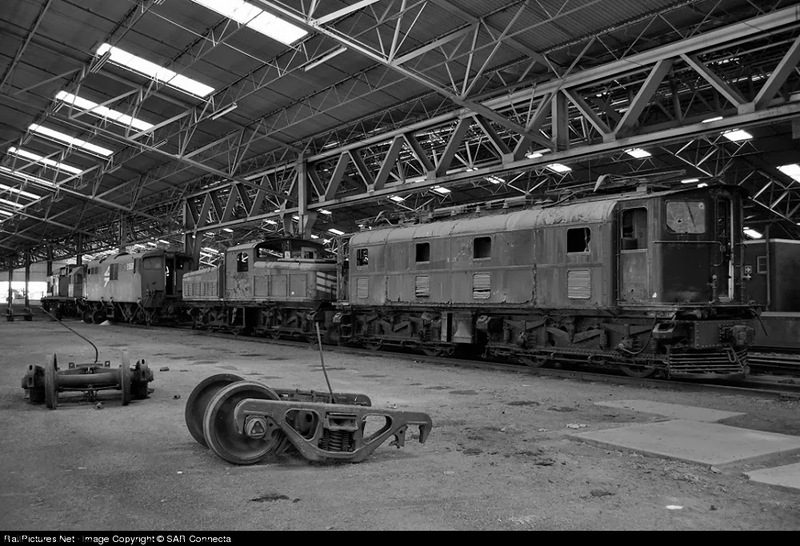 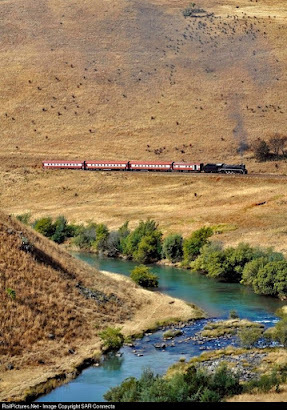 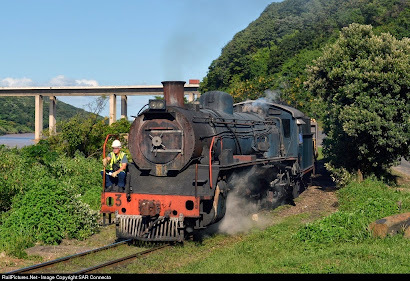 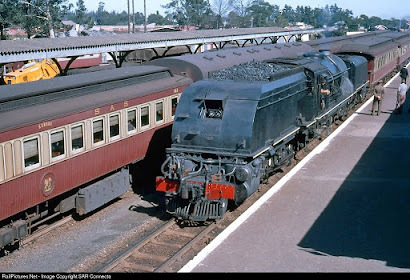 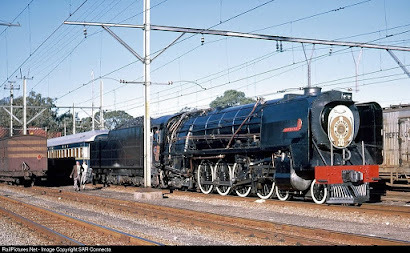 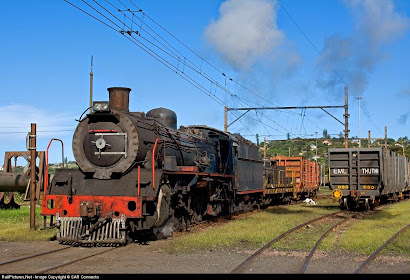 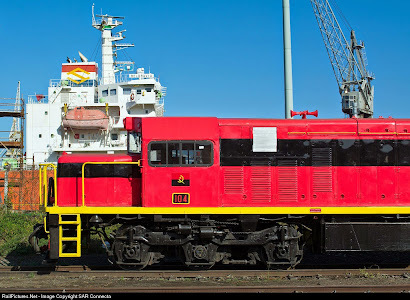 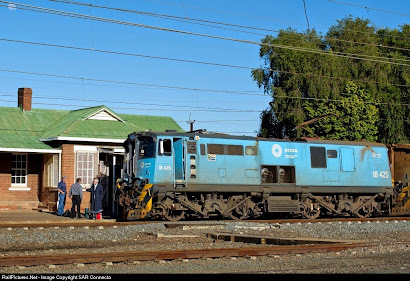 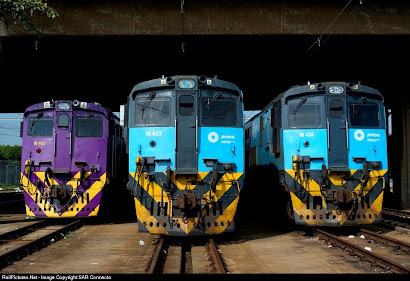 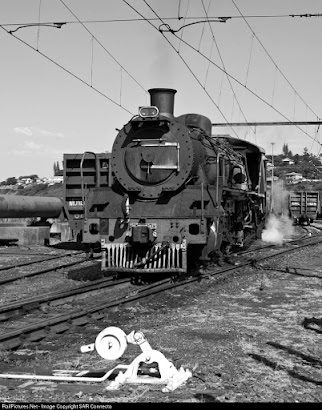 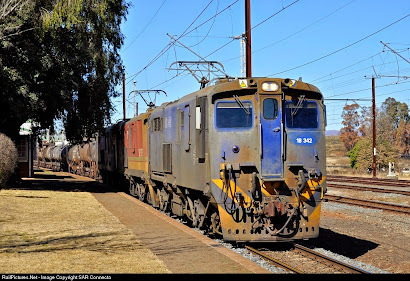 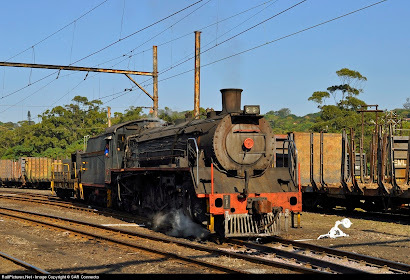 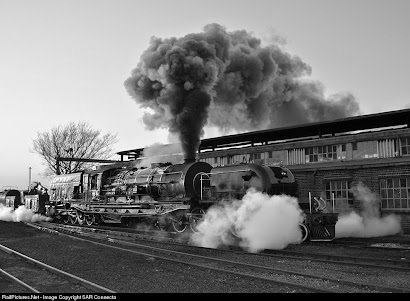 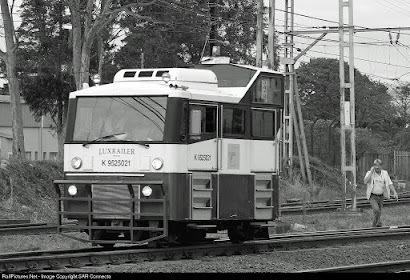 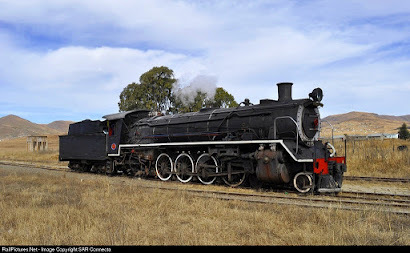 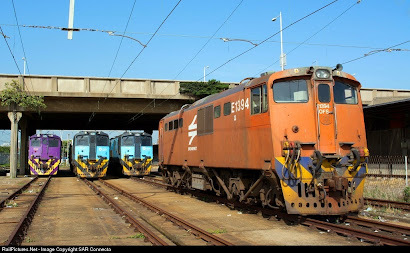 E1419 & E1509 at Bayhead (17th April 2012). 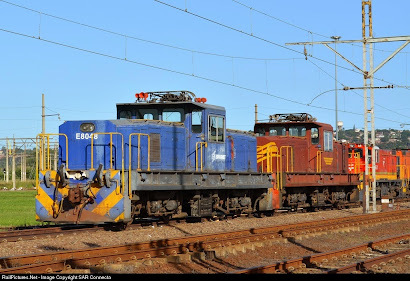 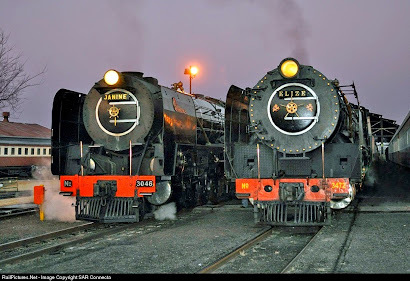 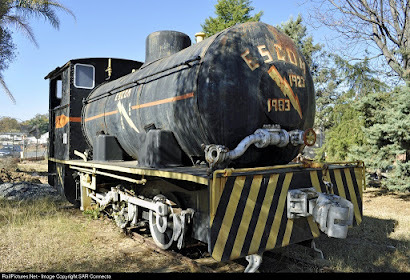 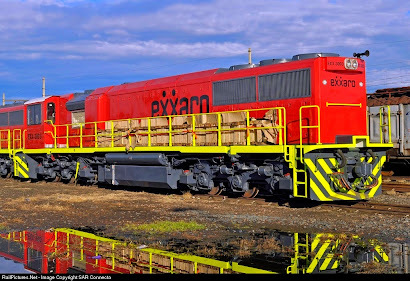 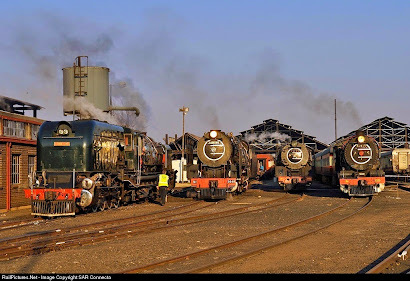 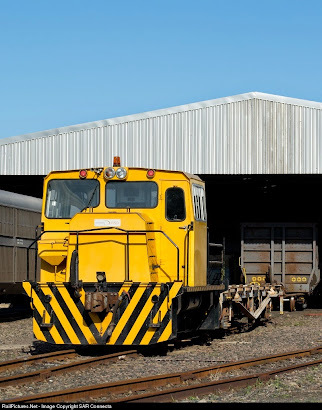 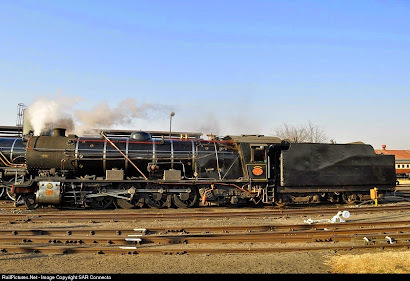 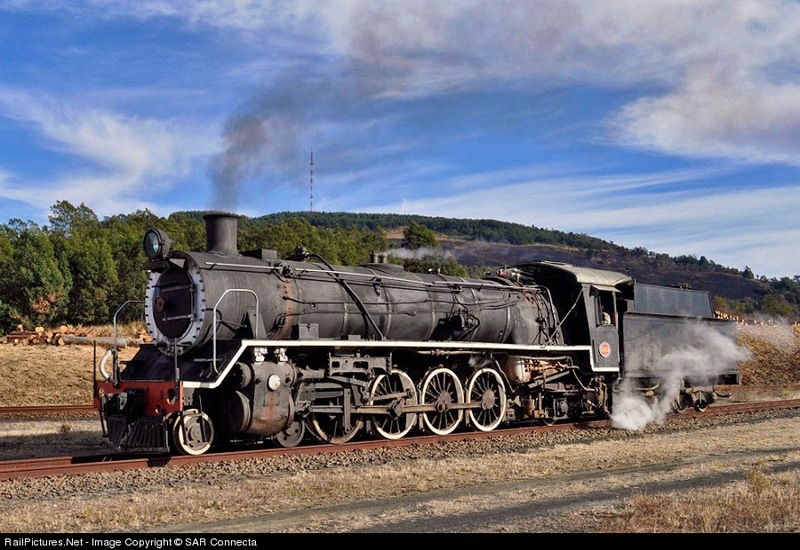 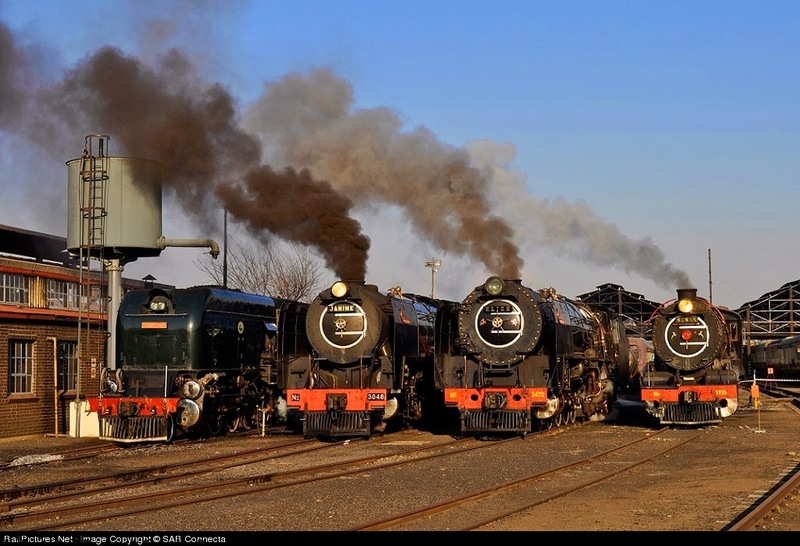 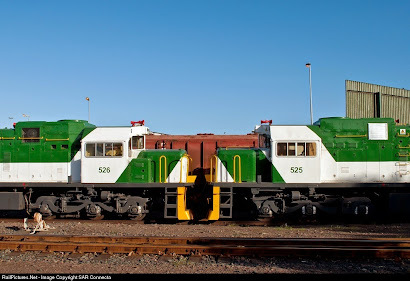 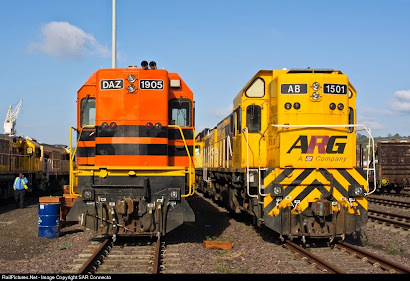 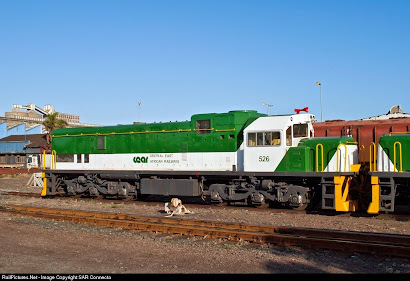 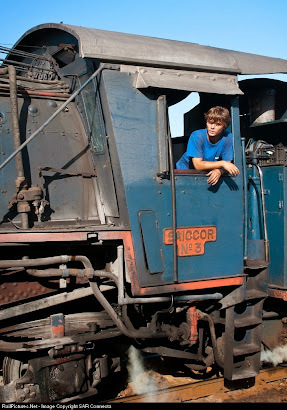 E1598 & E1495 at Bayhead (17th April 2012). 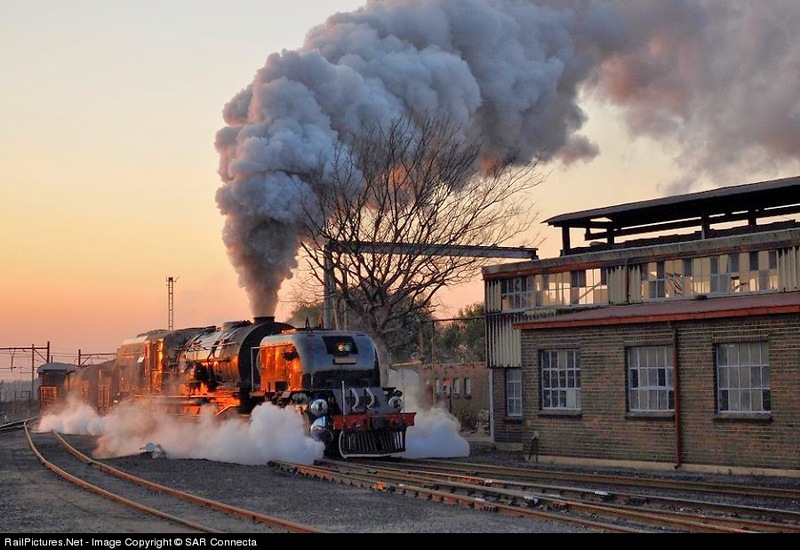 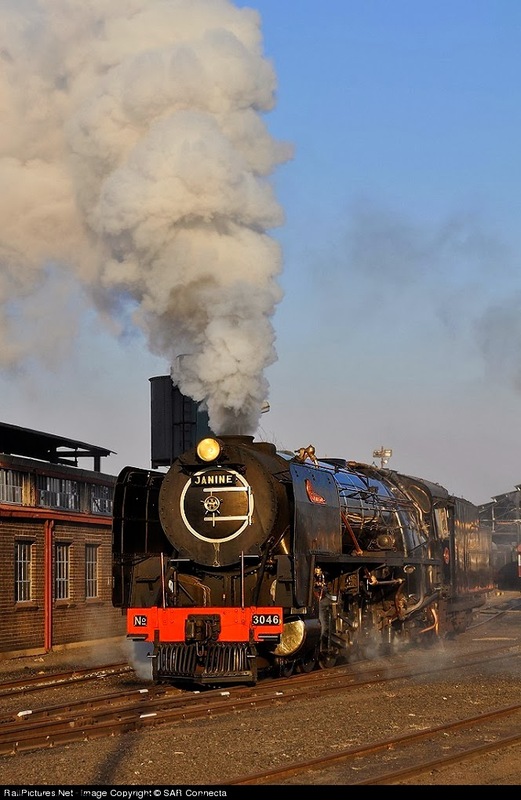 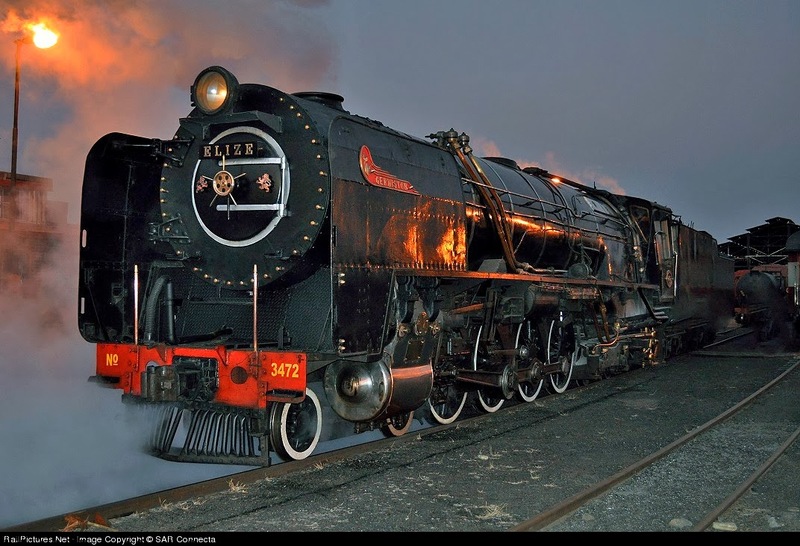 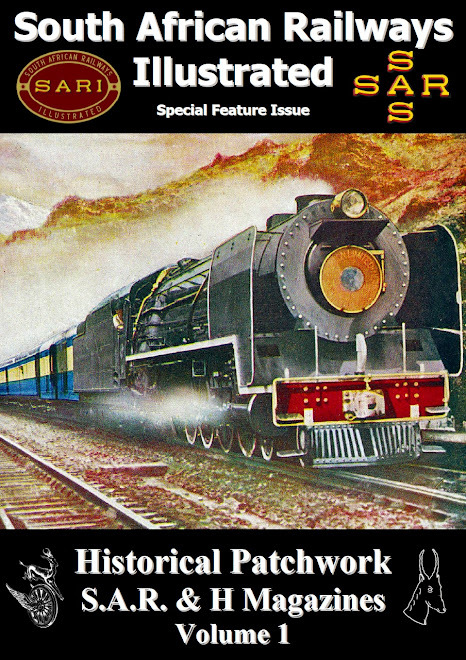 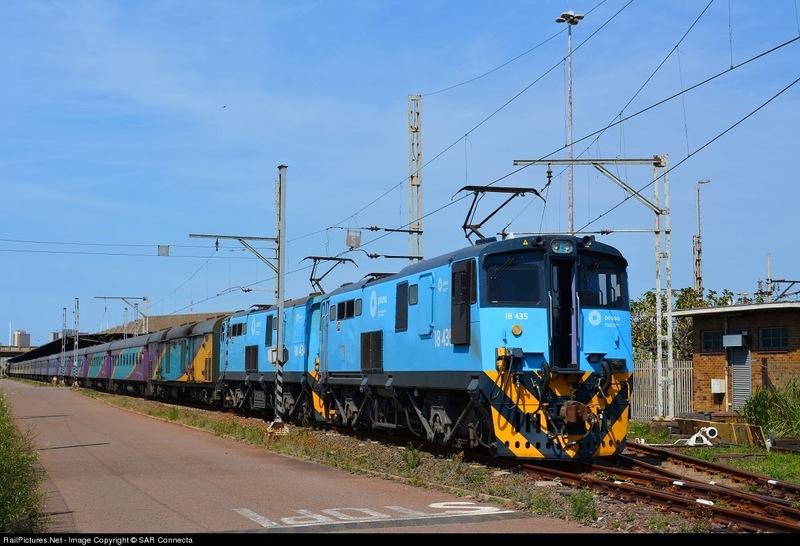 37-099 at Bayhead (17th April 2012). 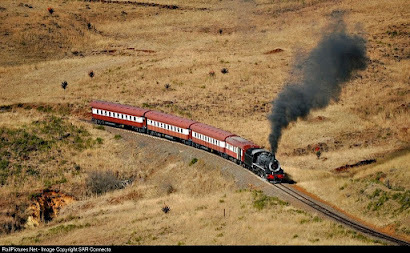 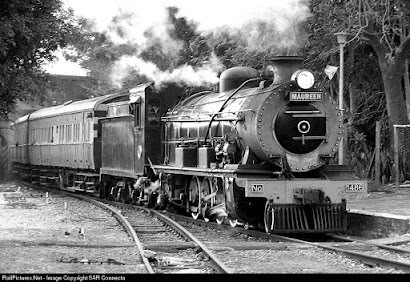 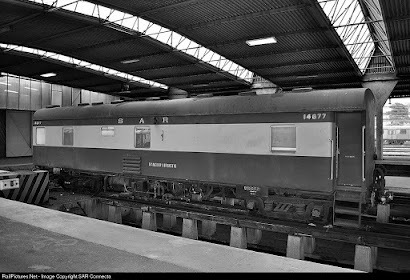 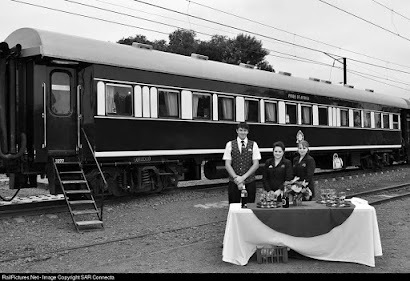 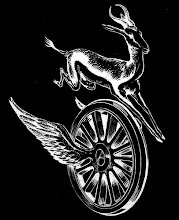 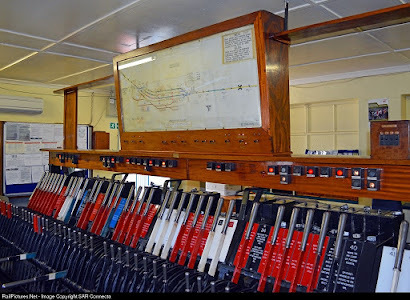 B Wagon - Merrivale (13th April 2012). 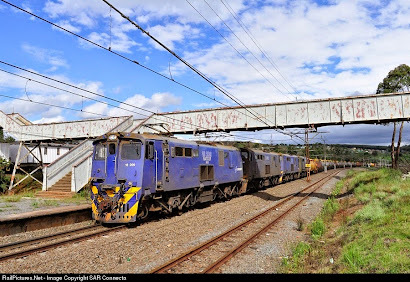 18-675 Umlaas Road (8th April 2012). 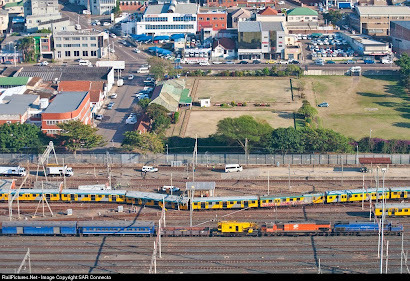 18-619 Umlaas Road (8th April 2012). 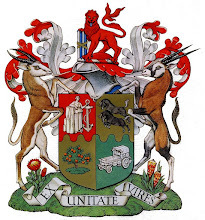 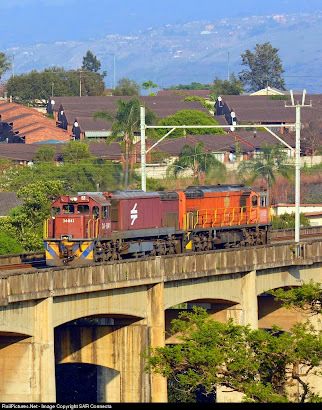 18-510 Umlaas Road (8th April 2012). 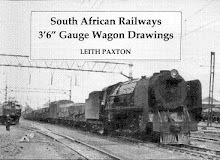 18-339 Umlaas Road (8th April 2012). 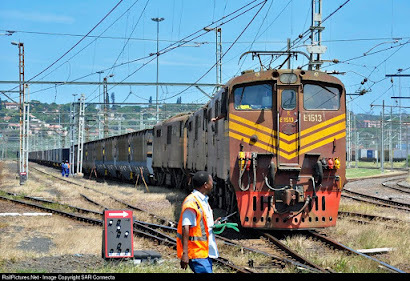 18-611 Umlaas Road (8th April 2012). 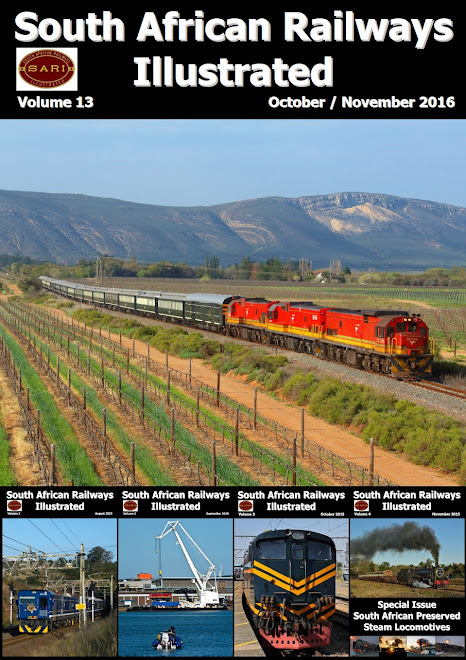 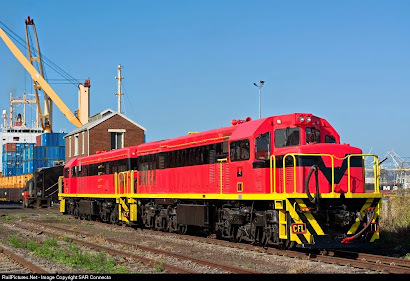 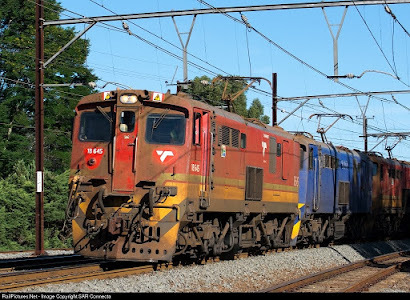 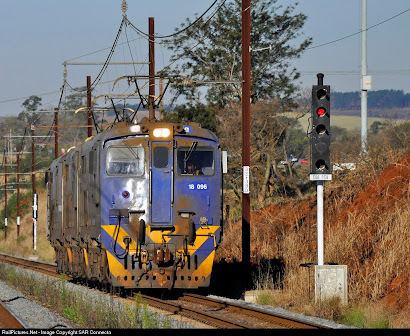 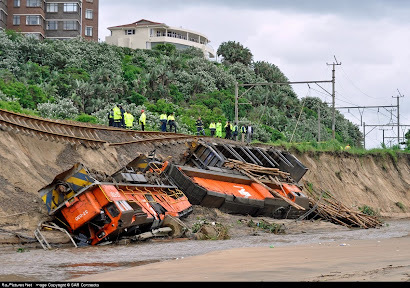 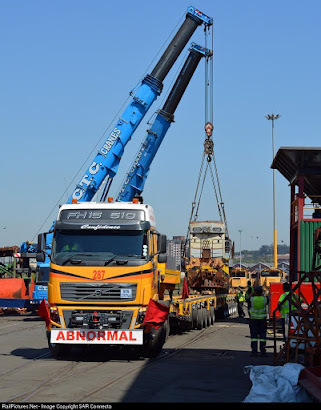 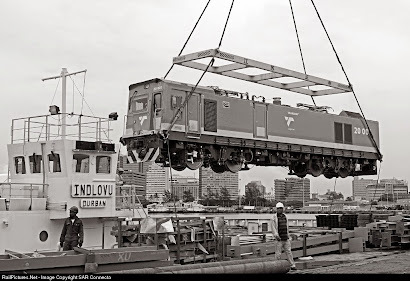 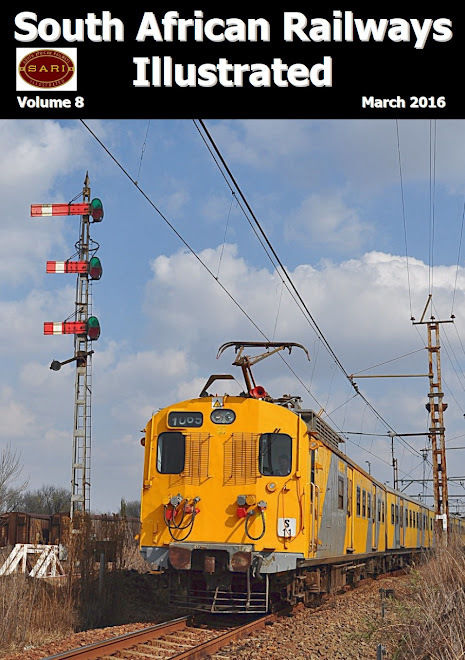 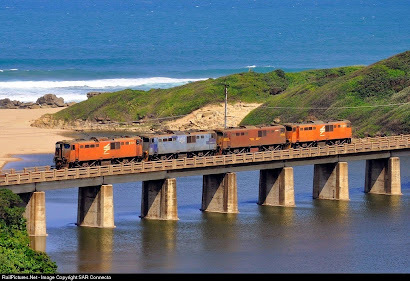 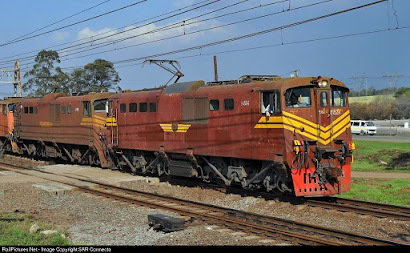 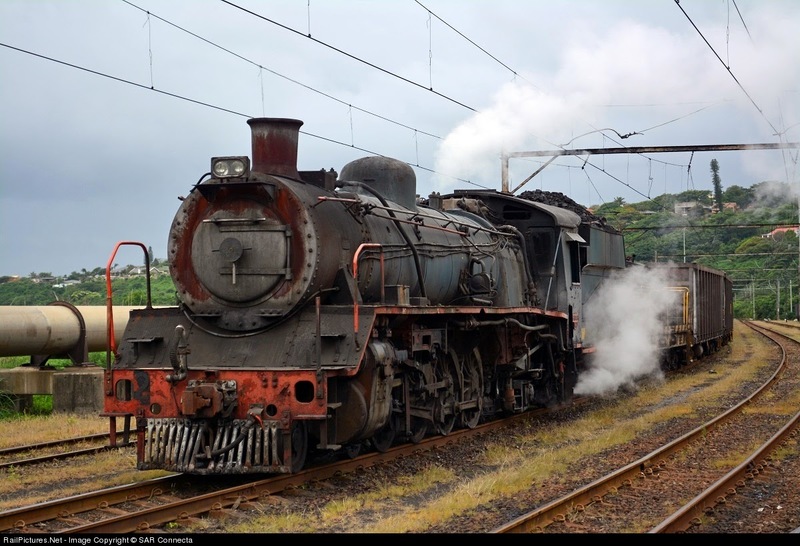 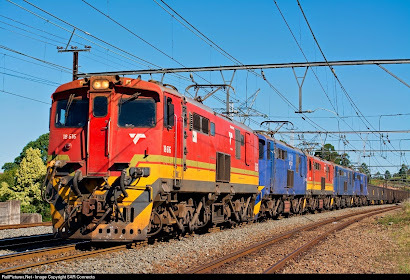 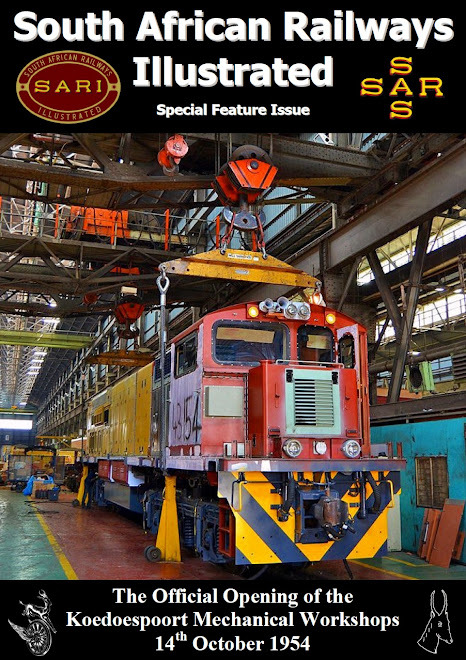 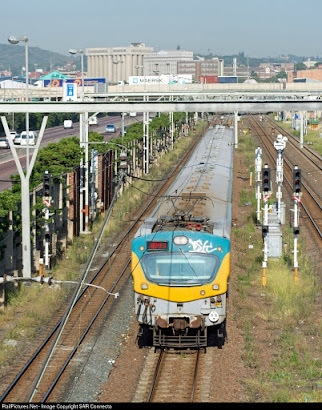 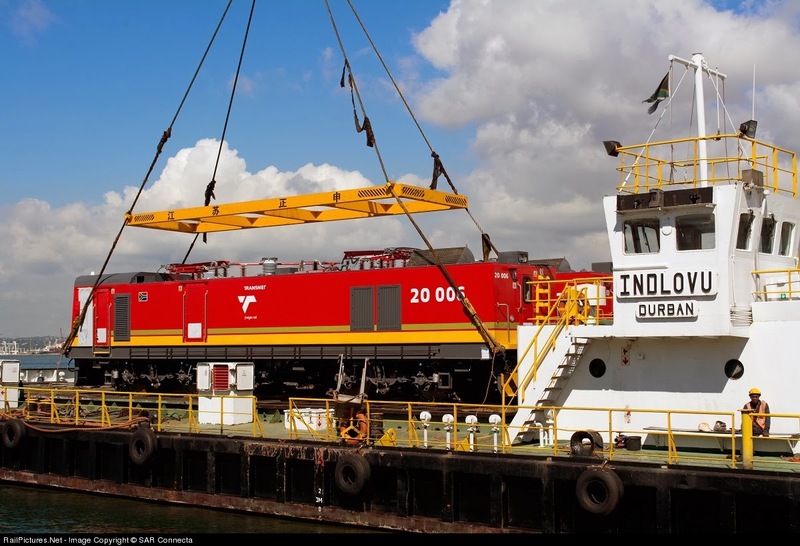 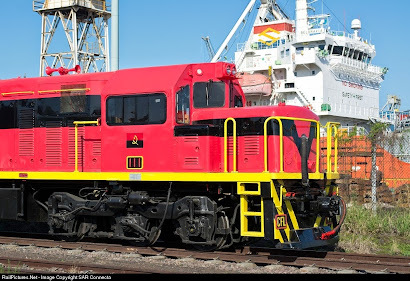 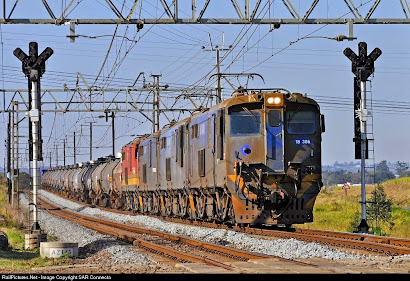 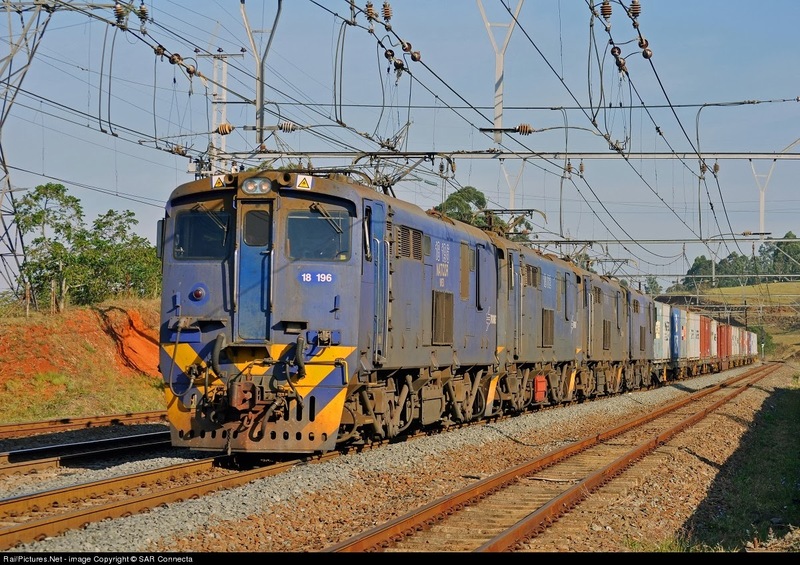 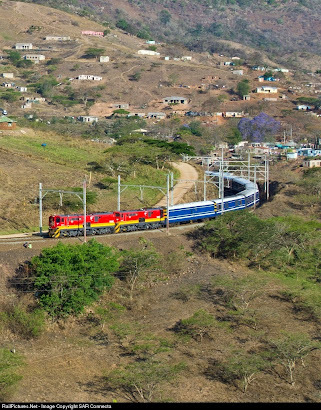 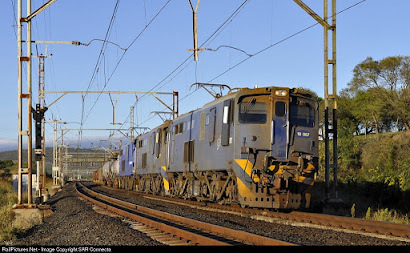 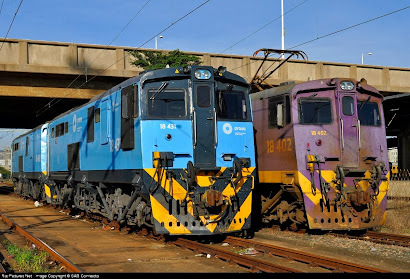 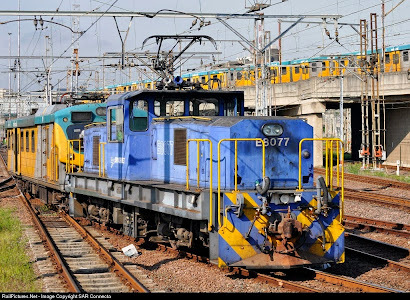 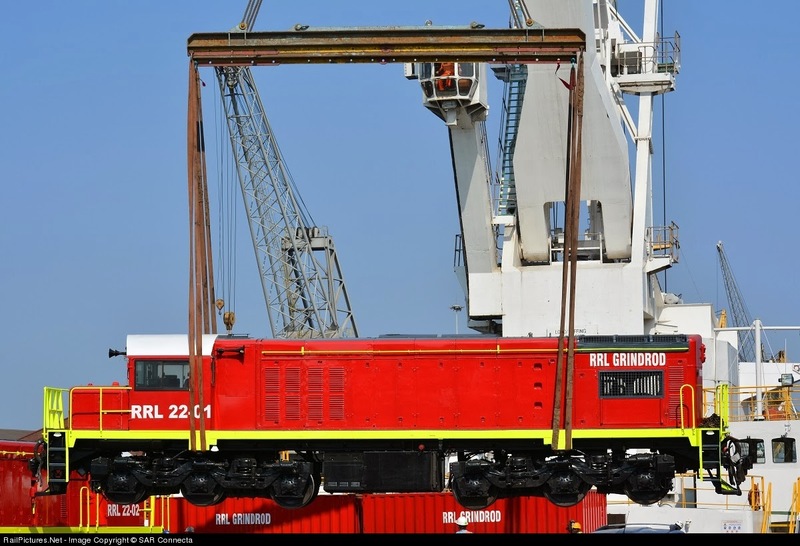 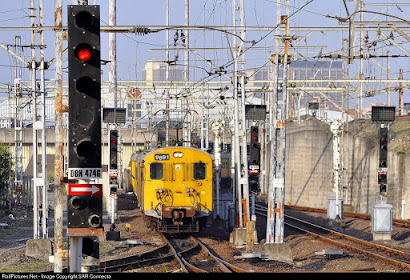 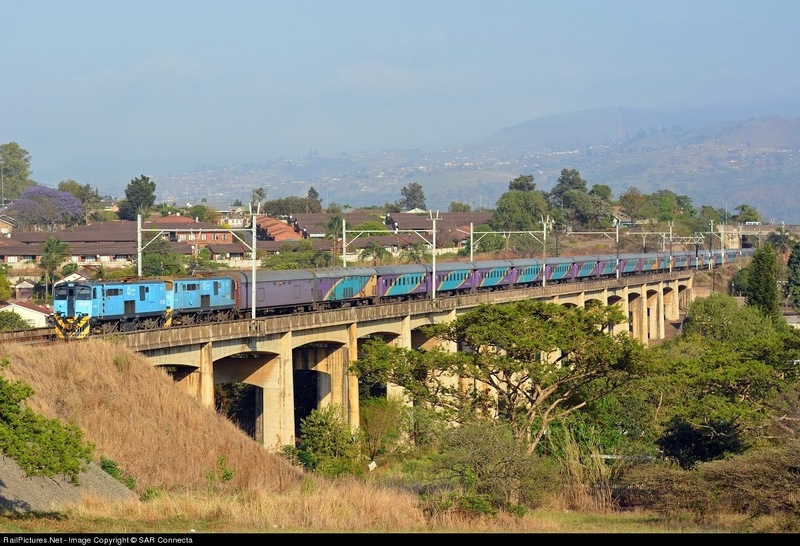 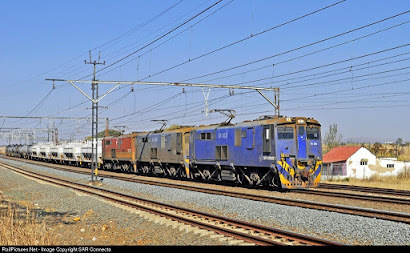 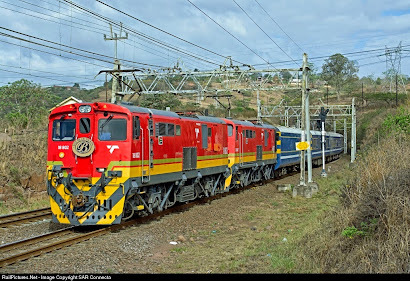 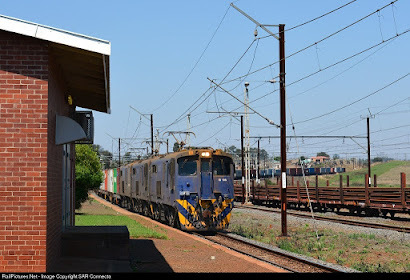 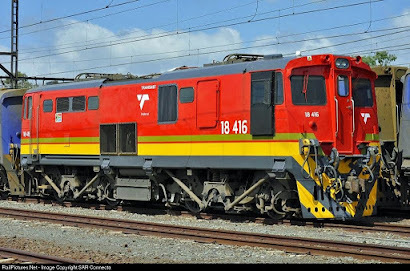 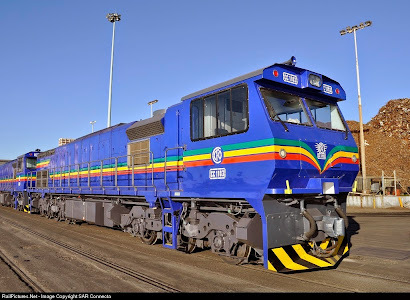 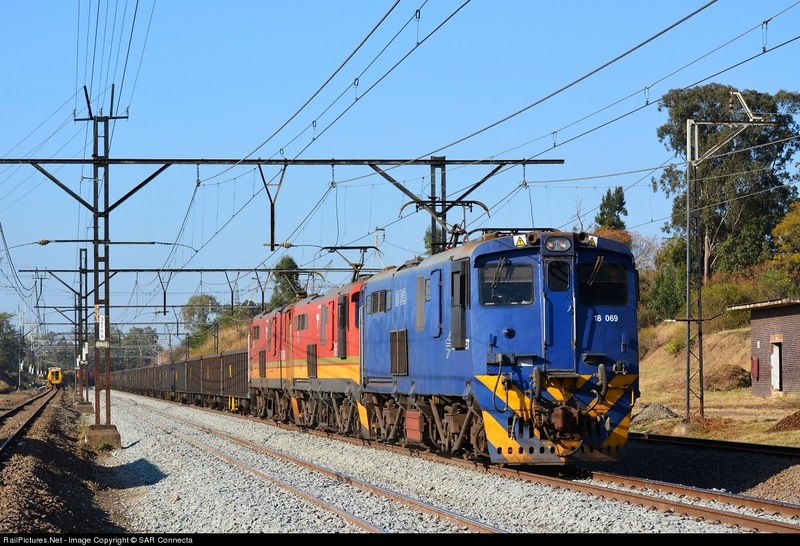 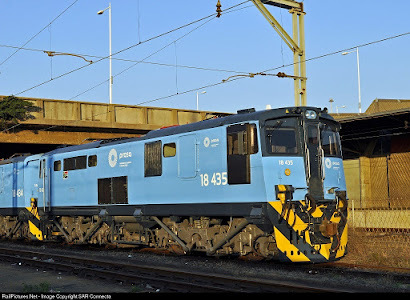 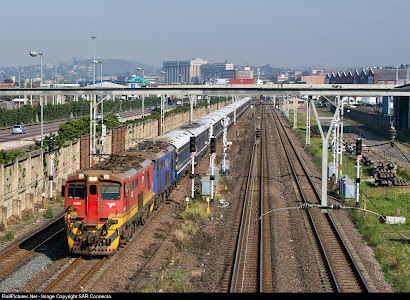 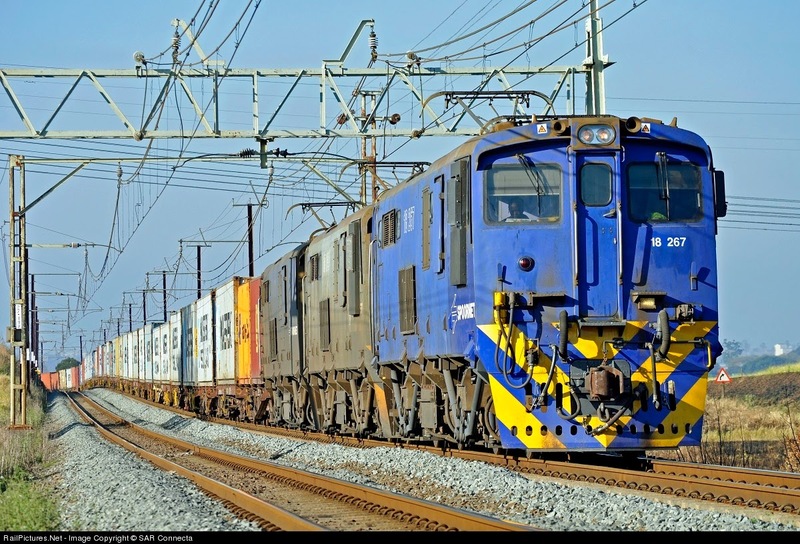 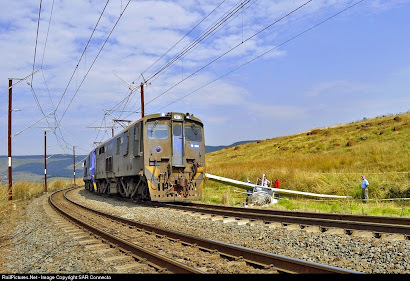 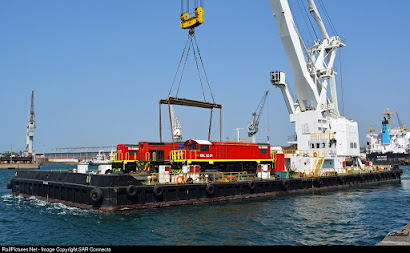 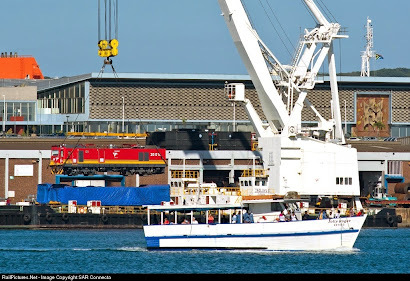 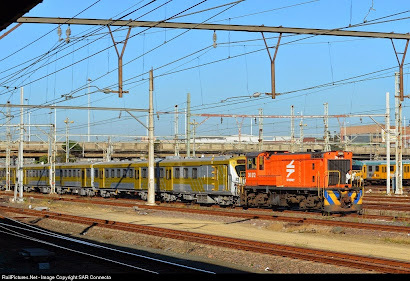 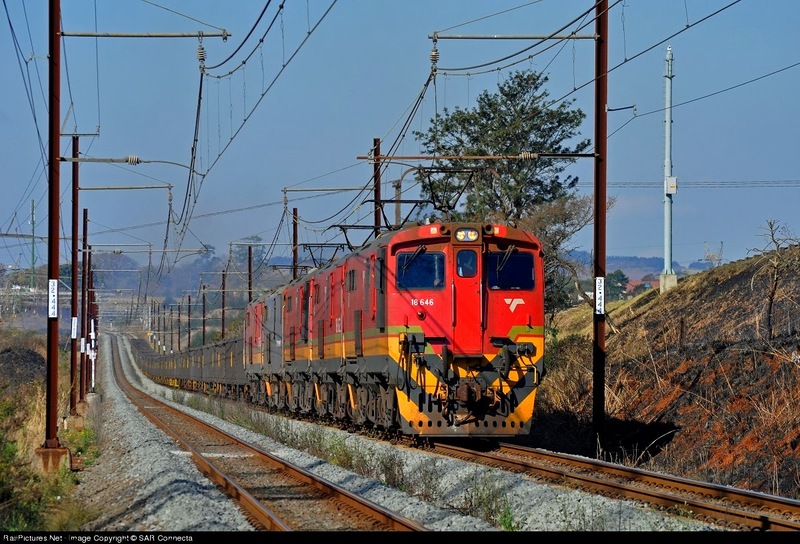 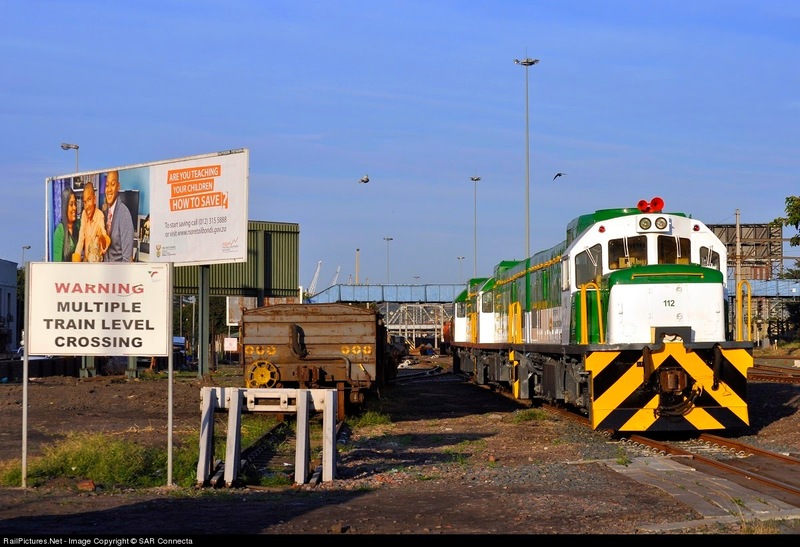 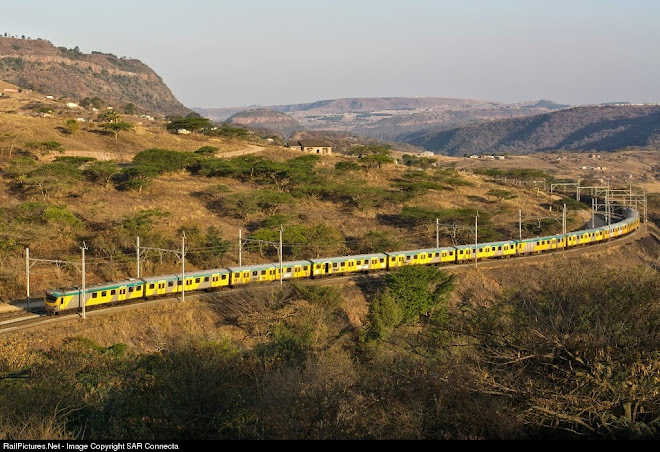 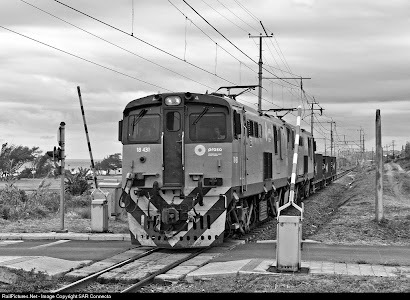 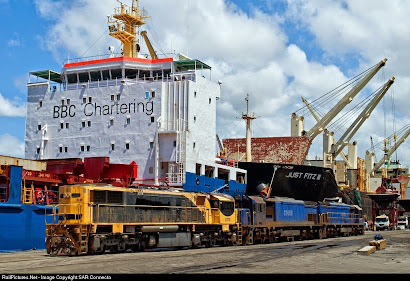 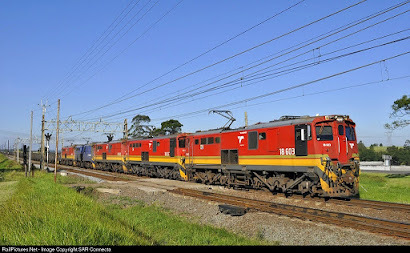 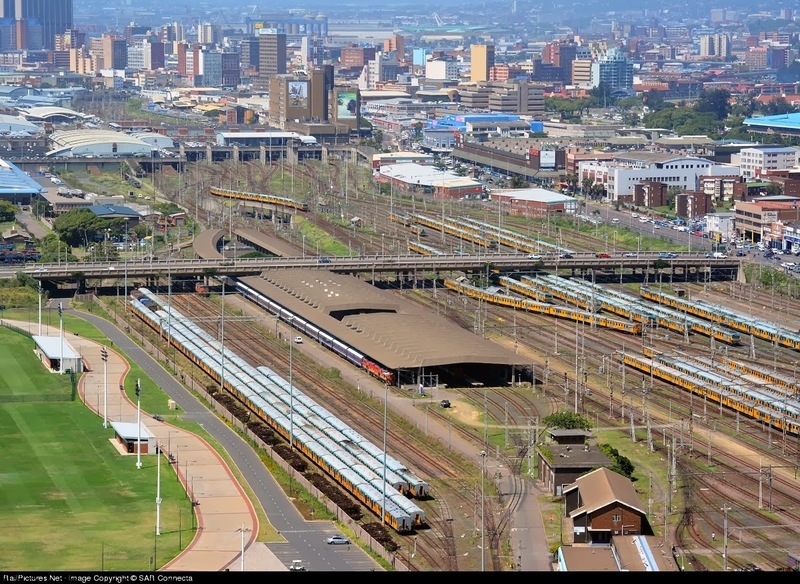 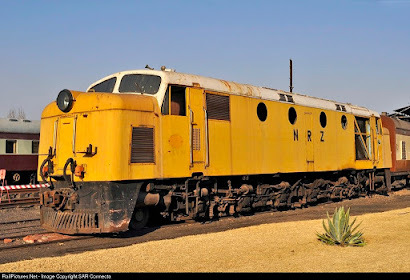 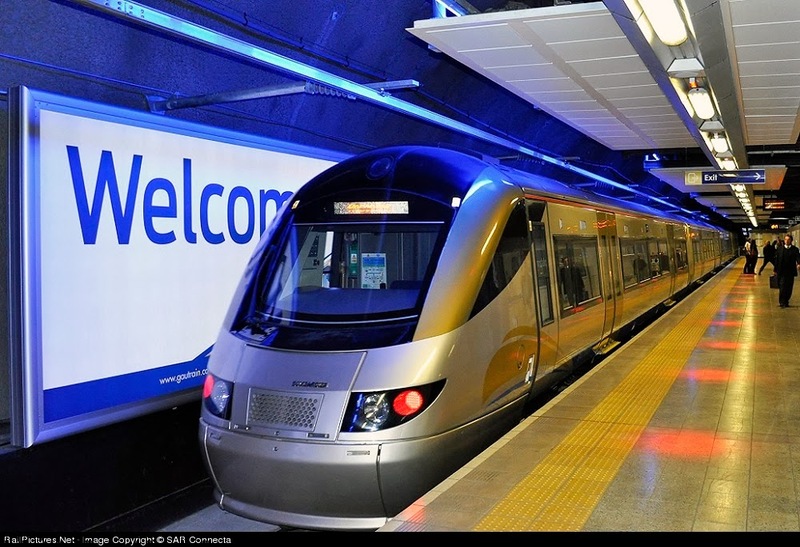 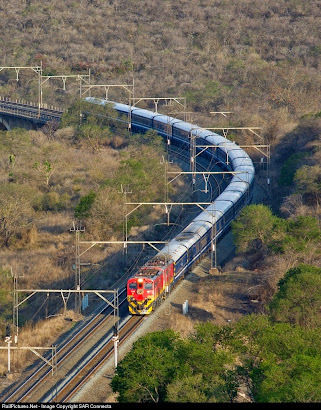 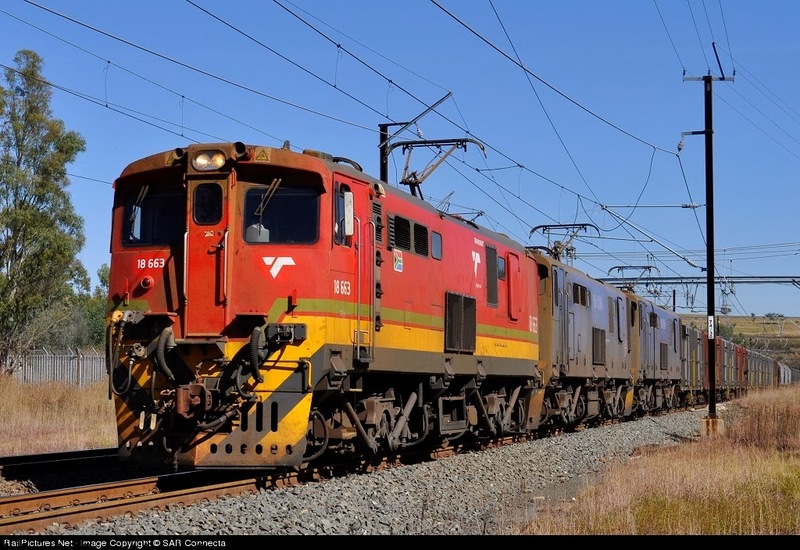 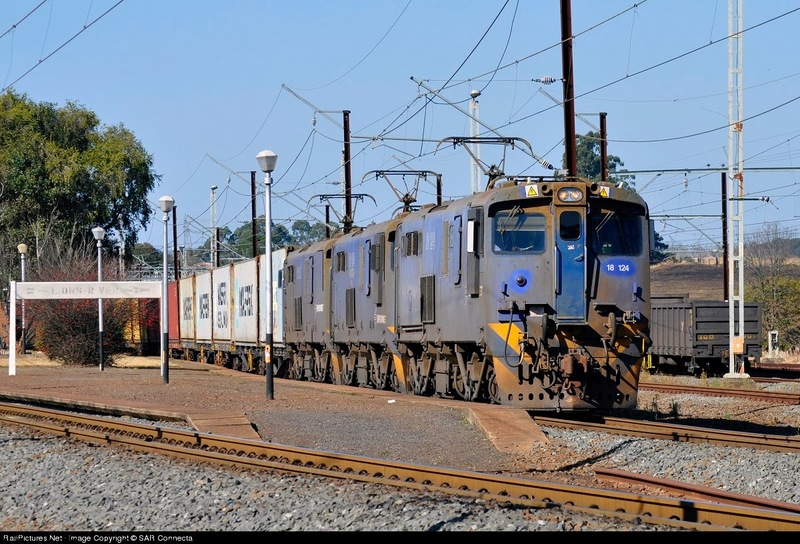 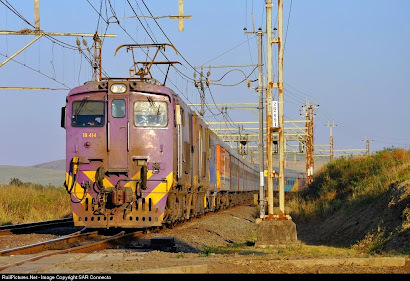 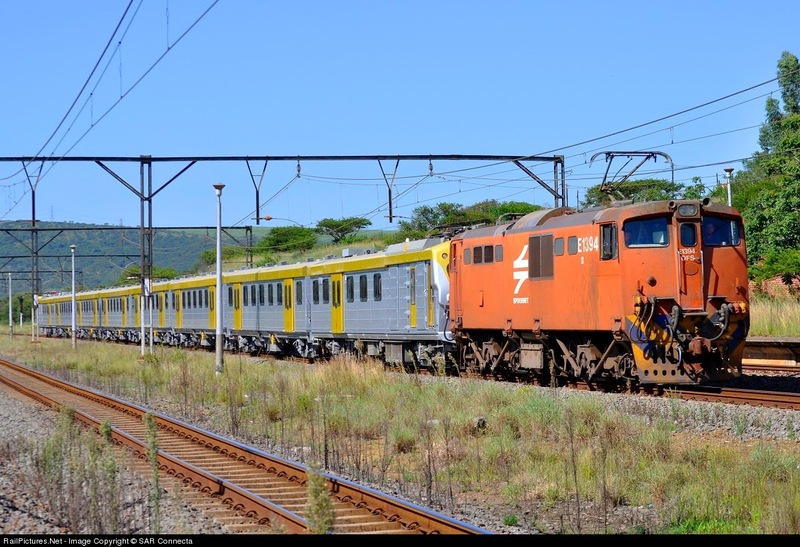 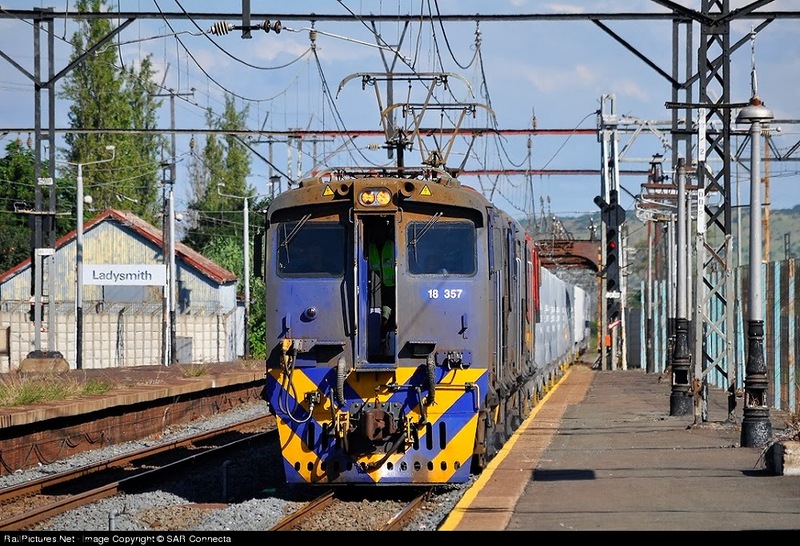 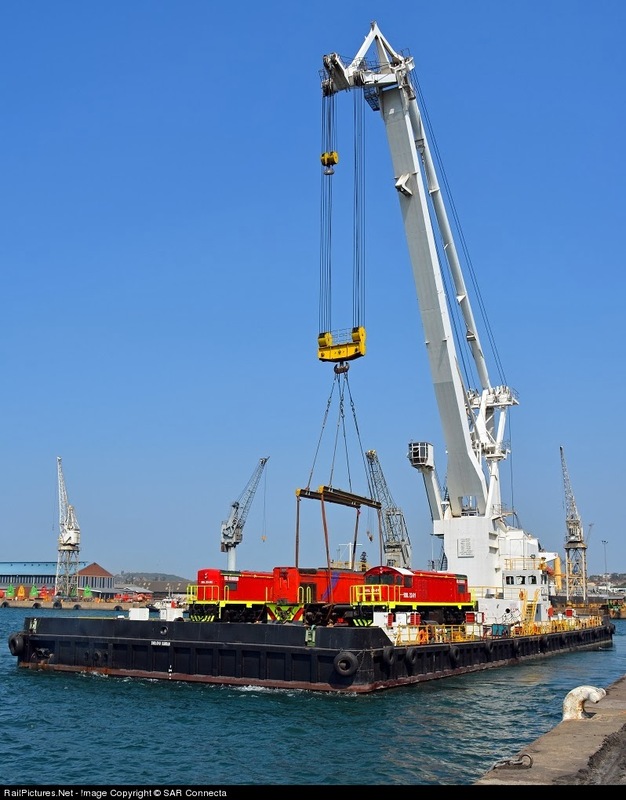 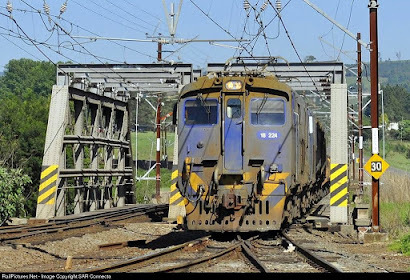 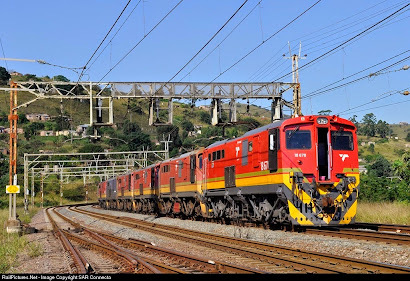 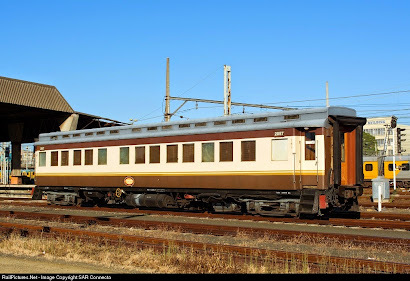 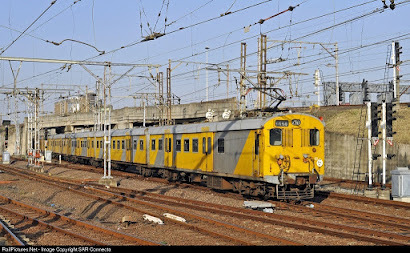 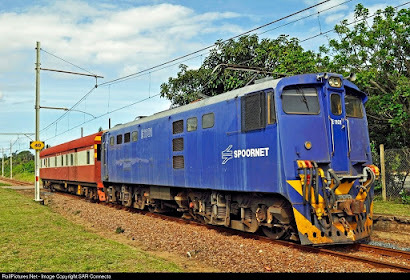 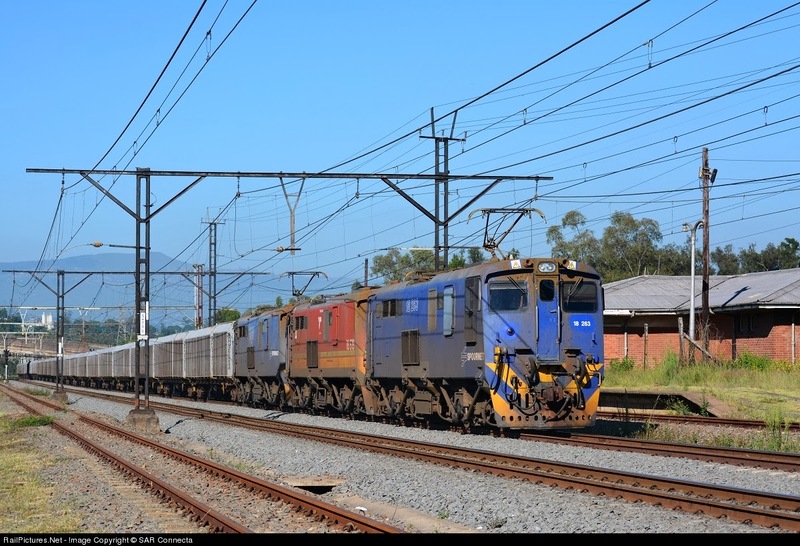 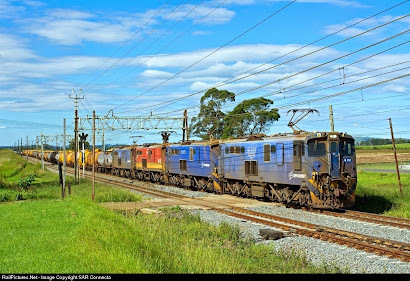 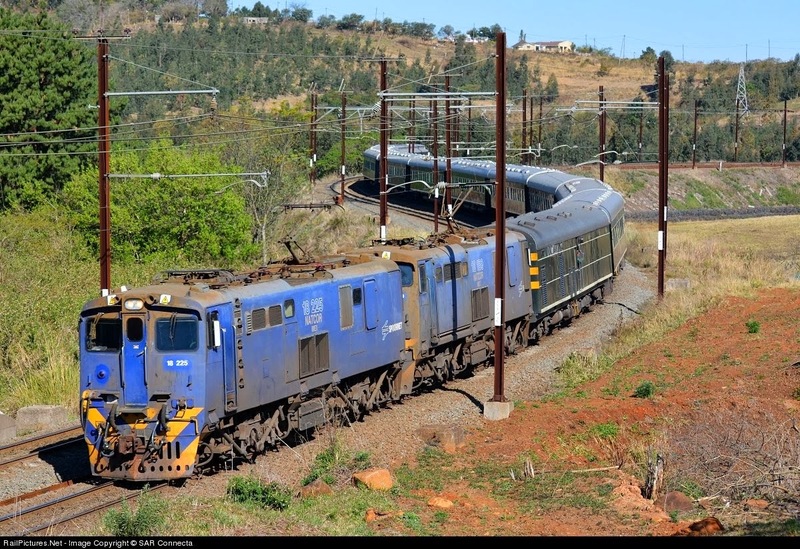 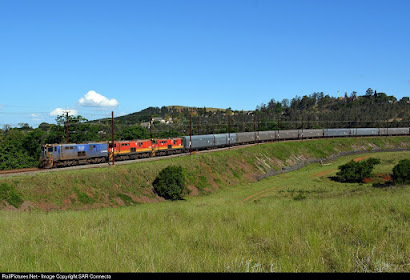 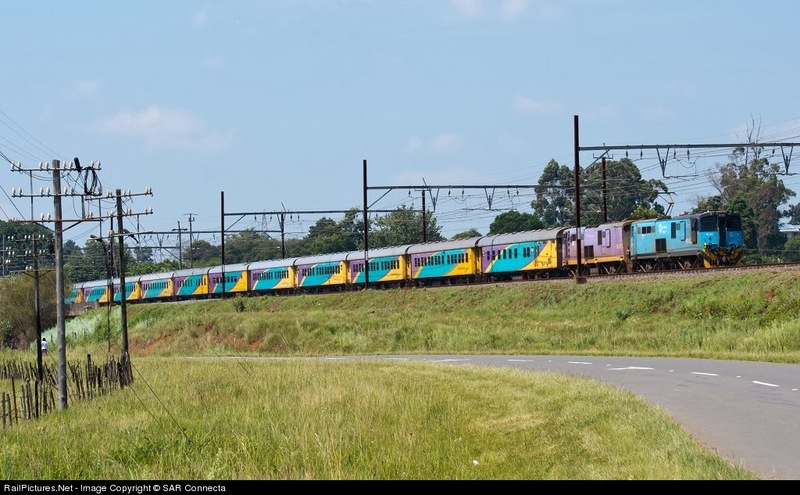 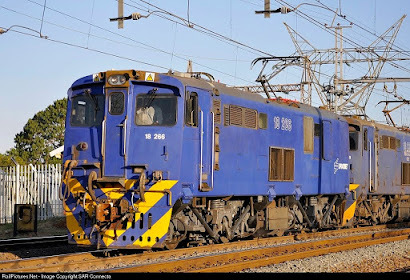 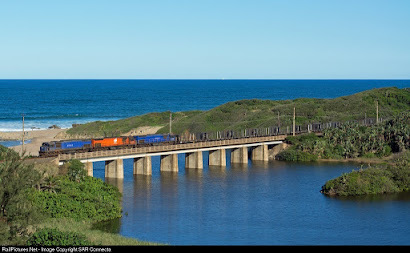 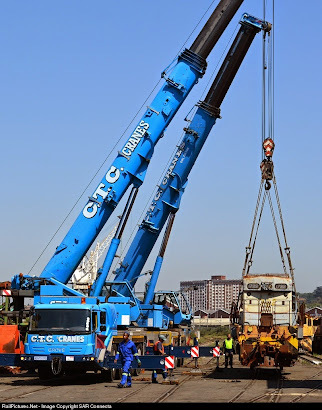 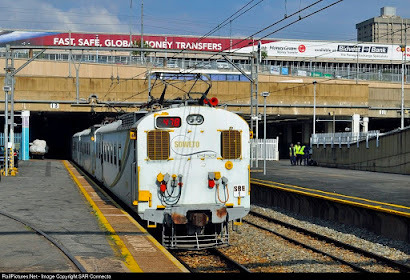 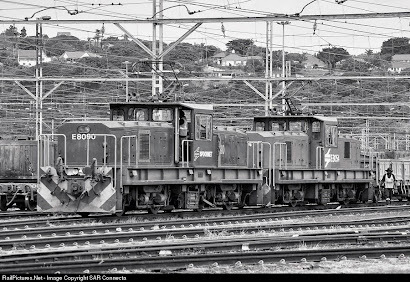 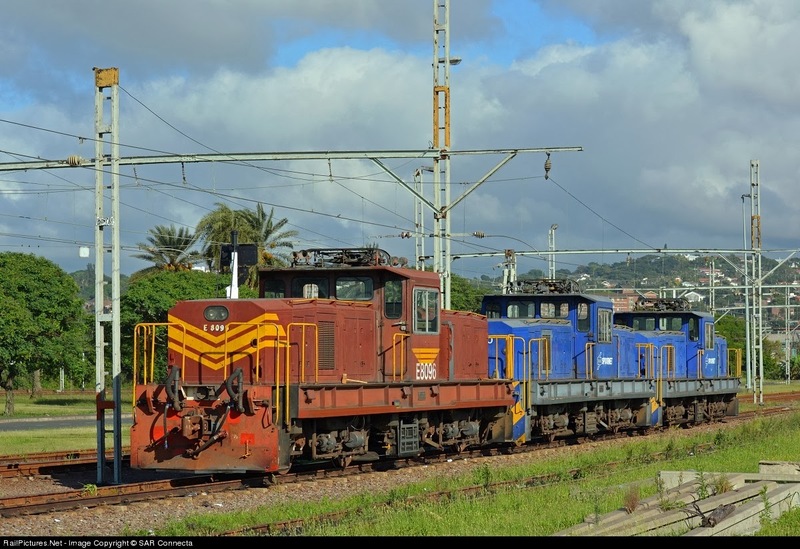 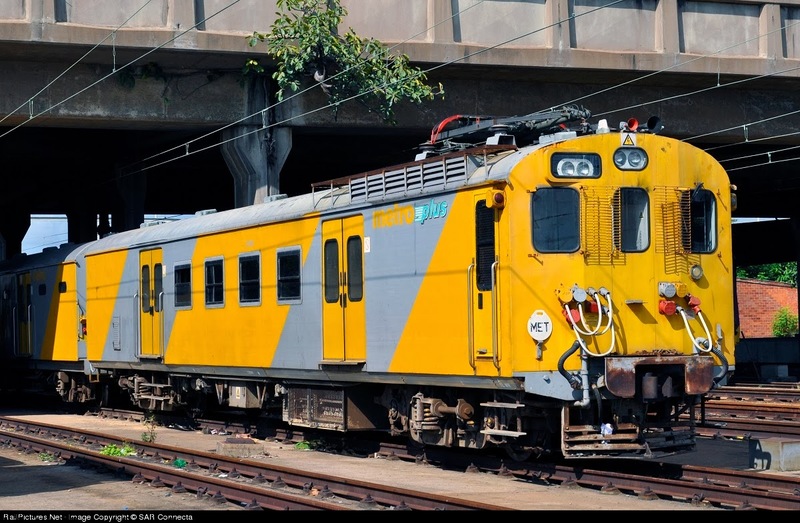 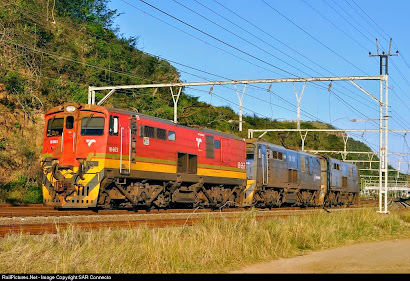 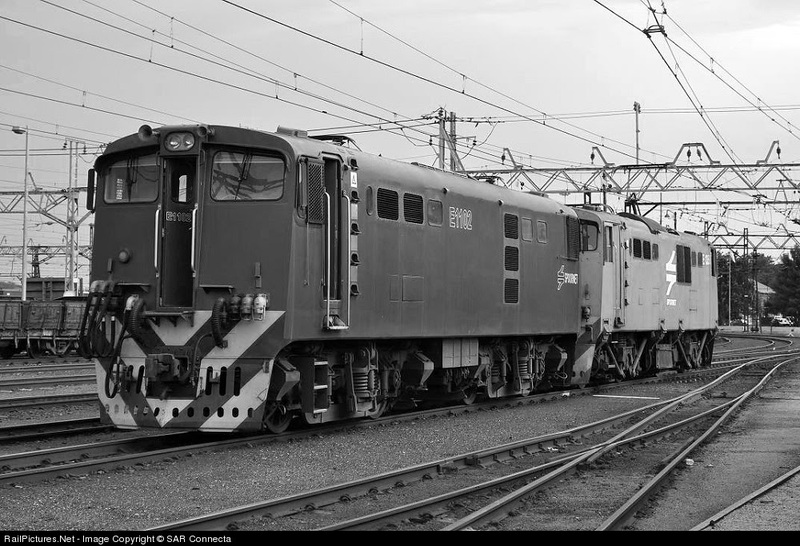 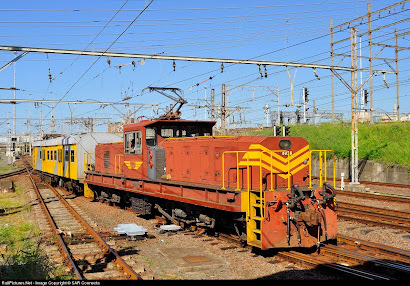 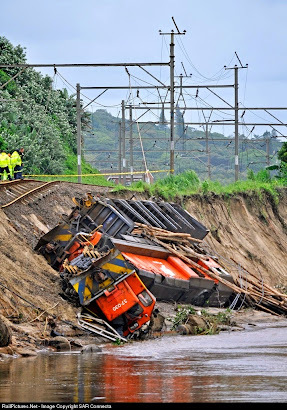 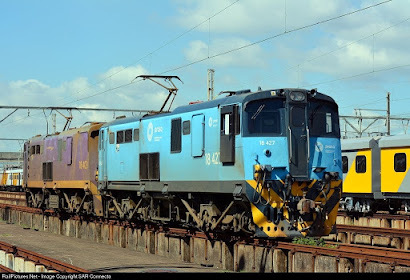 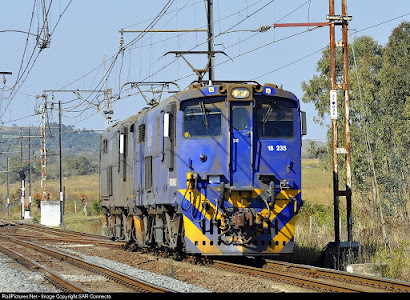 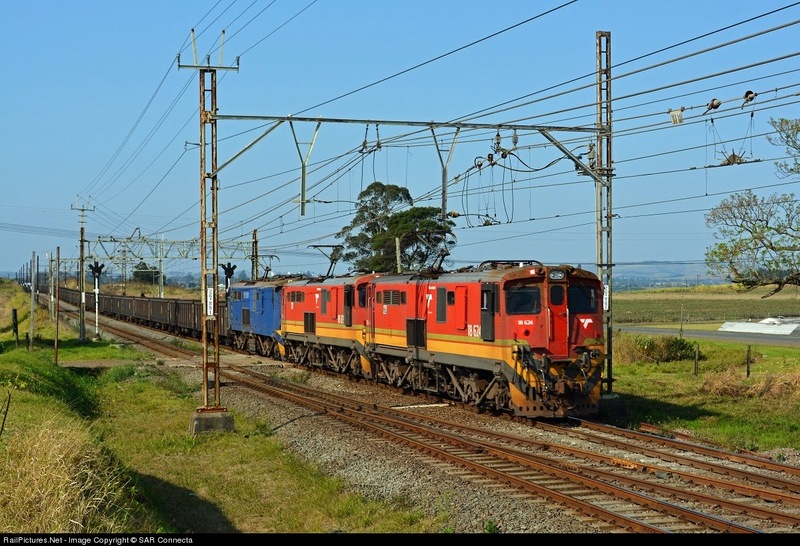 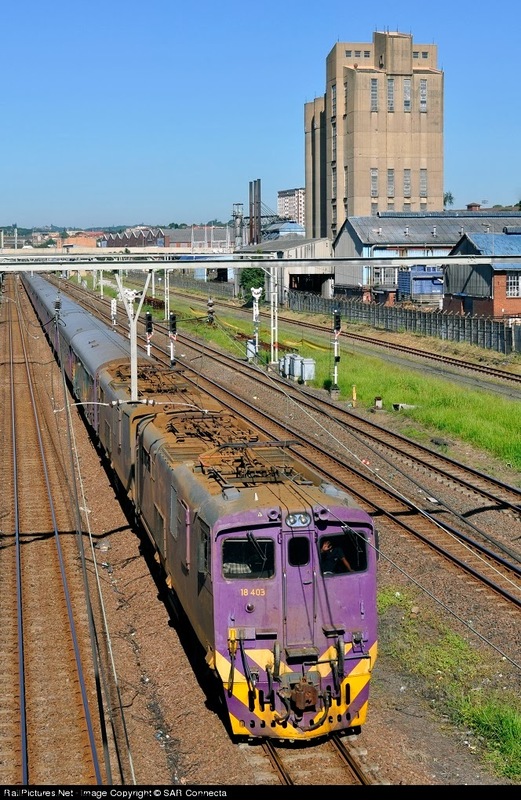 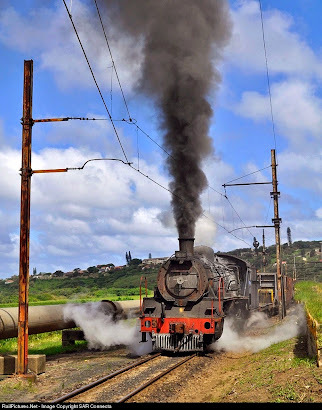 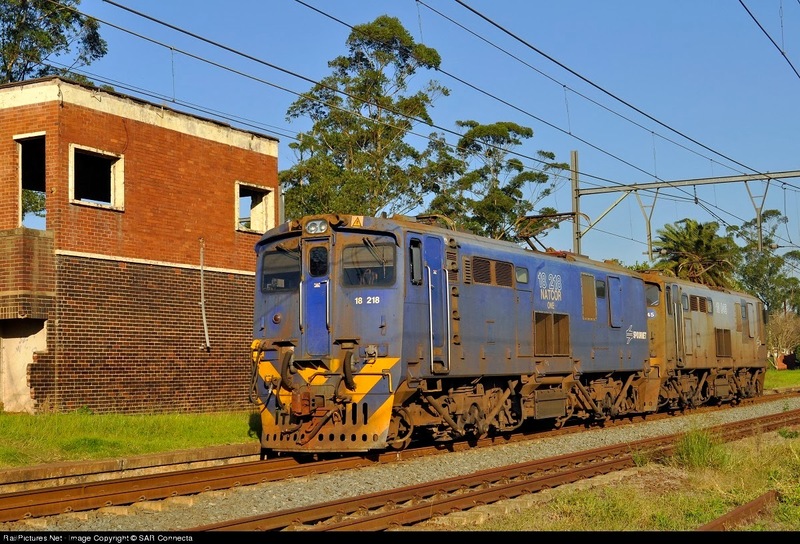 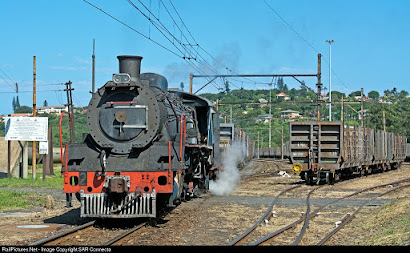 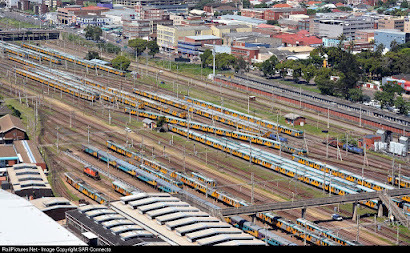 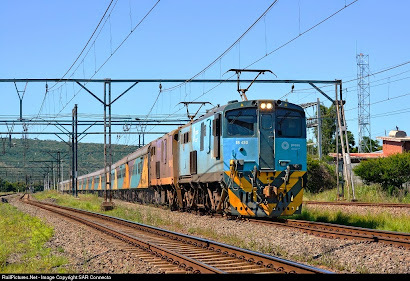 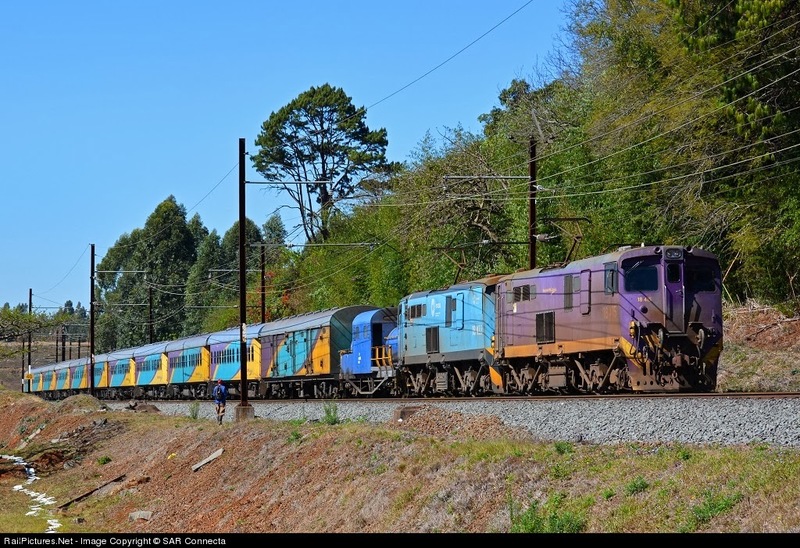 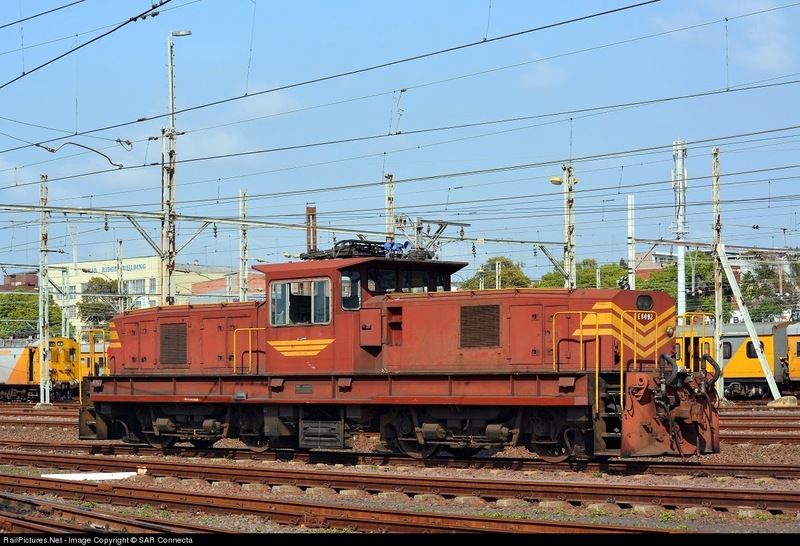 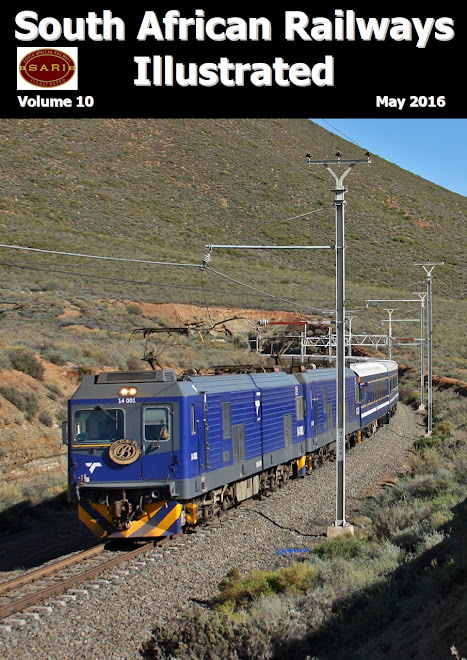 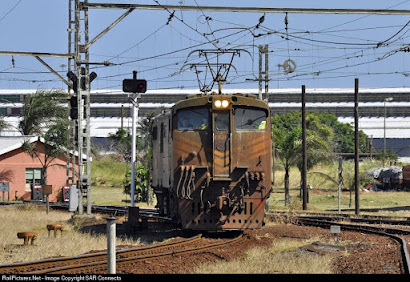 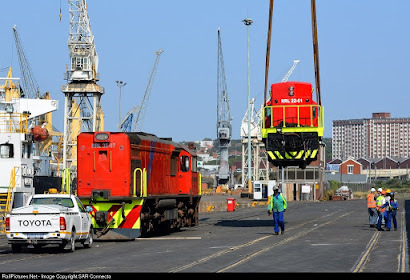 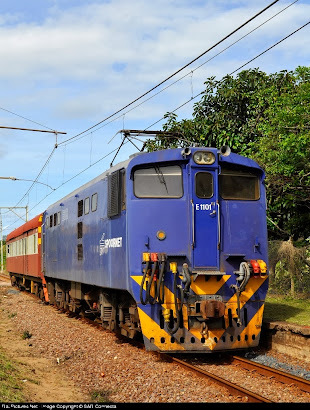 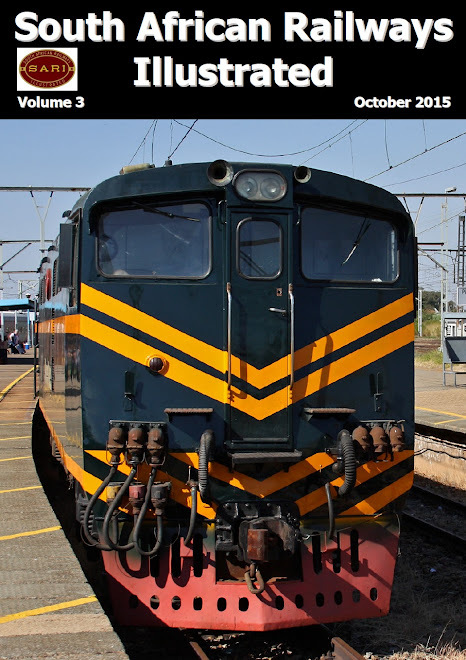 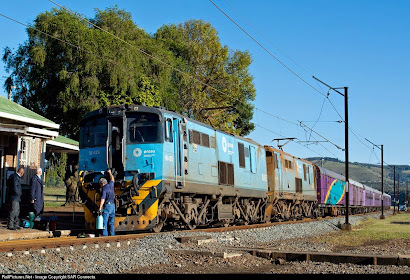 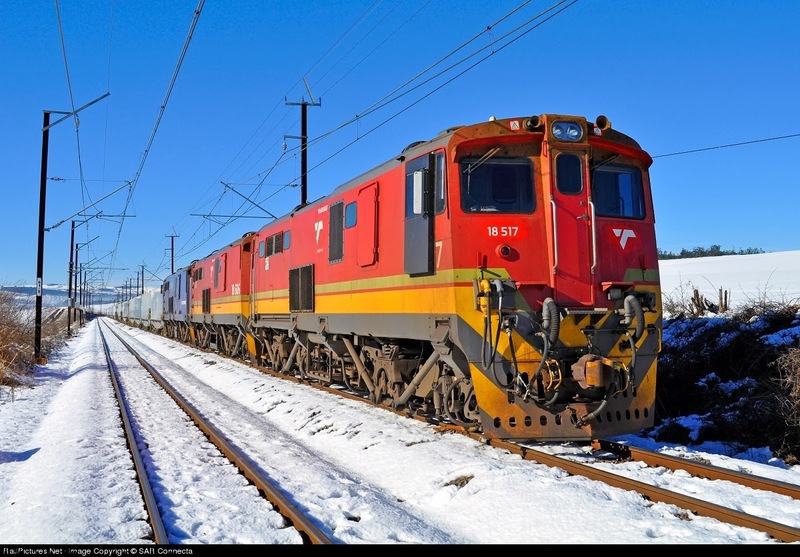 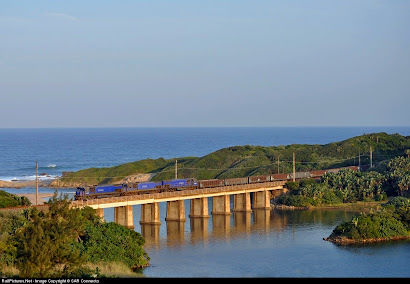 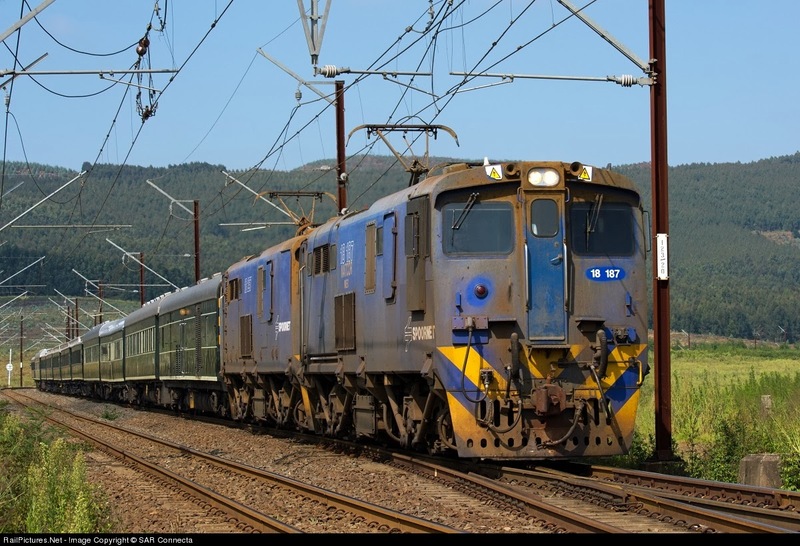 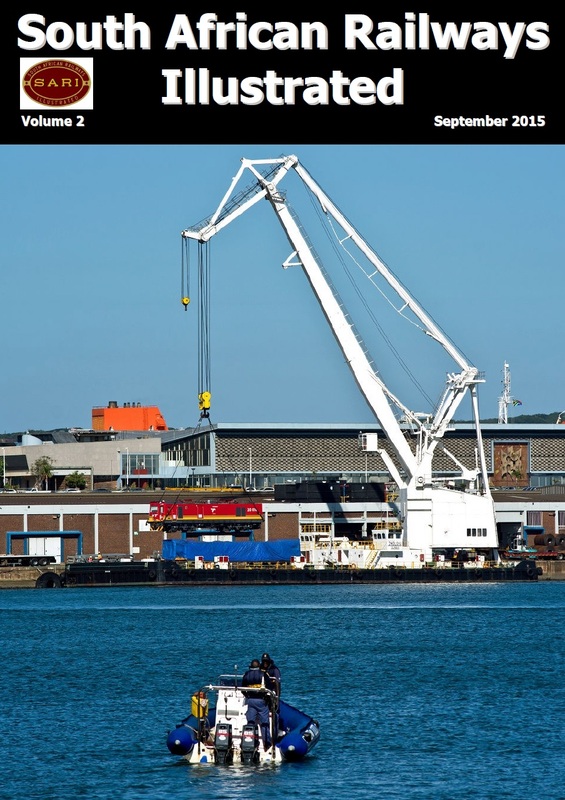 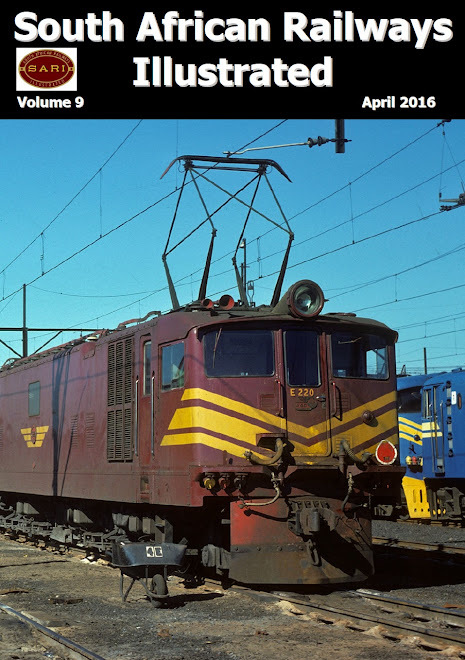 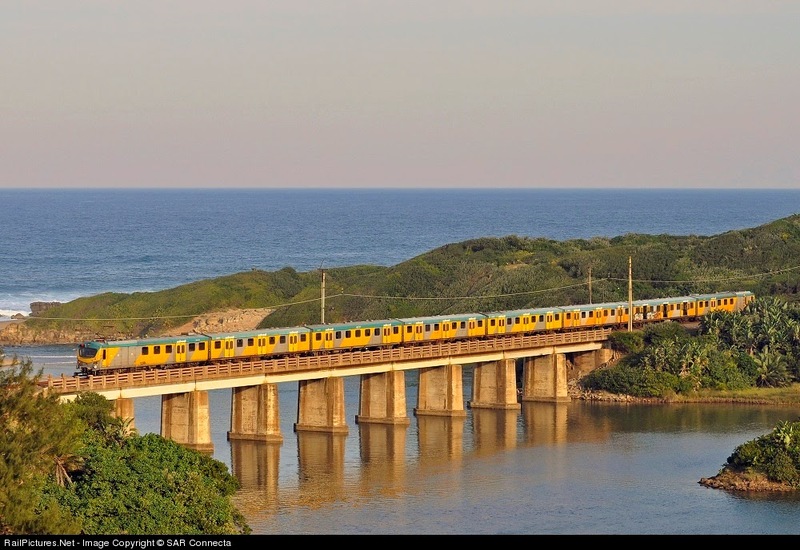 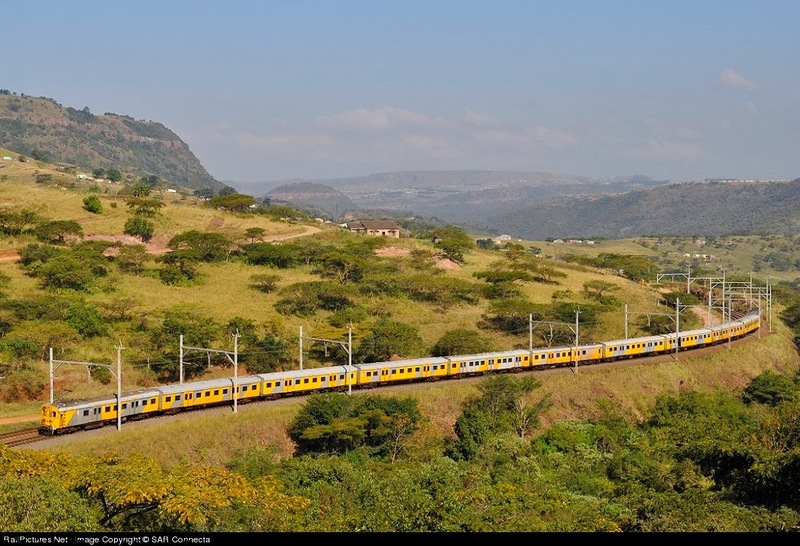 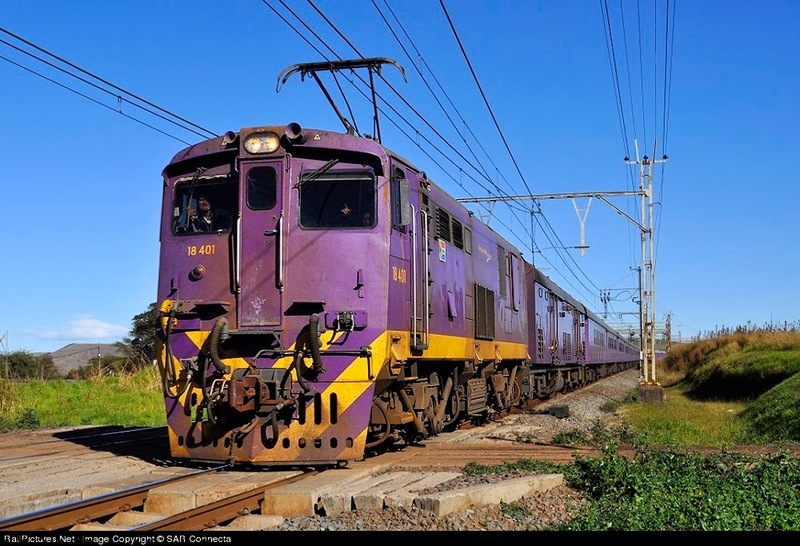 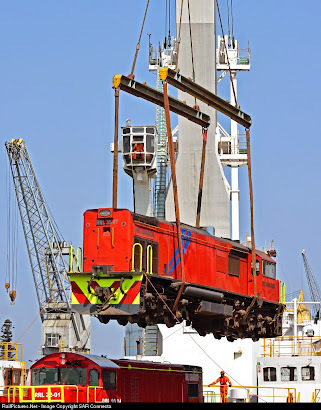 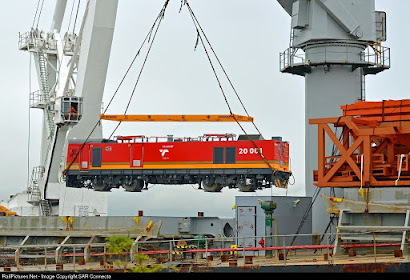 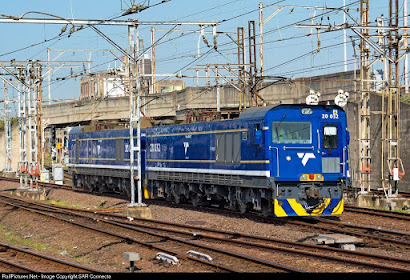 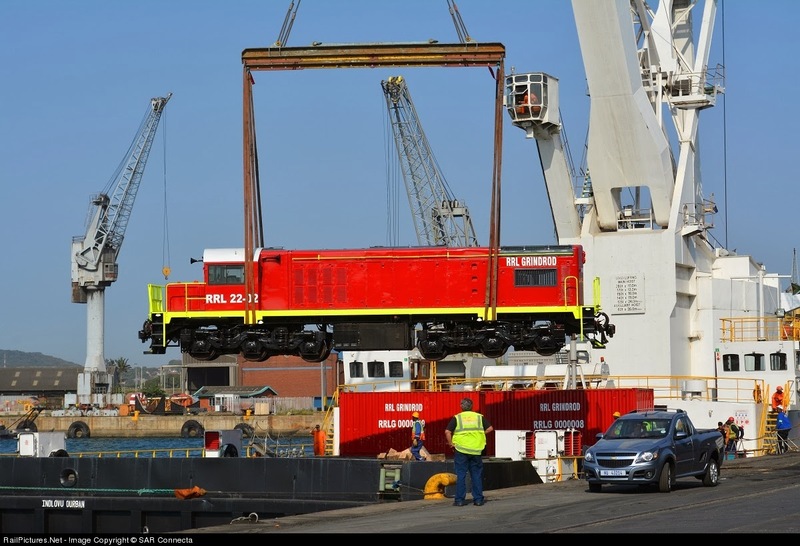 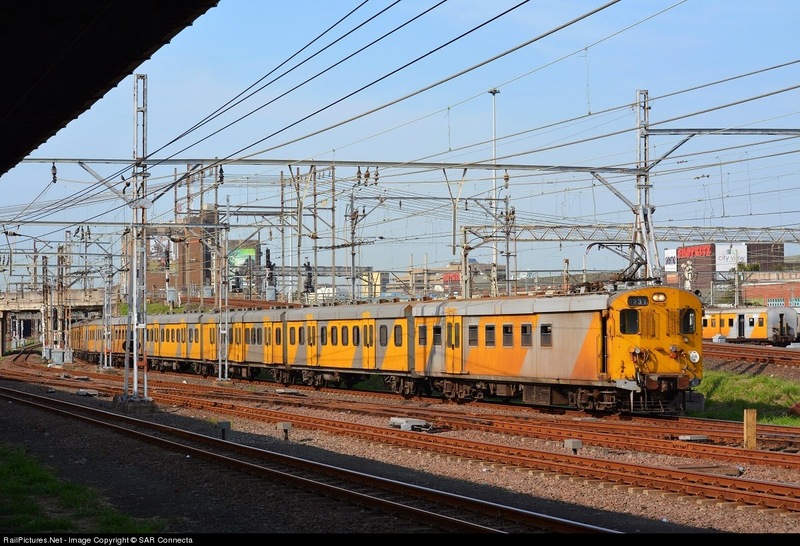 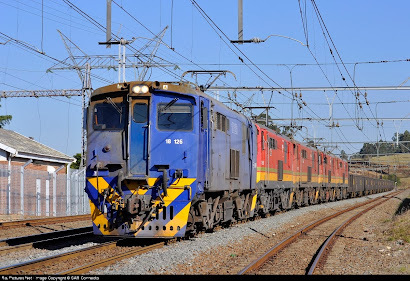 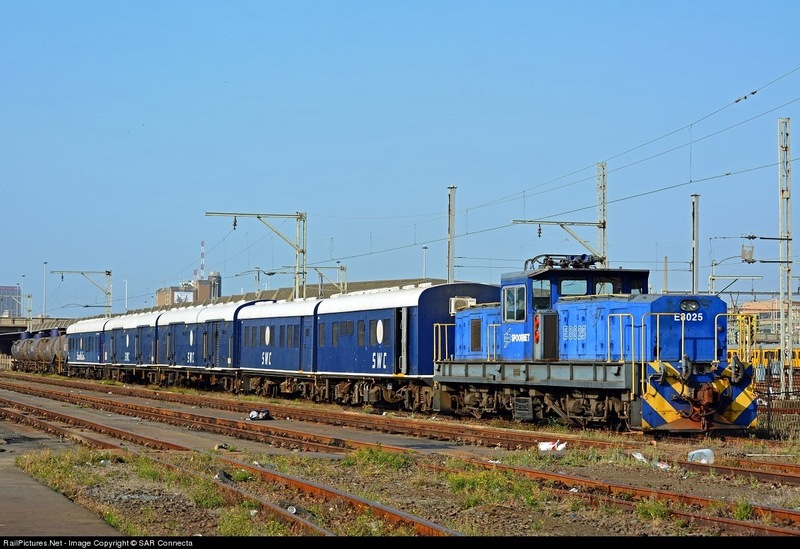 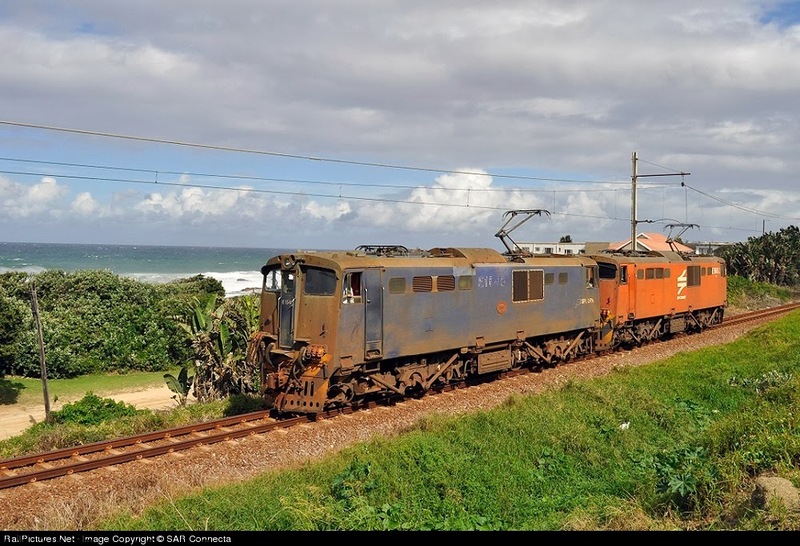 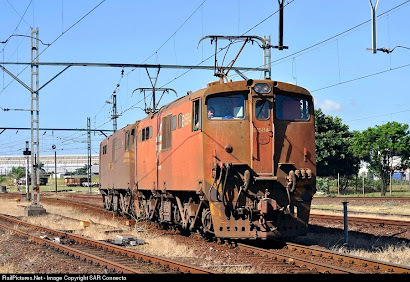 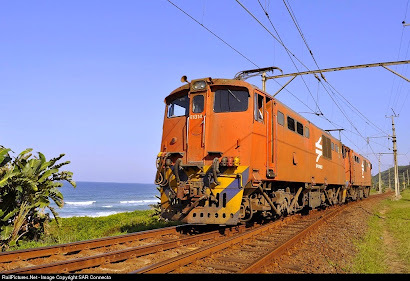 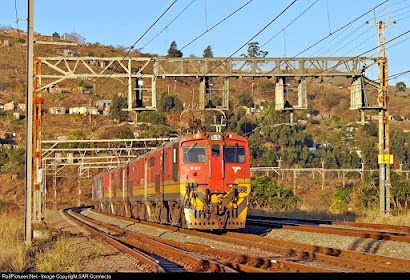 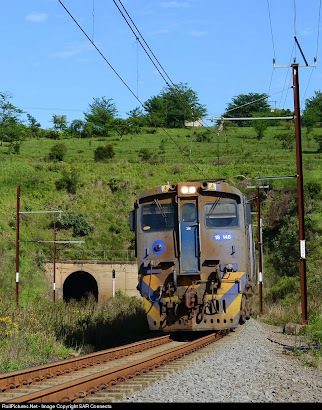 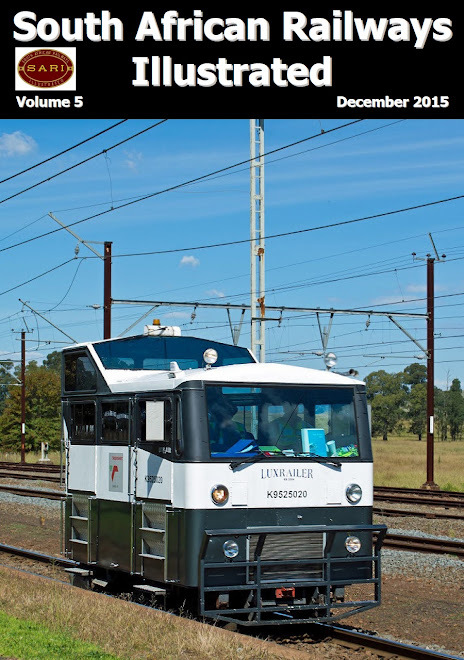 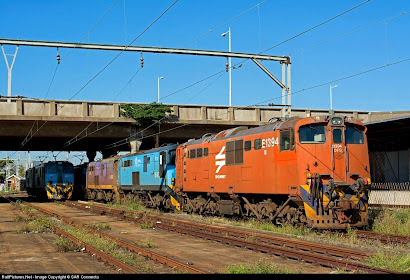 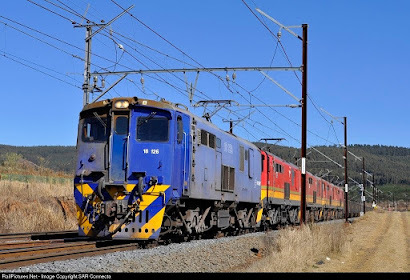 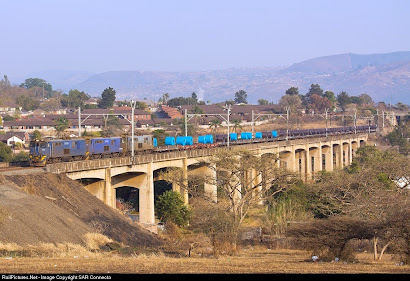 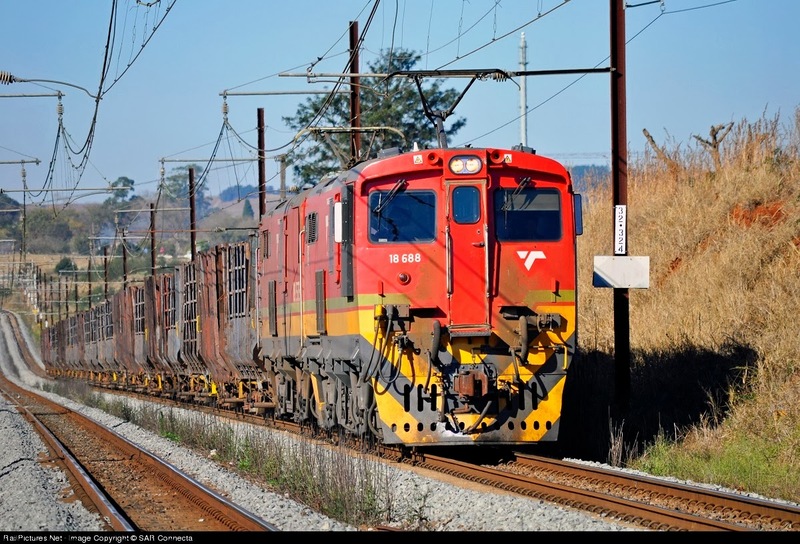 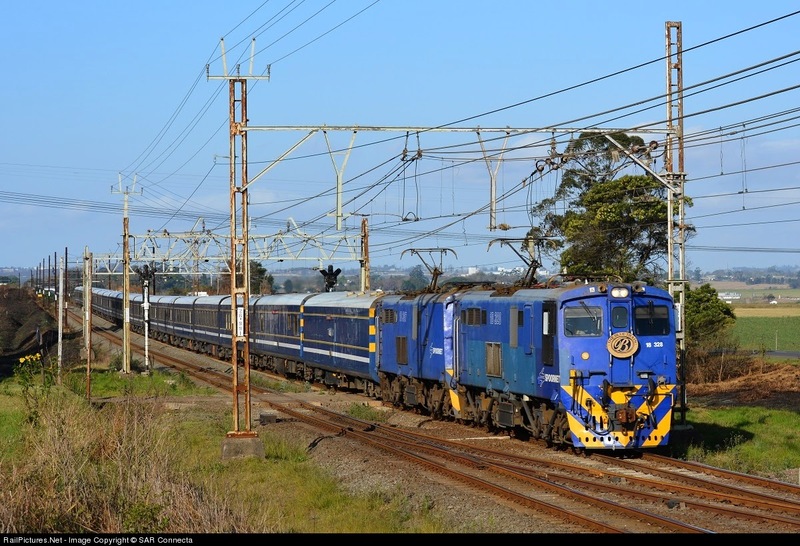 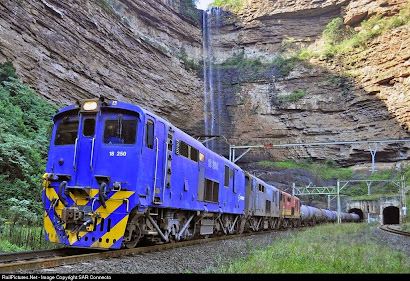 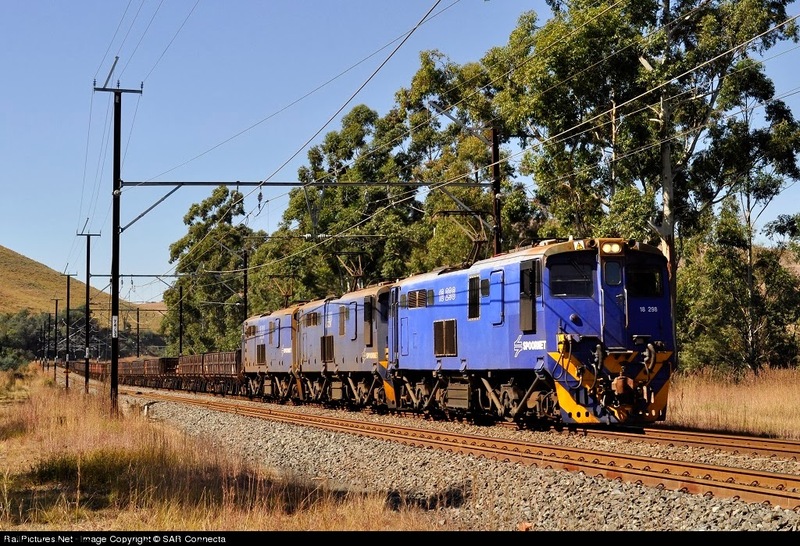 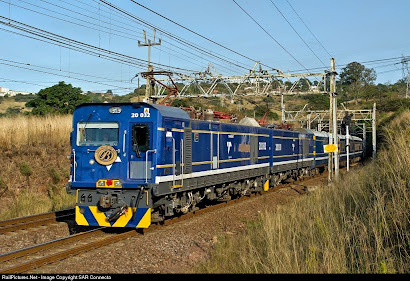 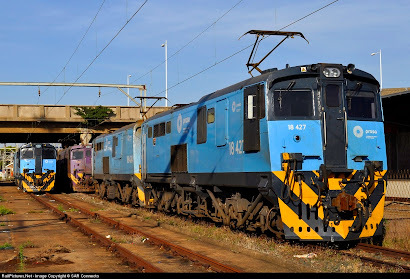 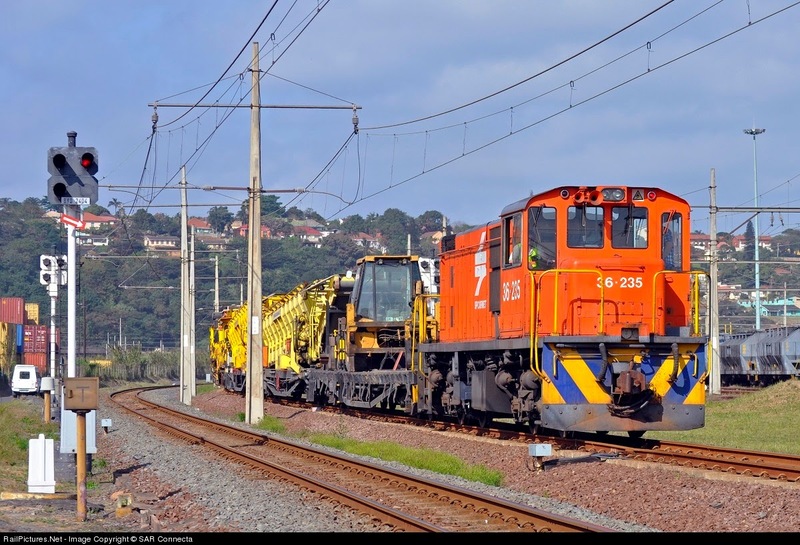 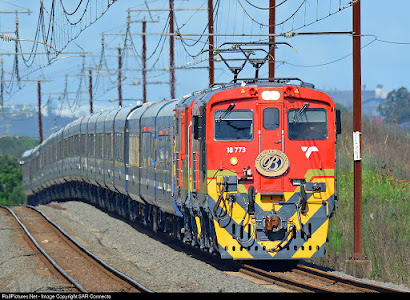 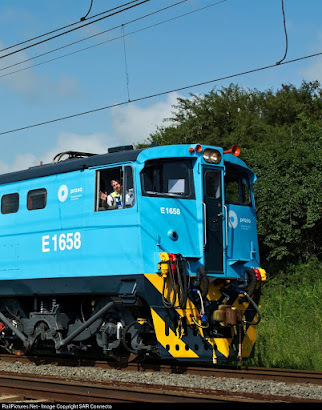 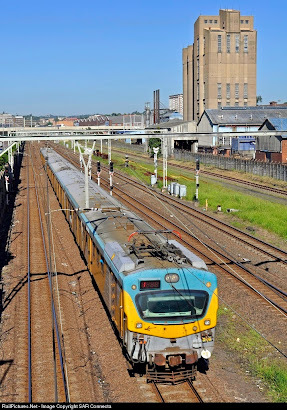 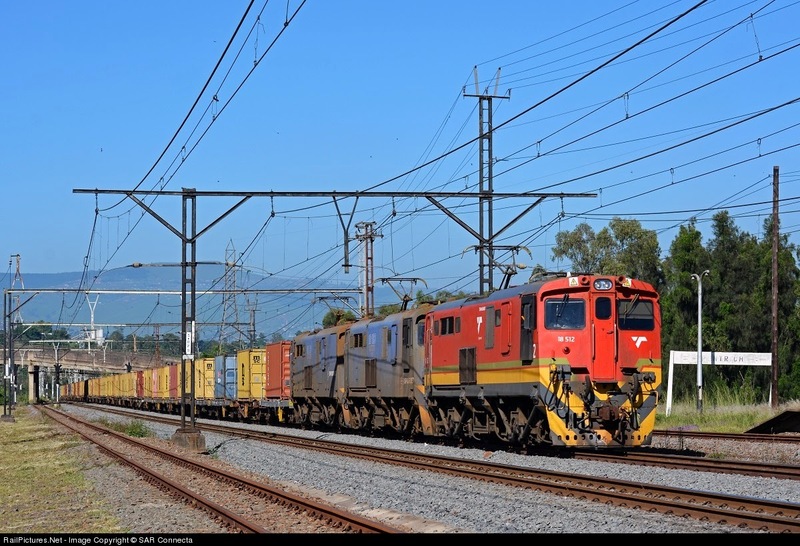 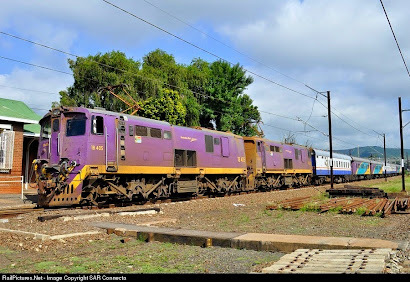 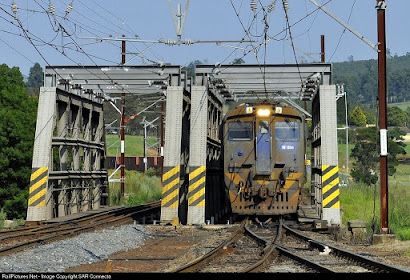 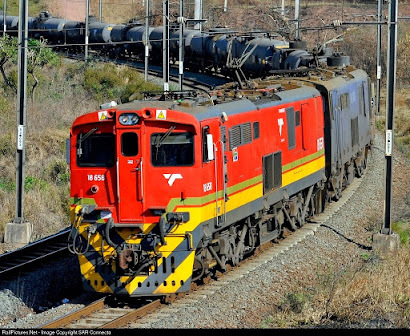 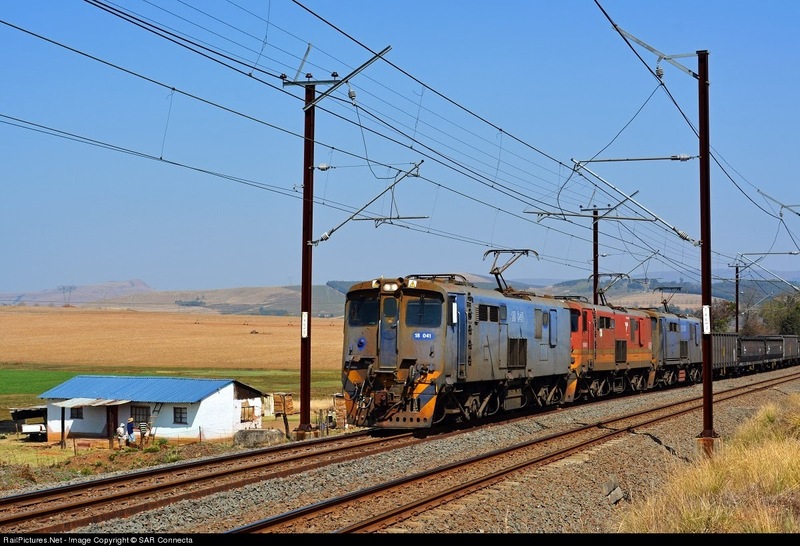 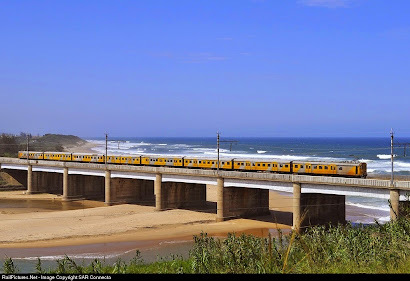 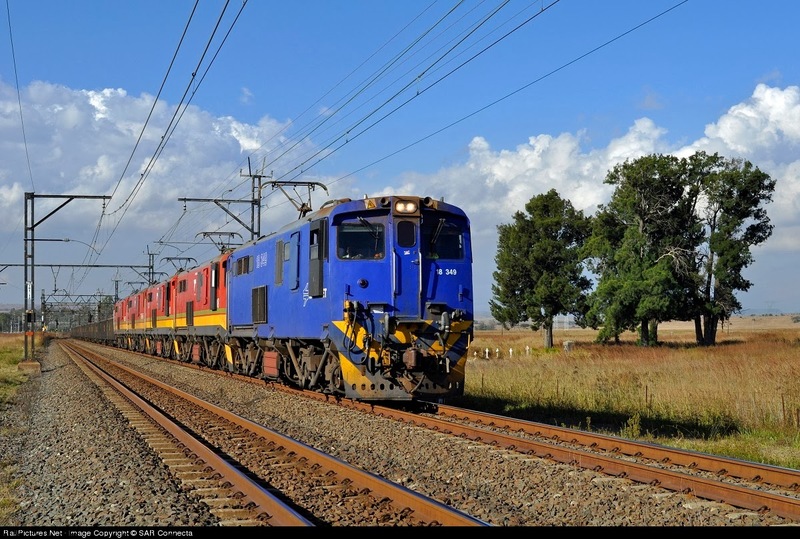 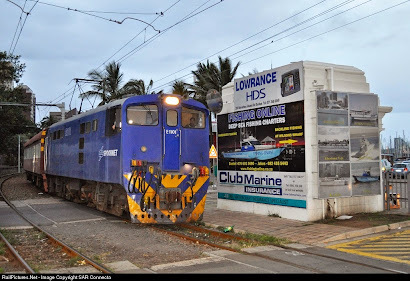 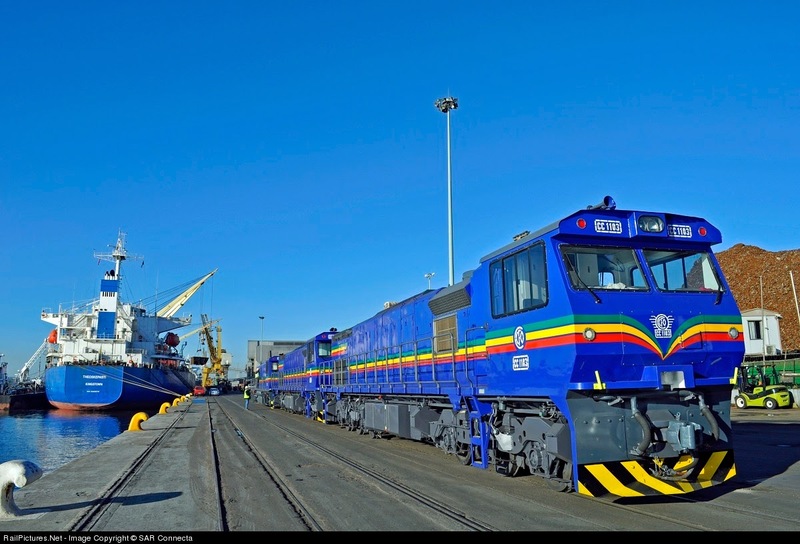 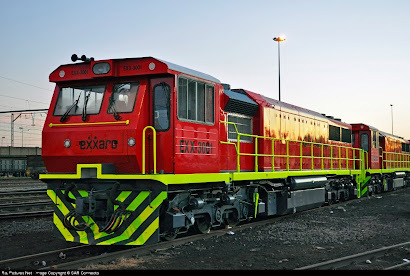 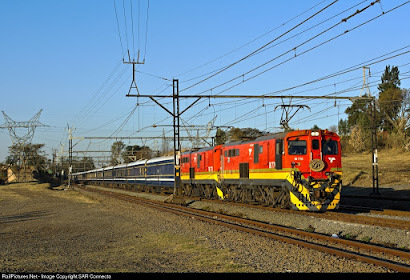 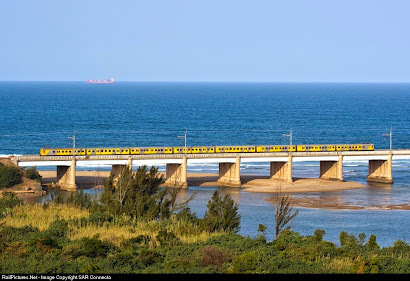 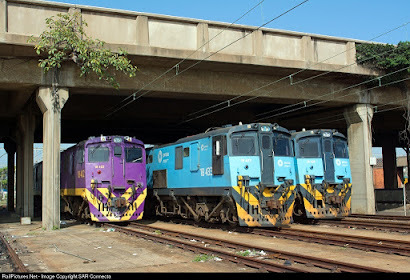 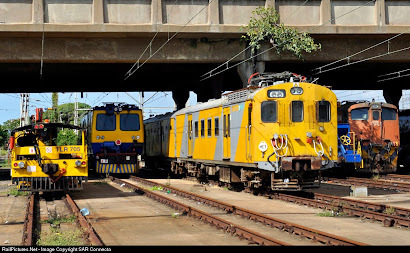 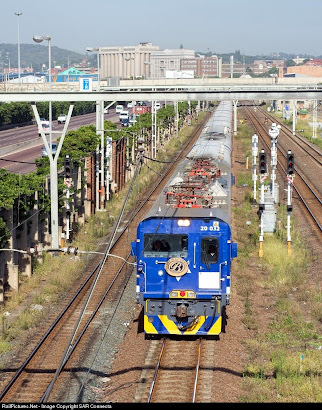 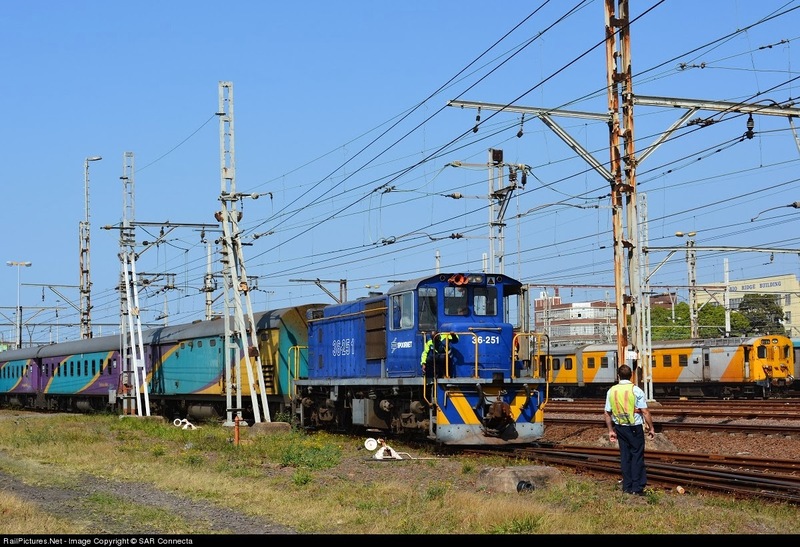 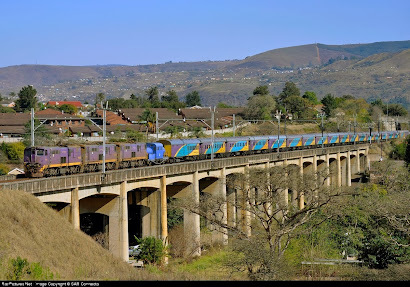 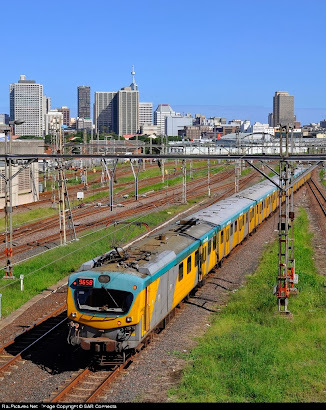 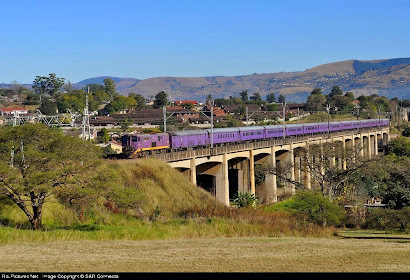 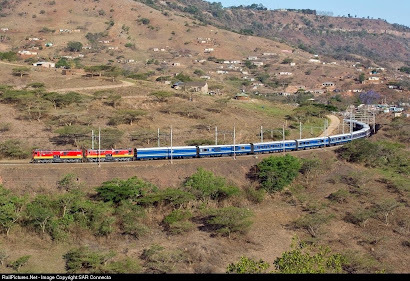 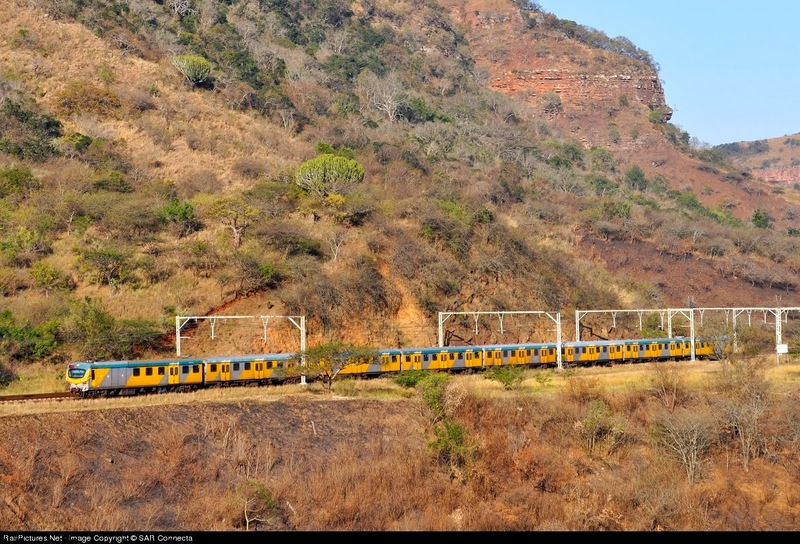 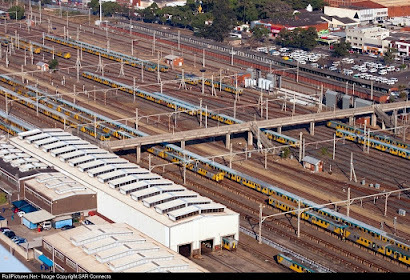 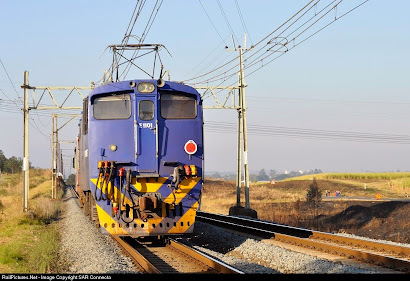 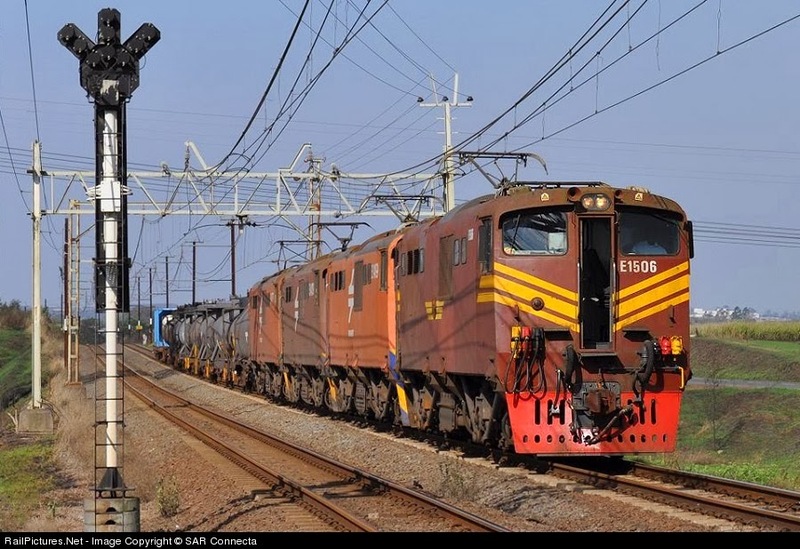 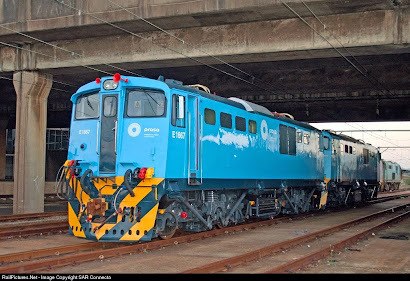 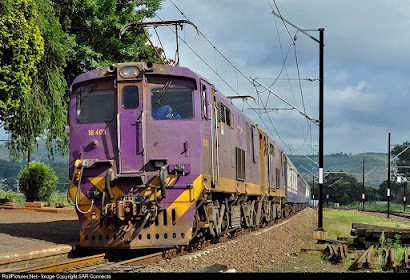 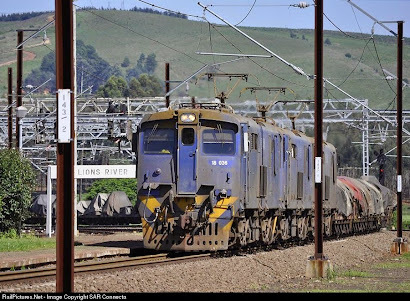 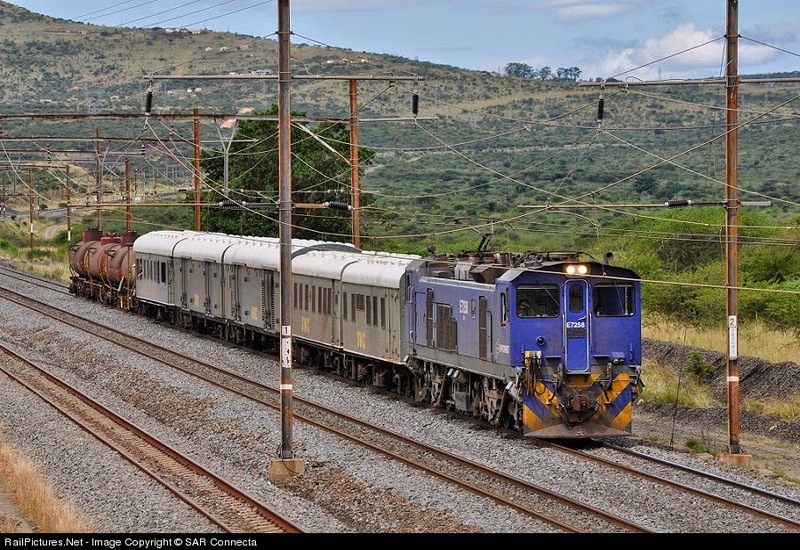 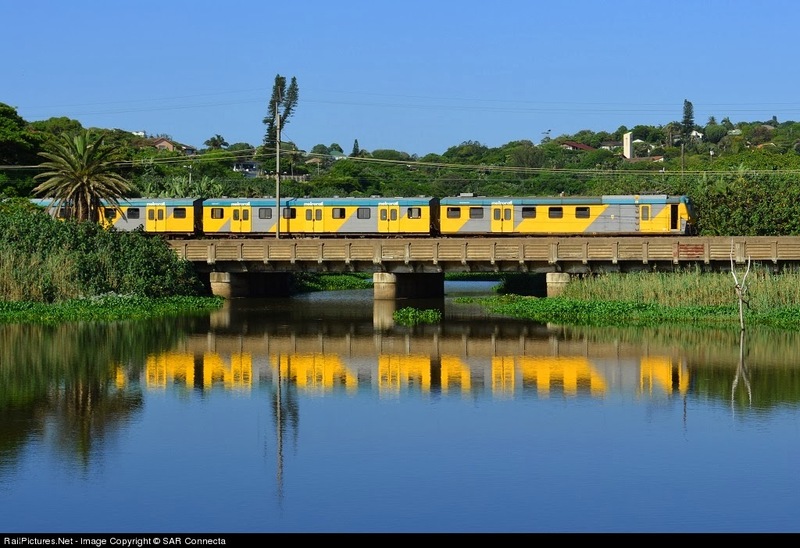 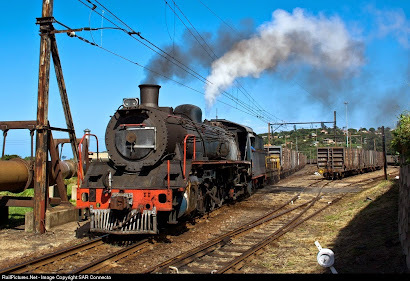 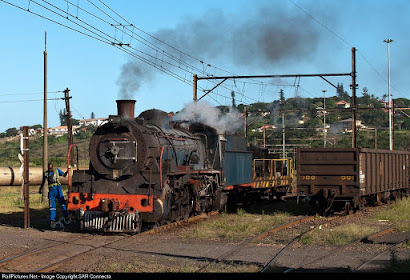 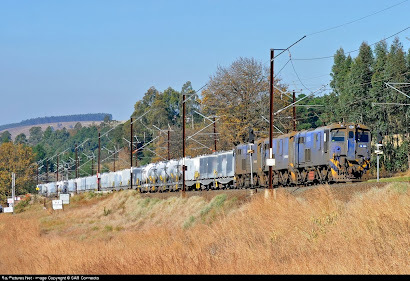 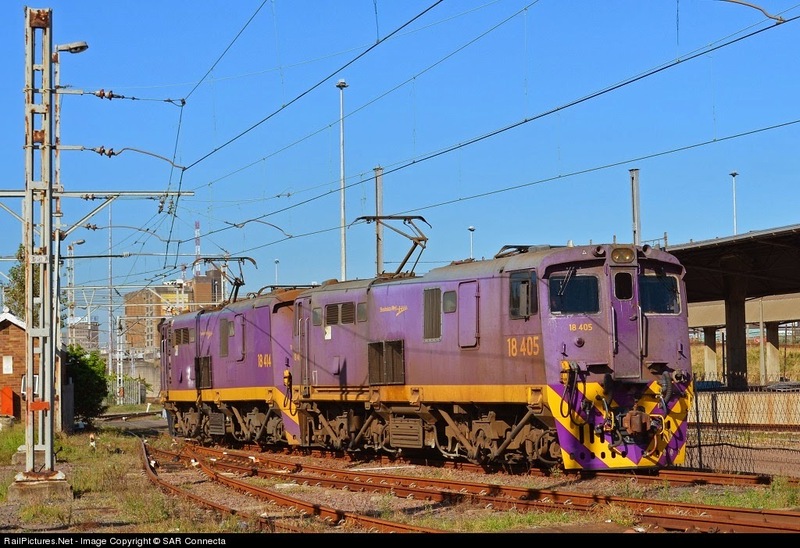 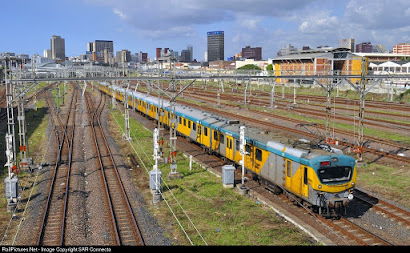 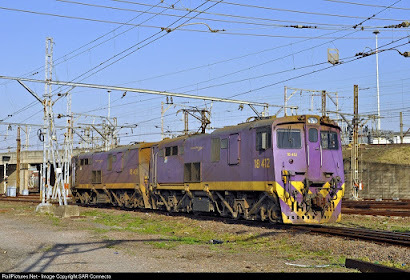 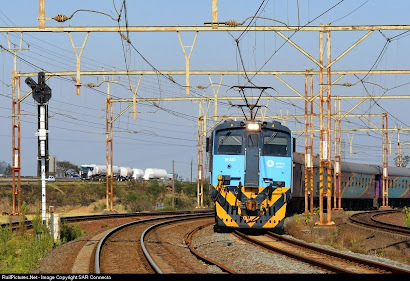 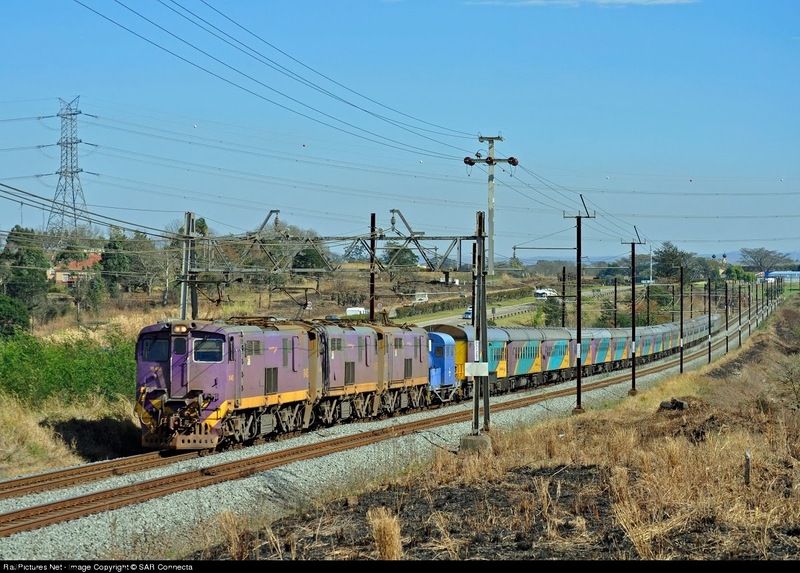 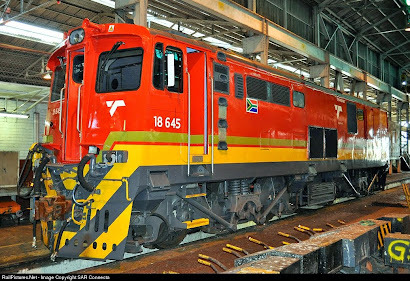 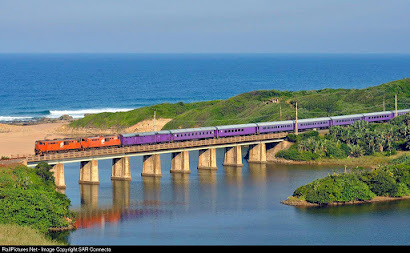 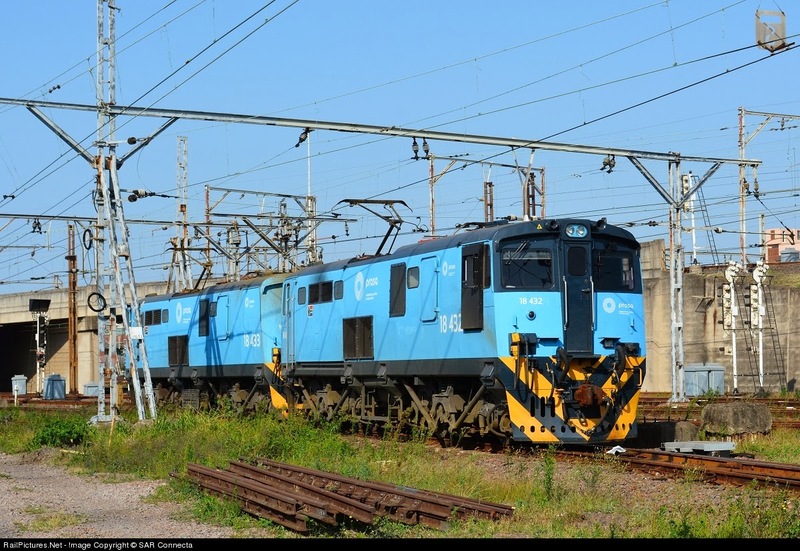 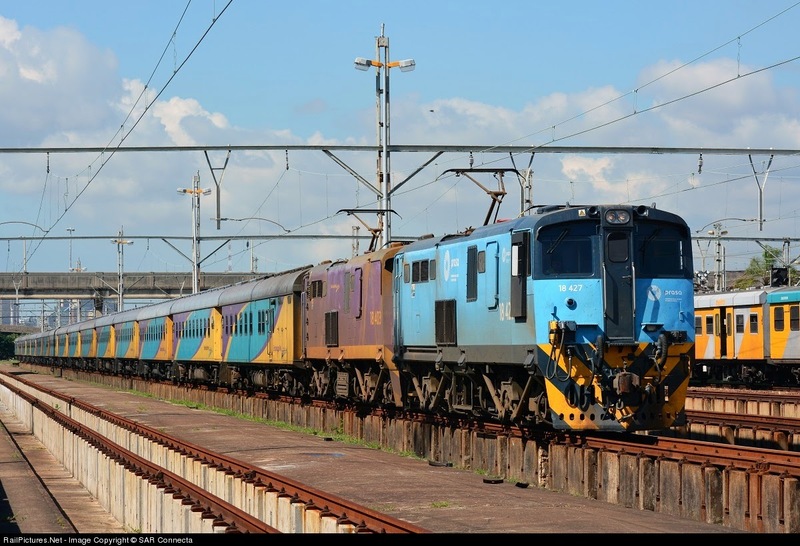 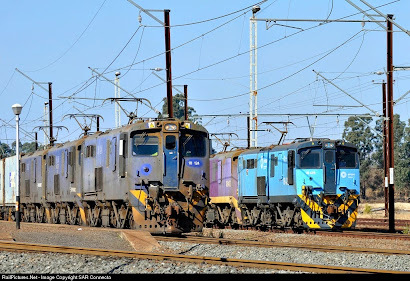 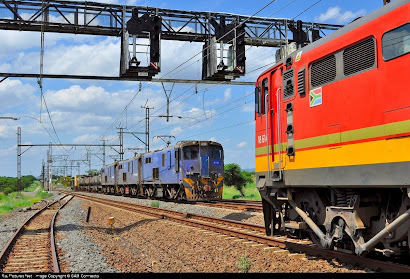 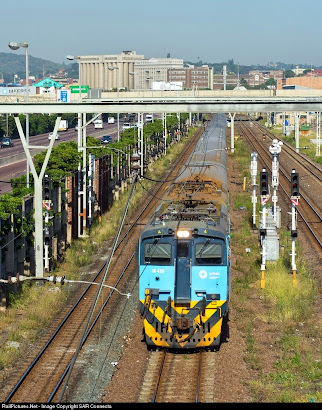 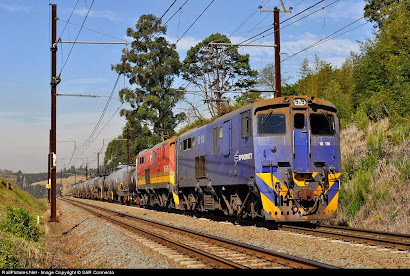 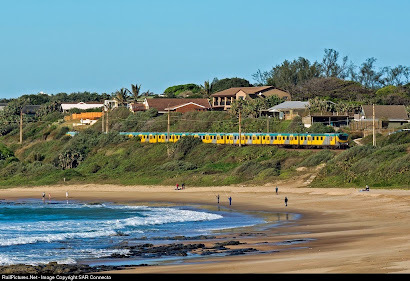 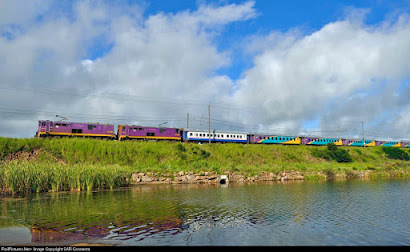 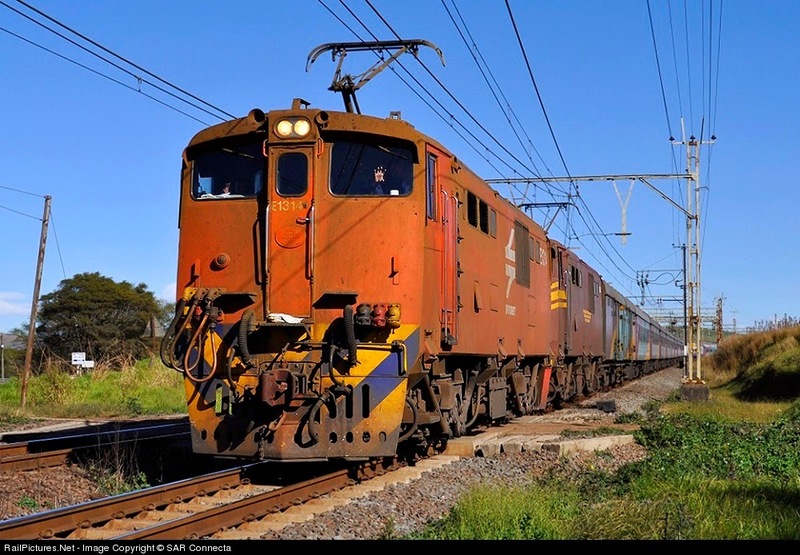 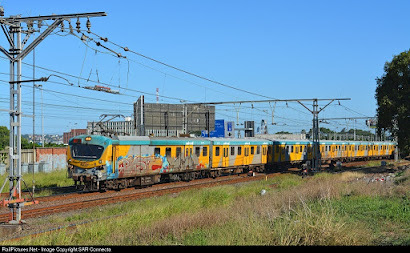 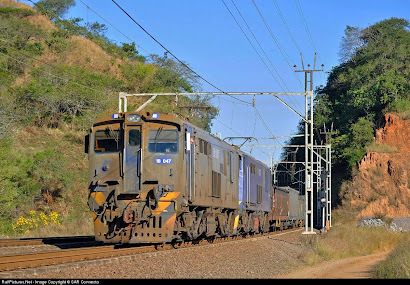 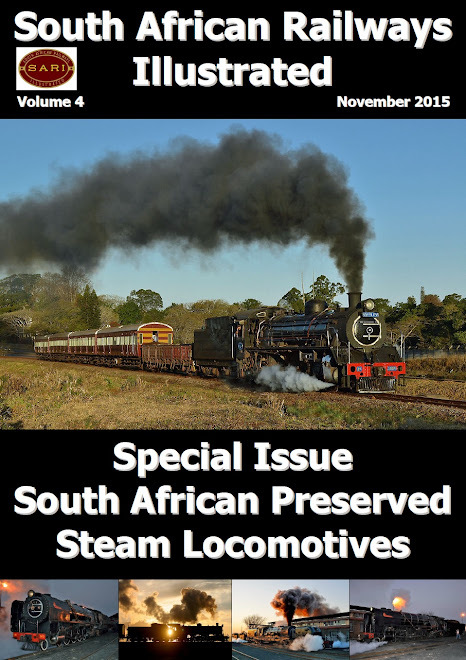 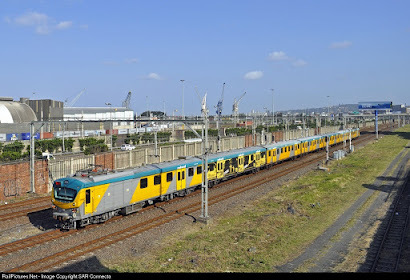 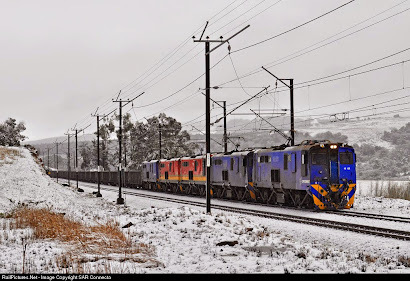 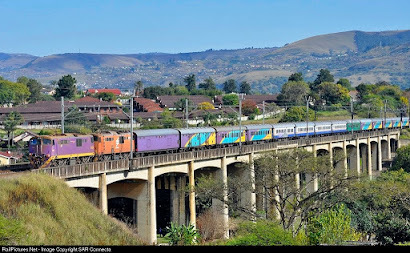 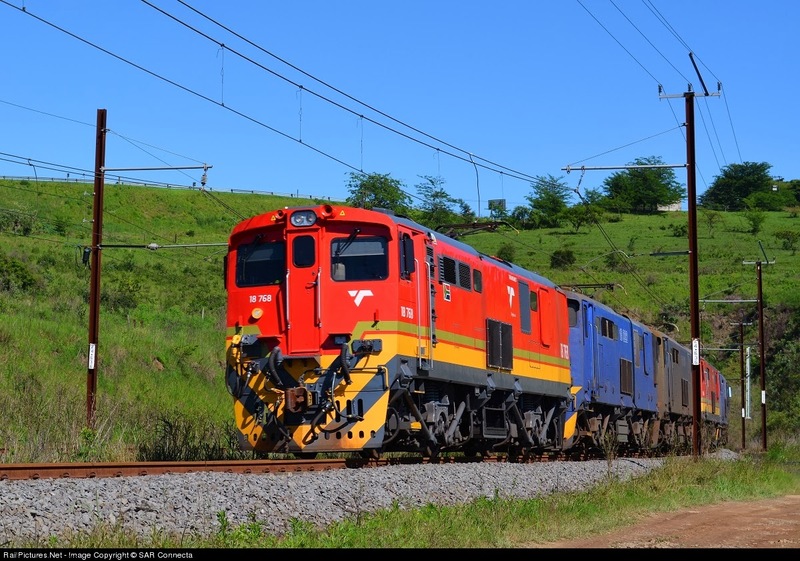 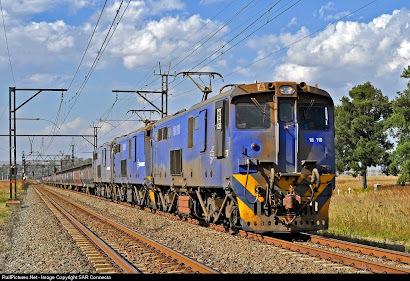 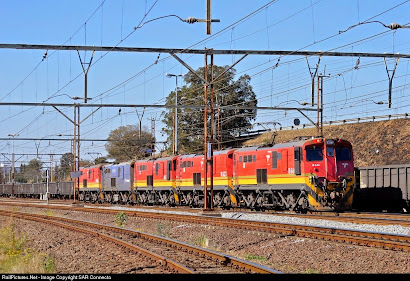 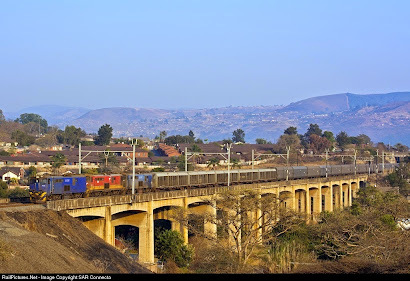 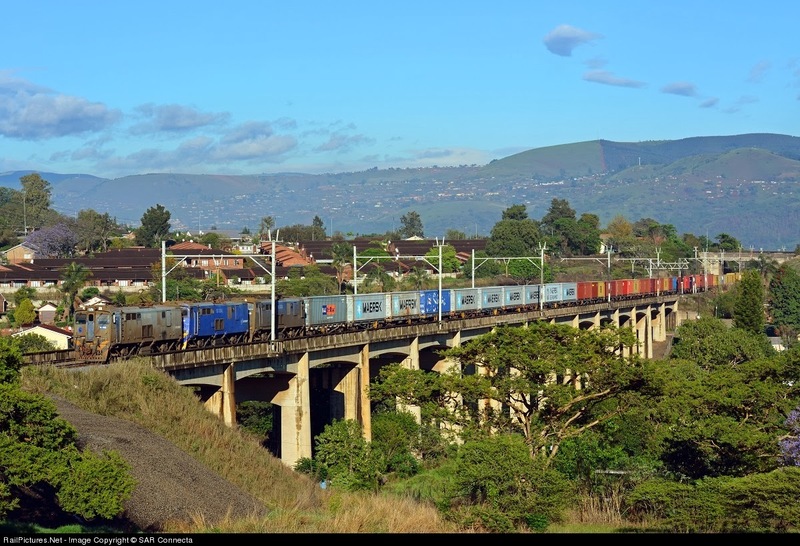 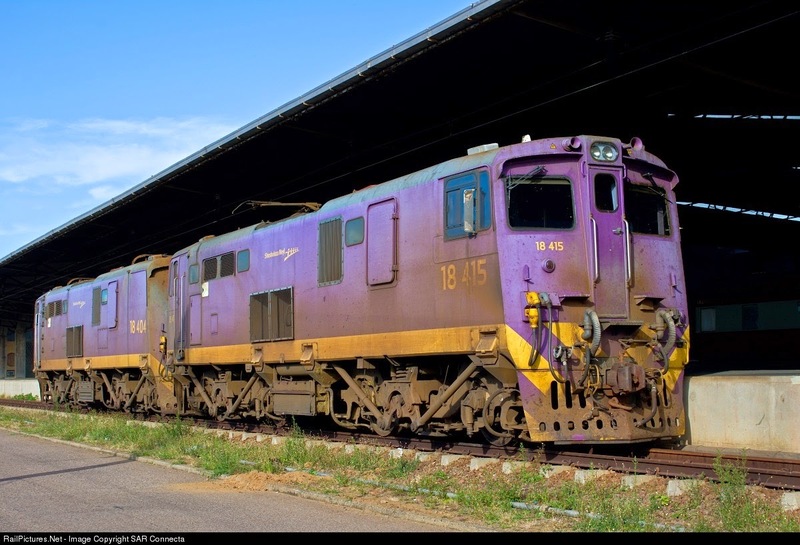 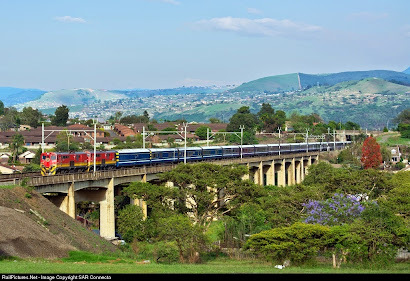 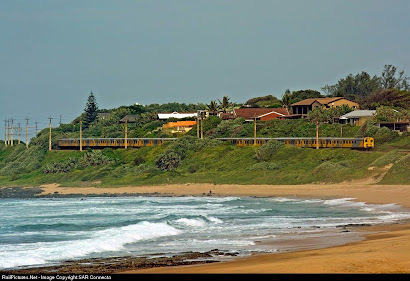 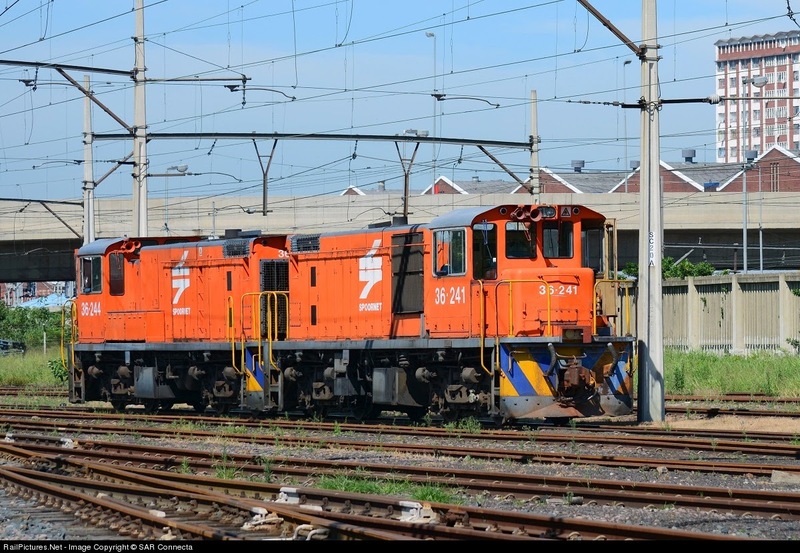 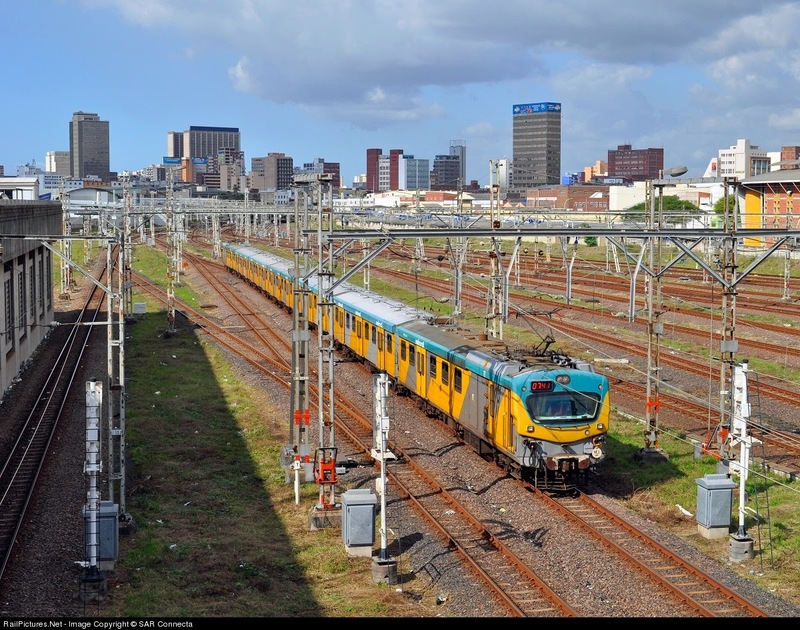 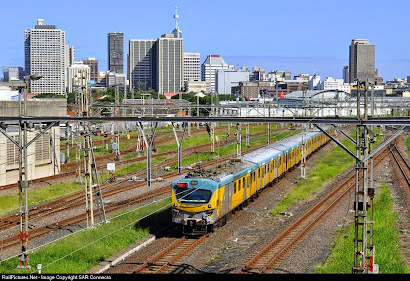 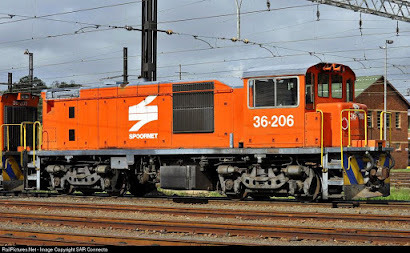 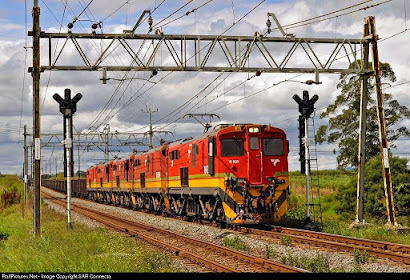 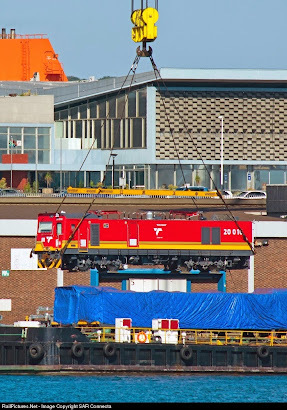 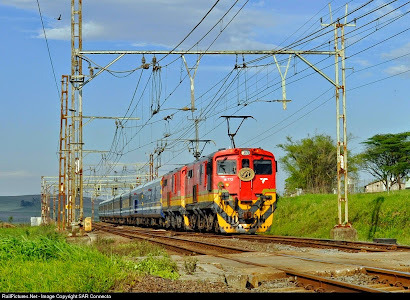 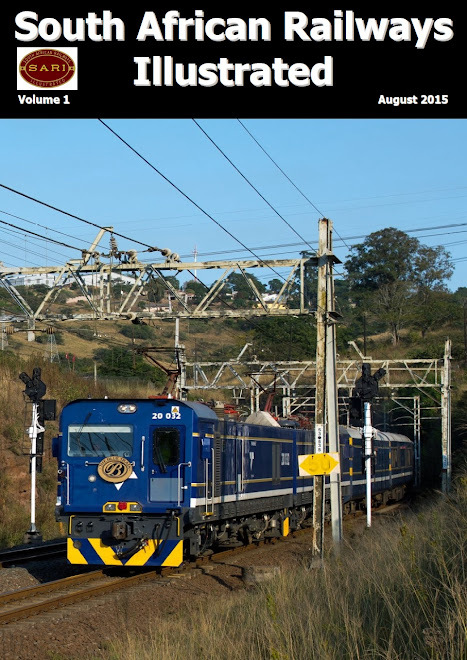 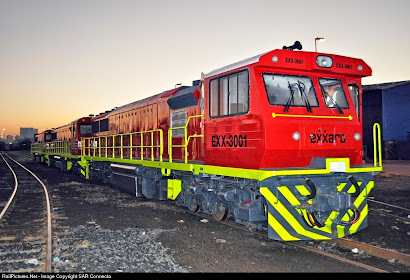 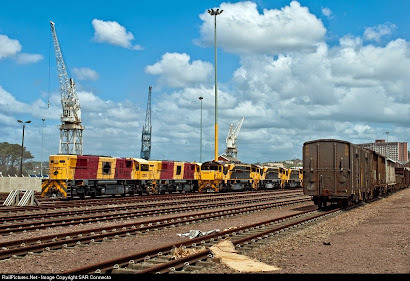 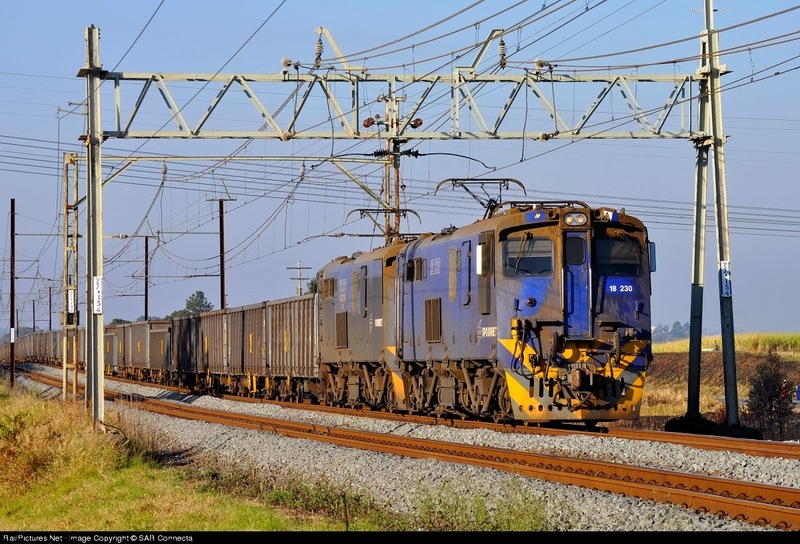 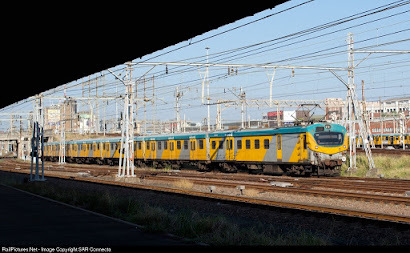 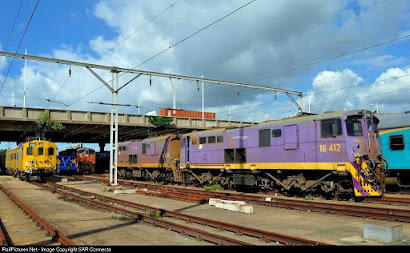 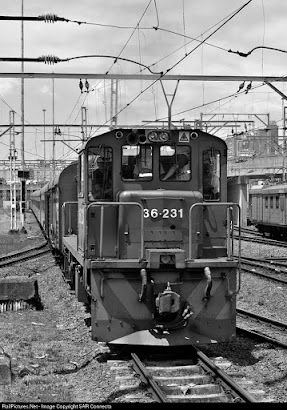 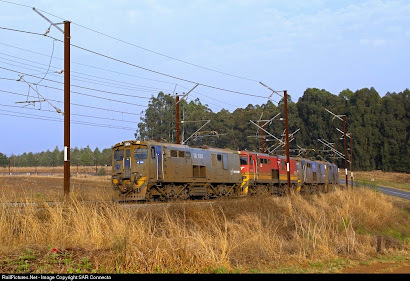 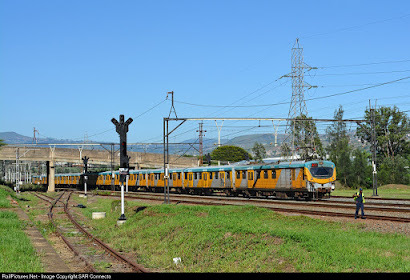 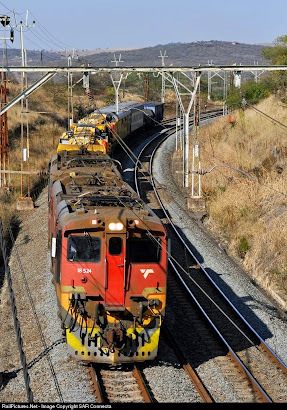 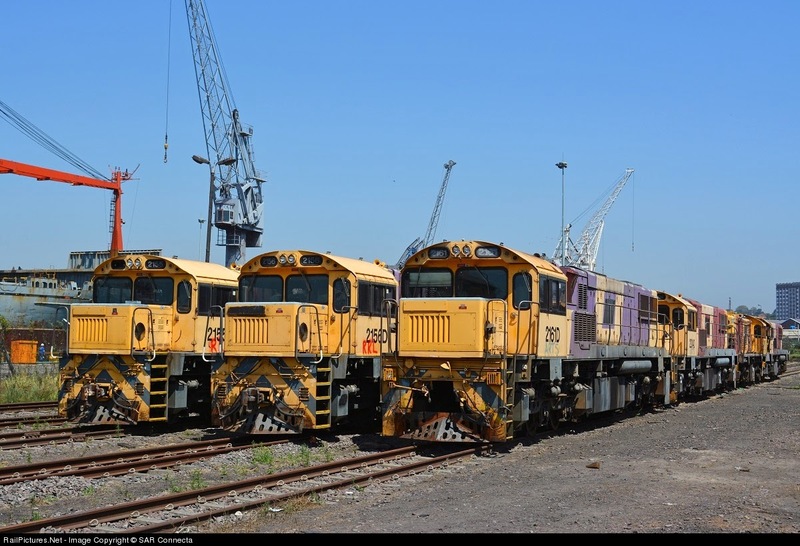 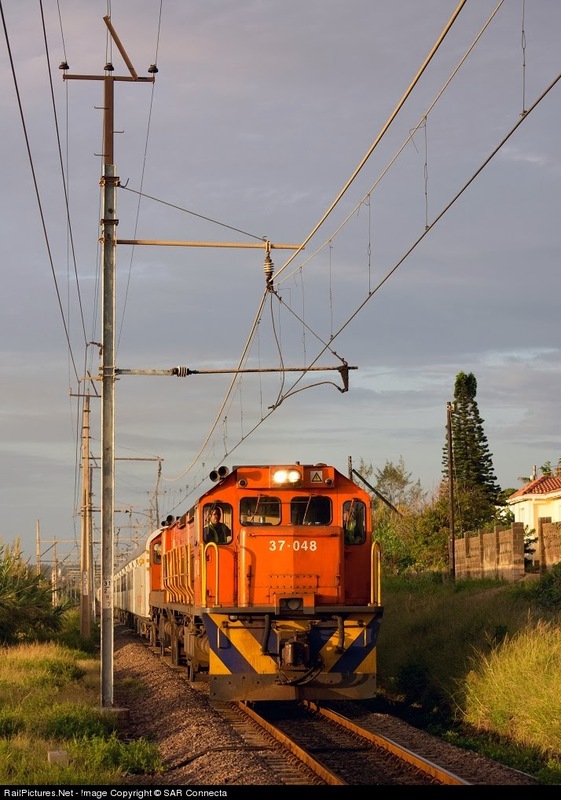 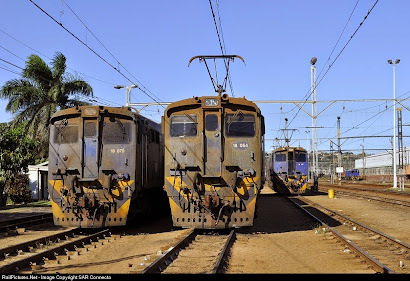 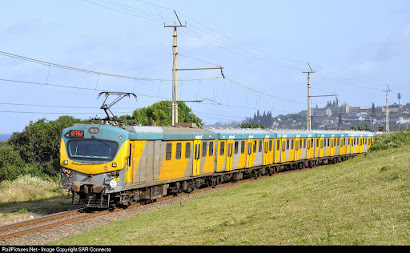 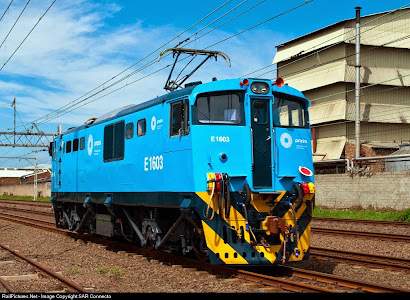 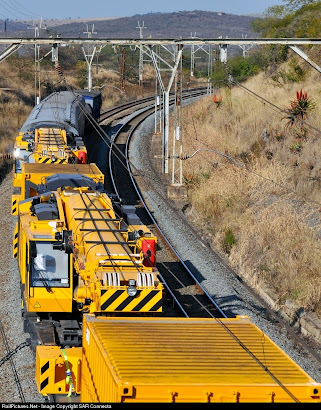 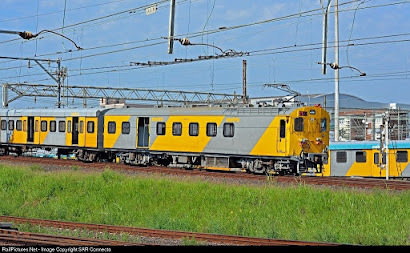 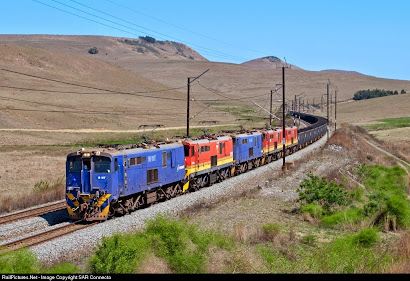 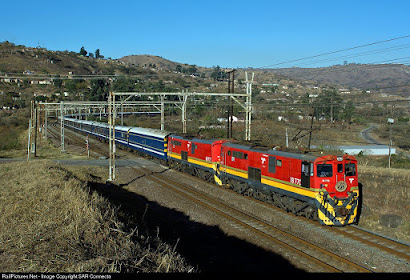 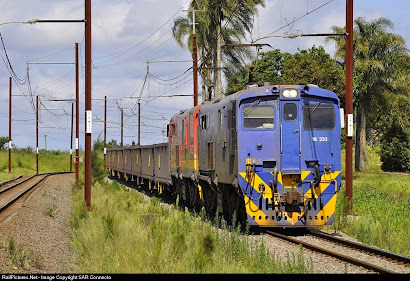 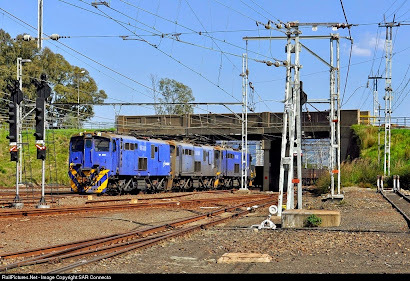 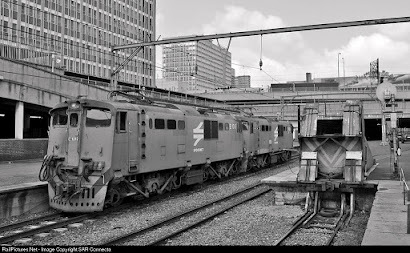 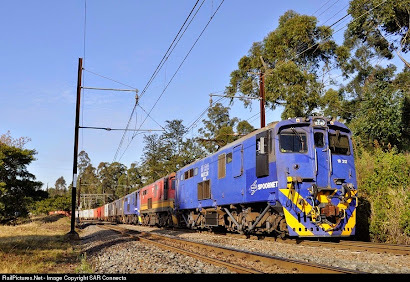 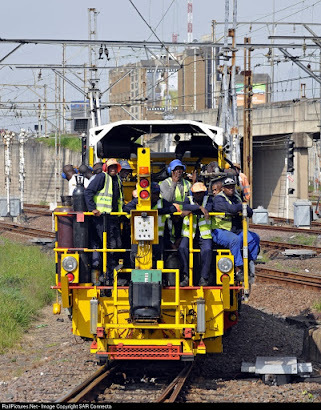 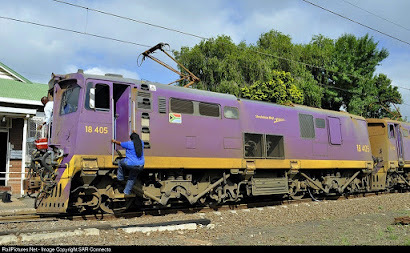 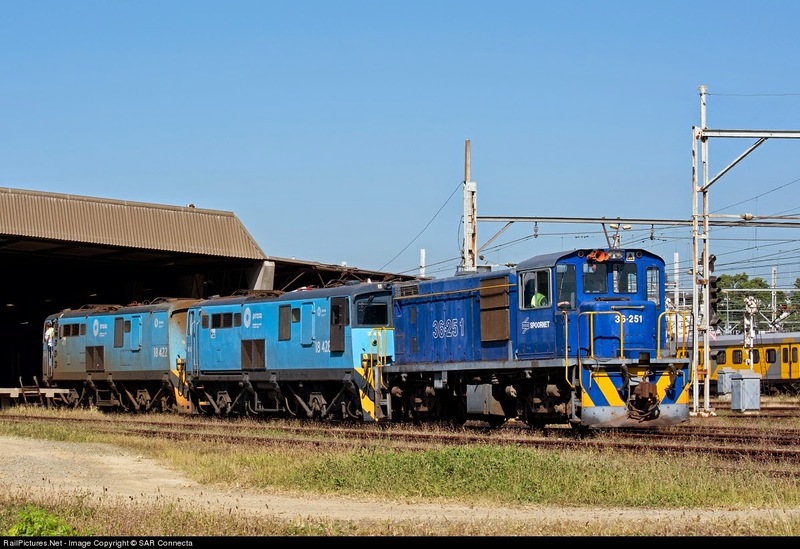 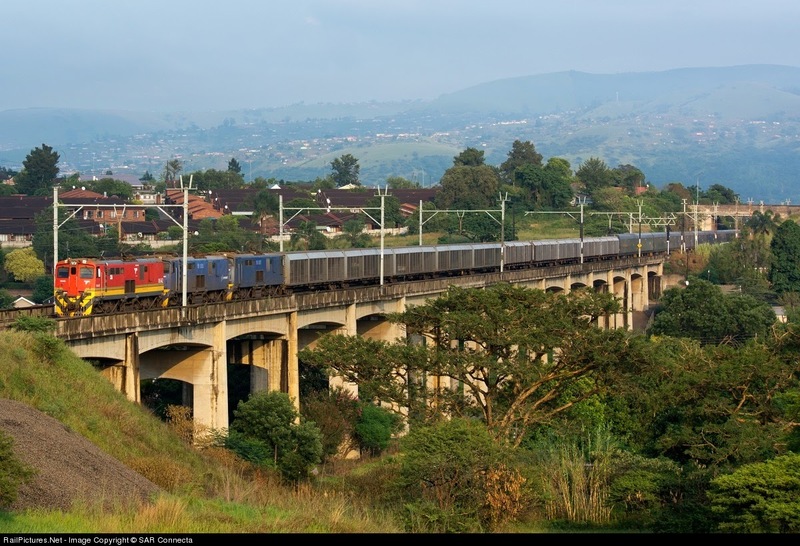 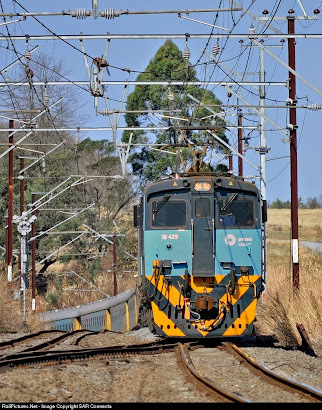 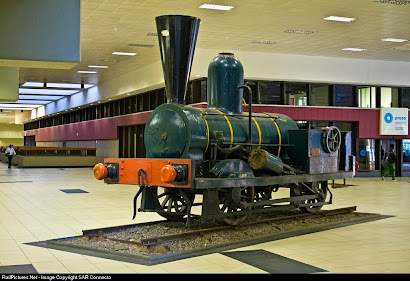 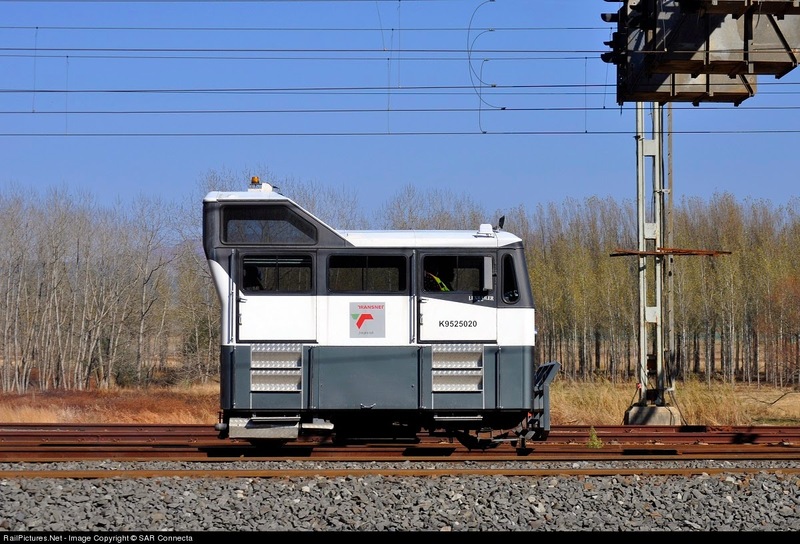 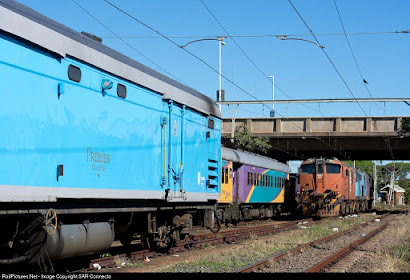 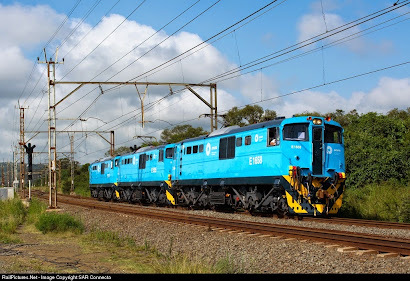 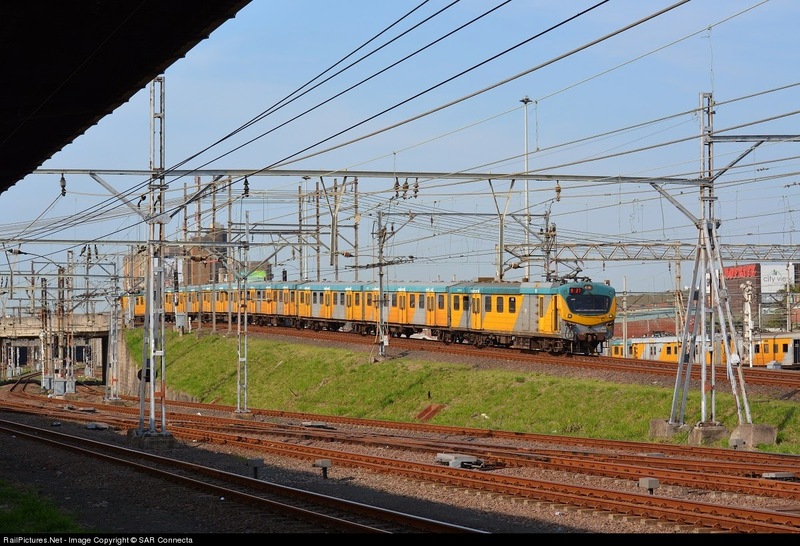 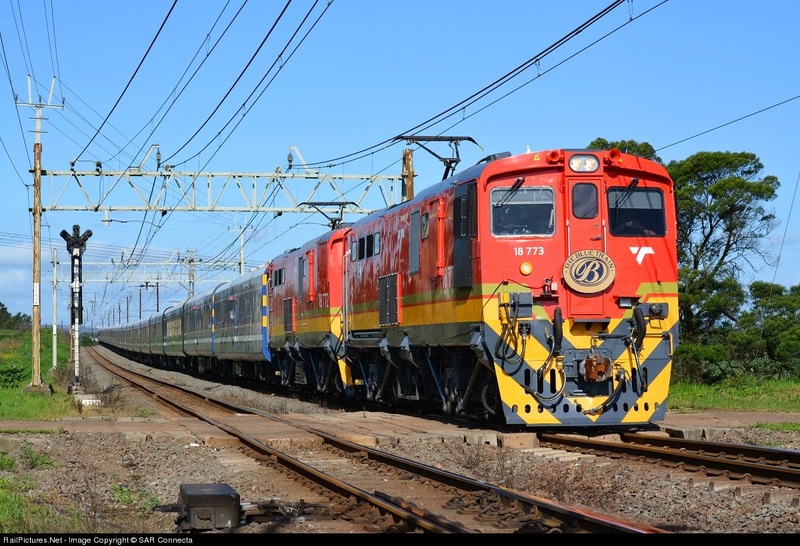 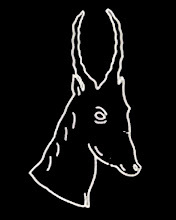 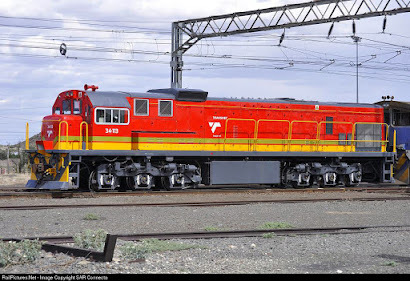 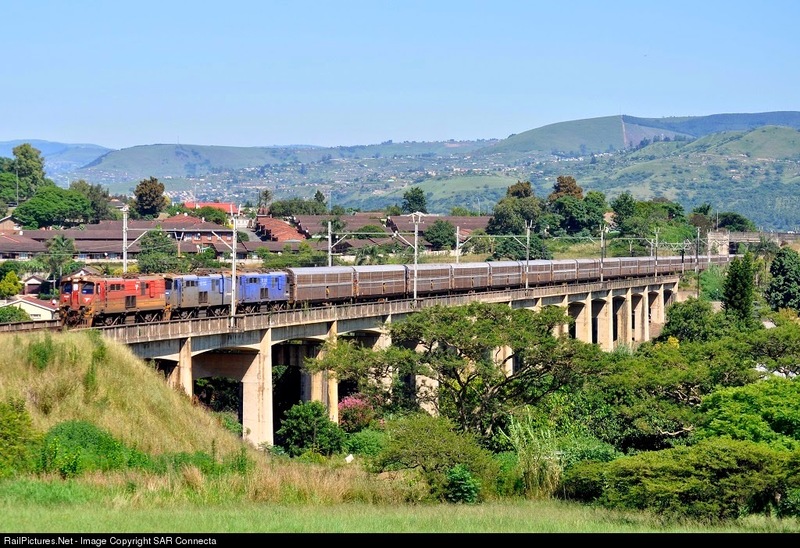 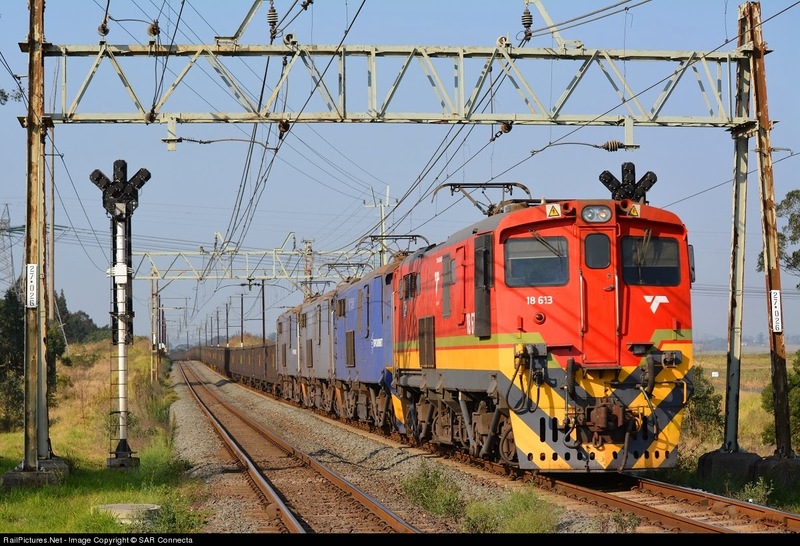 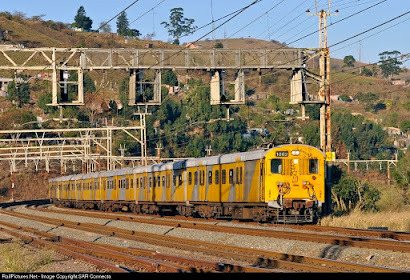 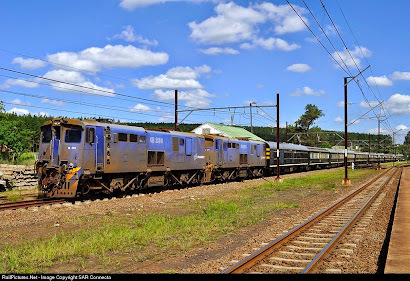 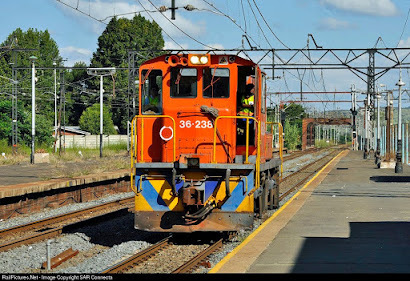 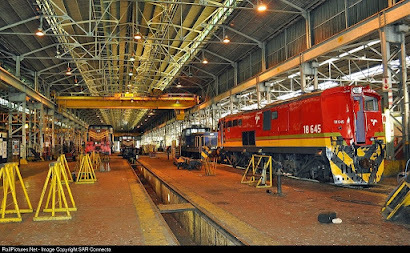 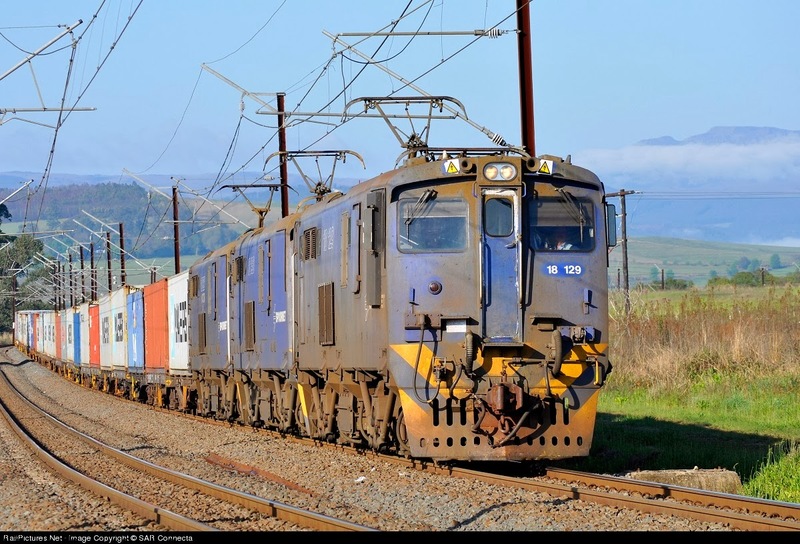 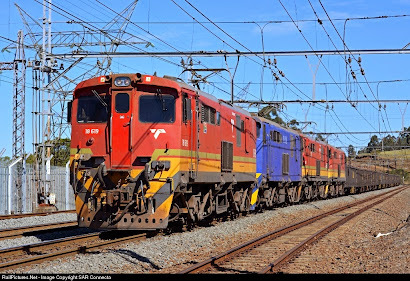 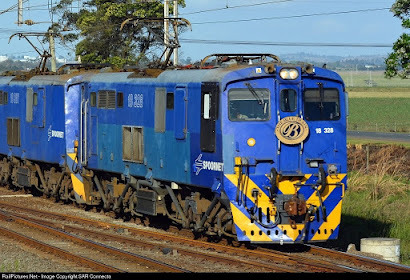 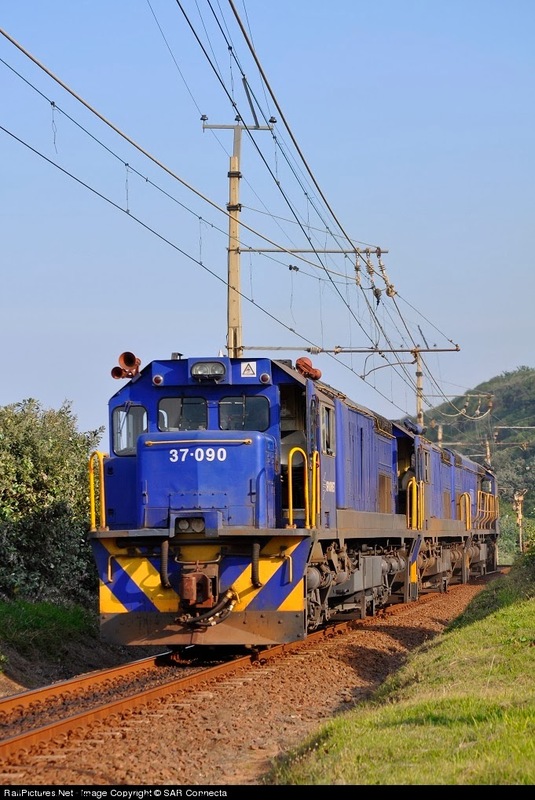 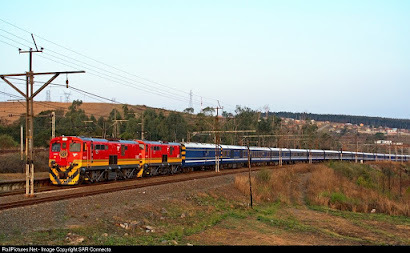 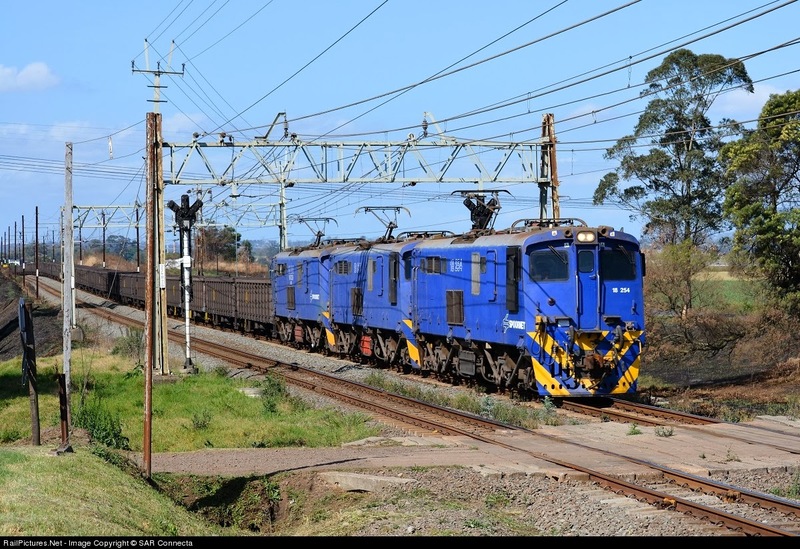 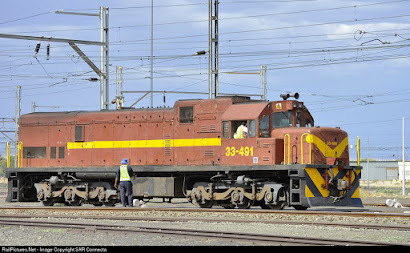 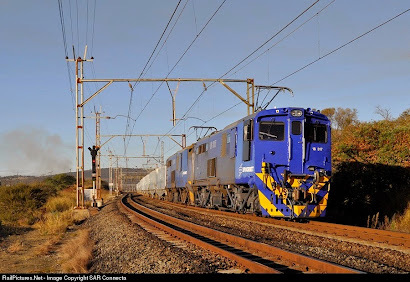 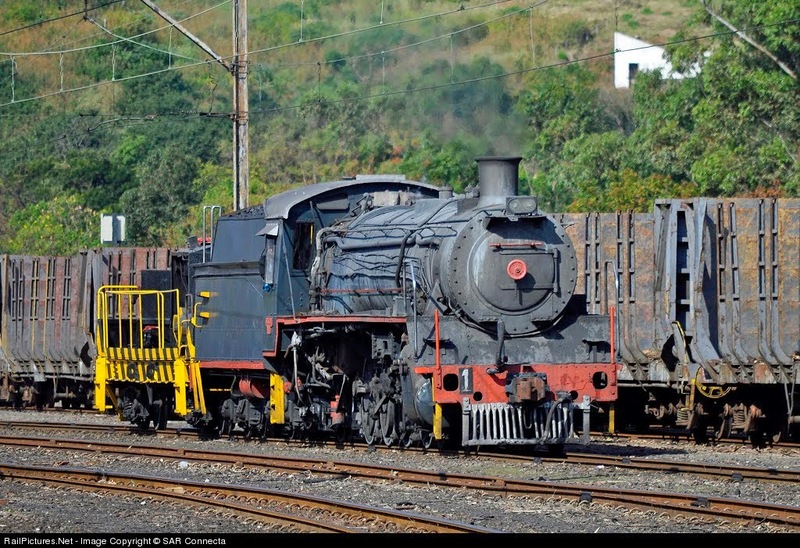 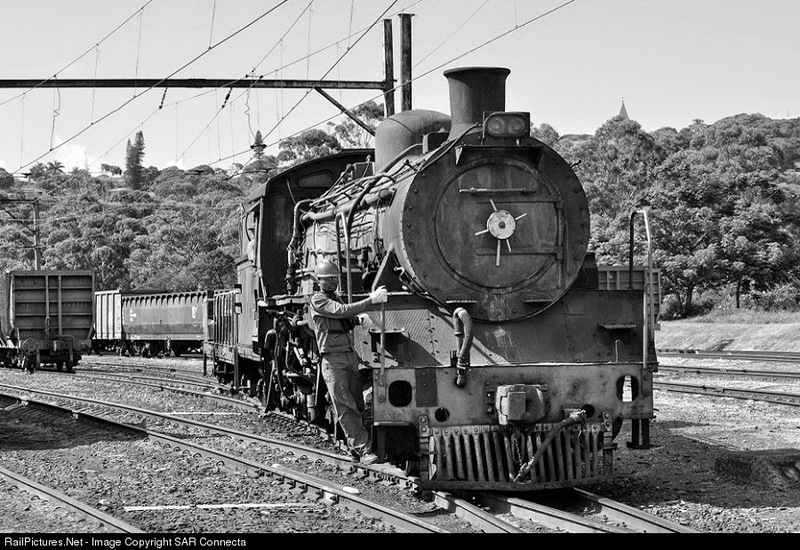 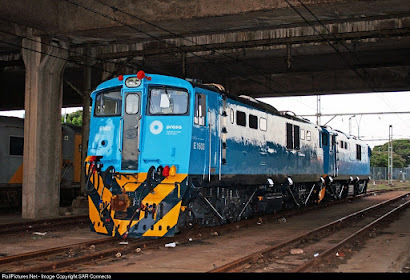 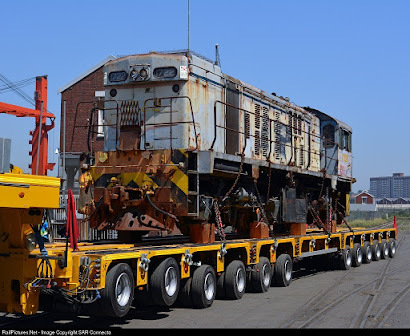 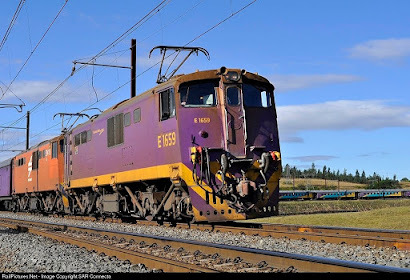 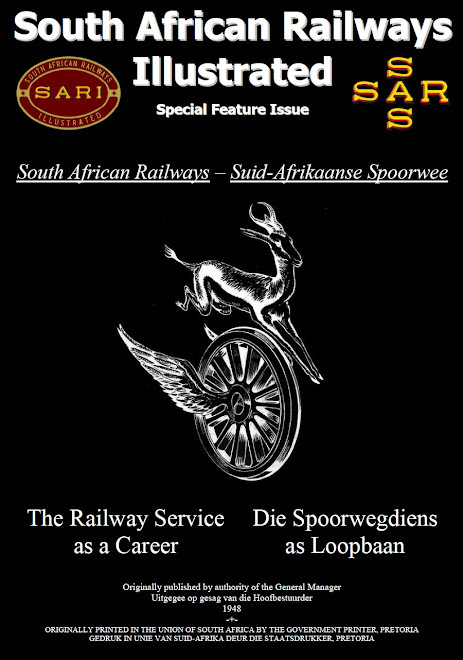 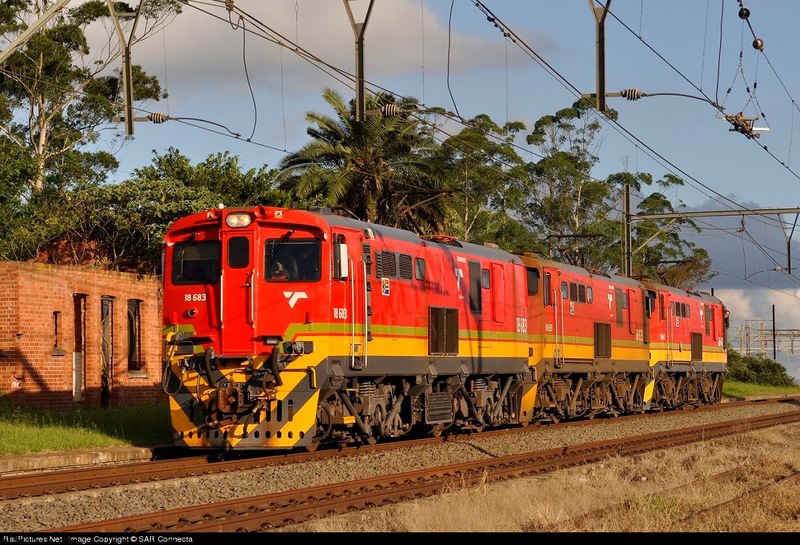 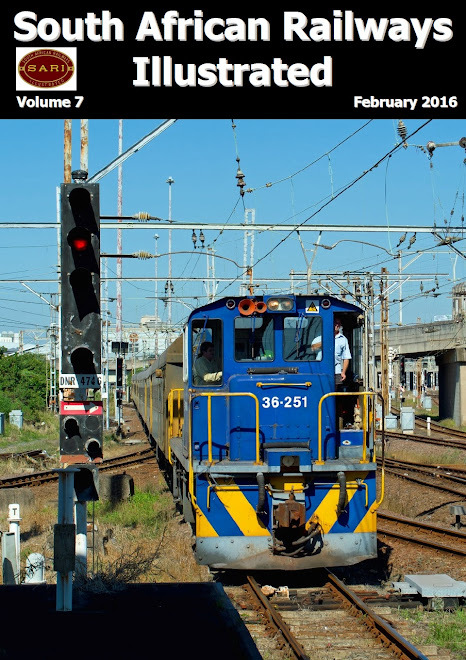 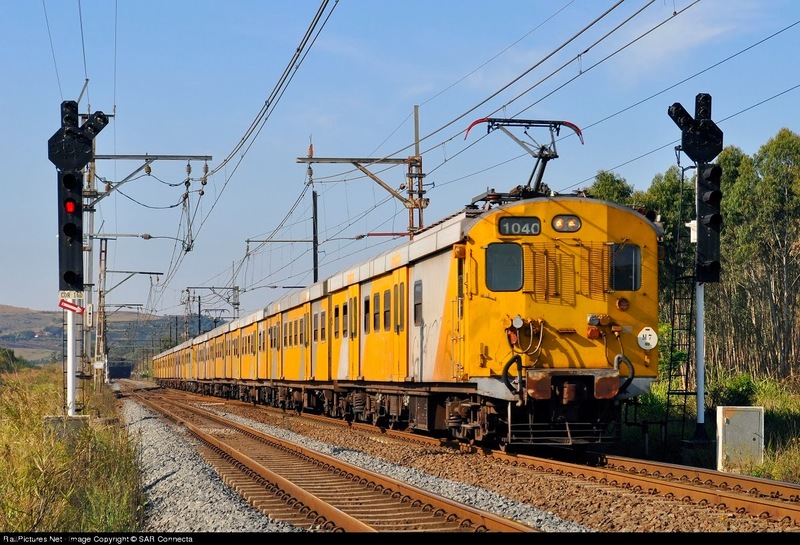 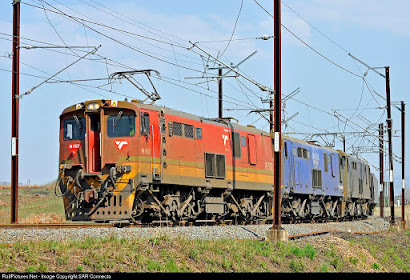 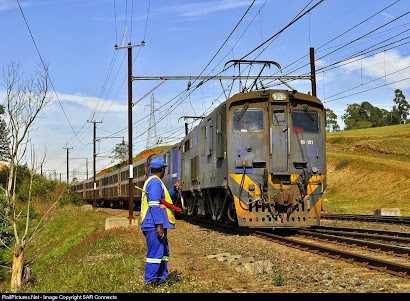 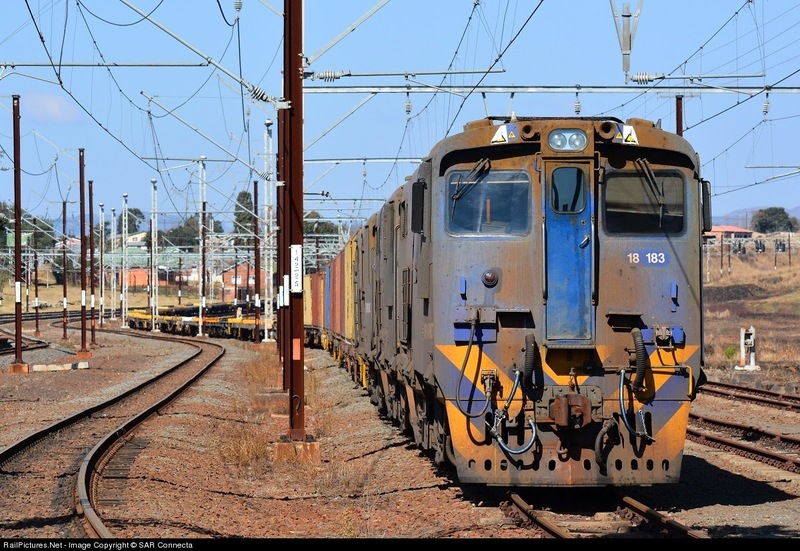 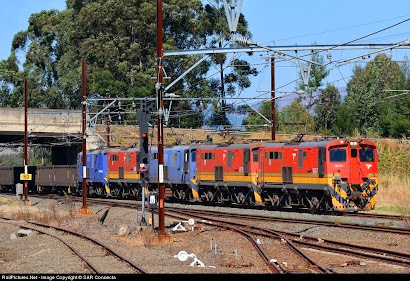 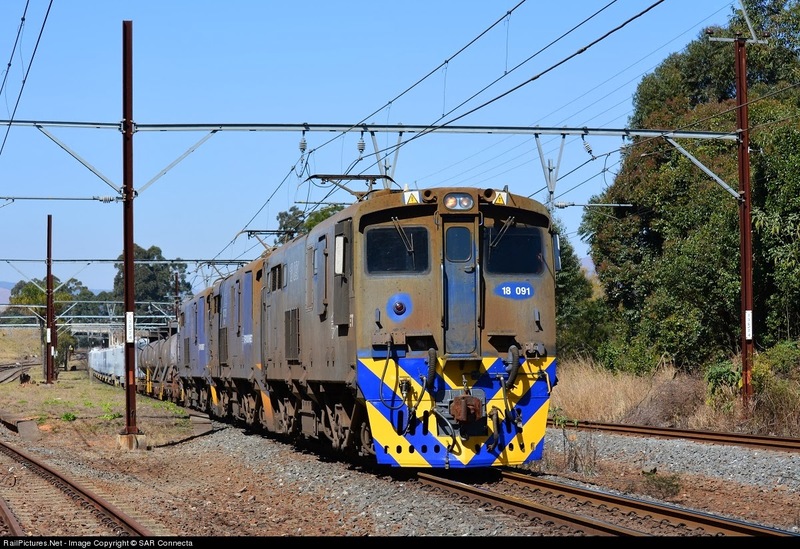 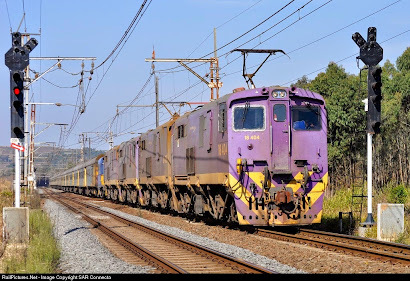 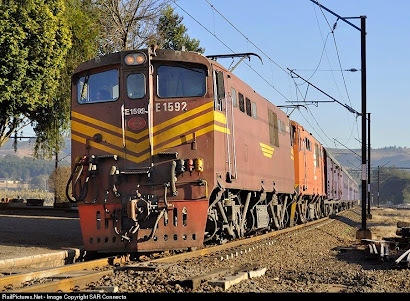 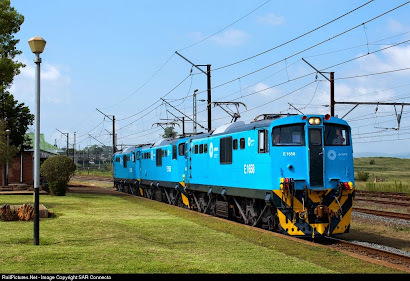 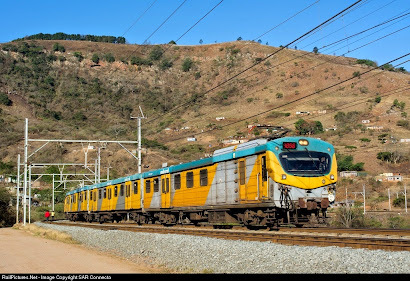 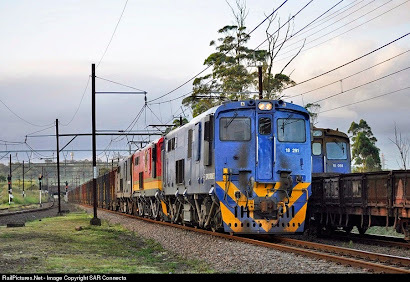 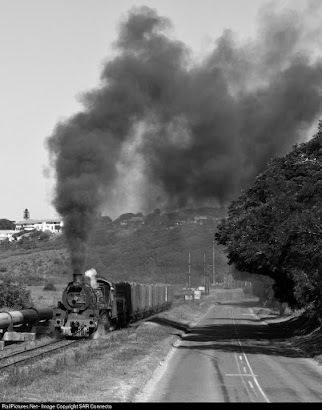 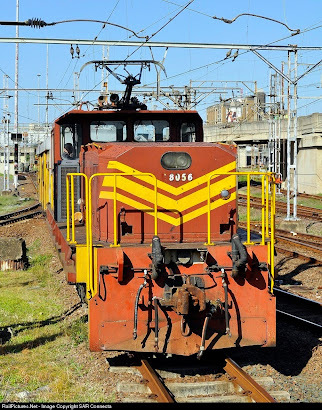 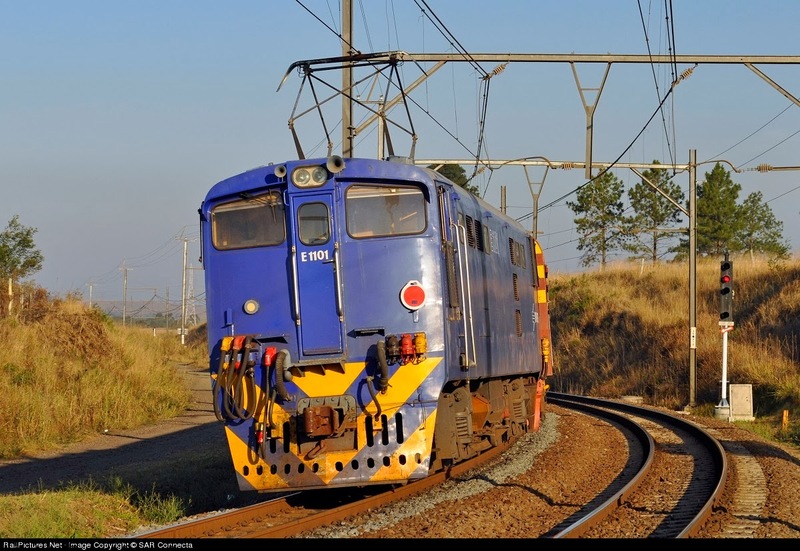 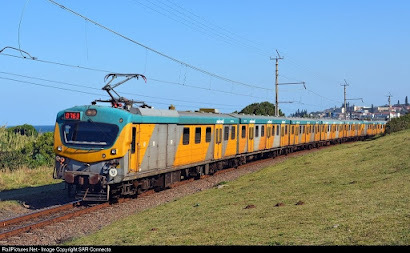 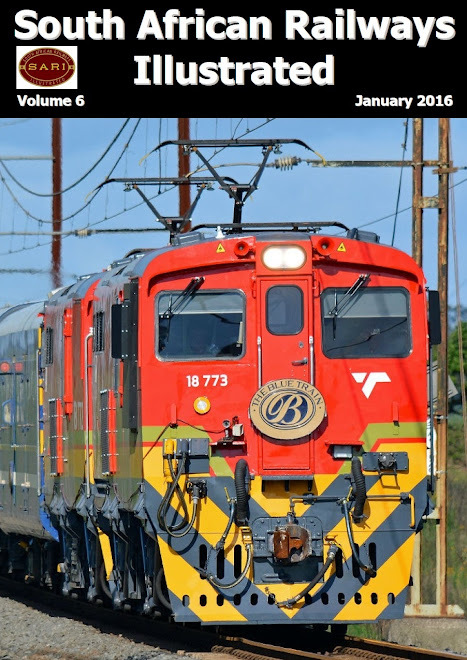 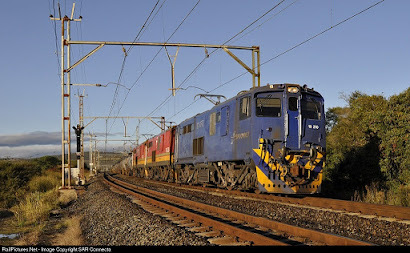 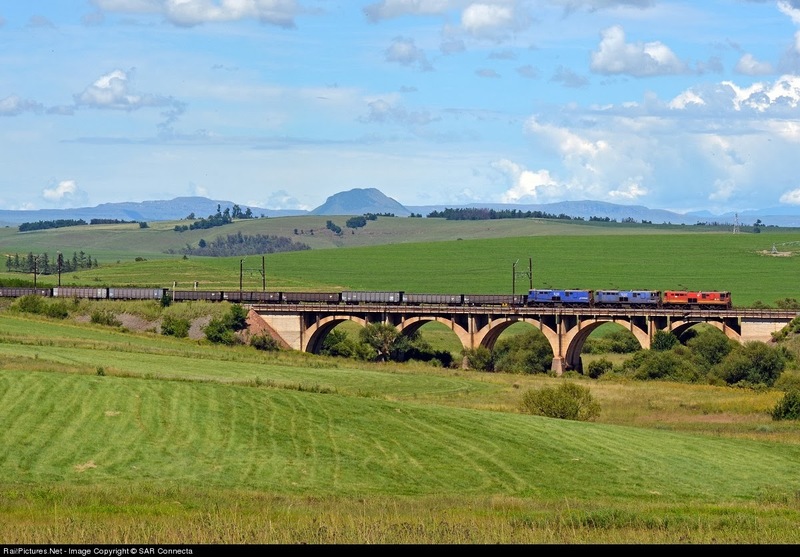 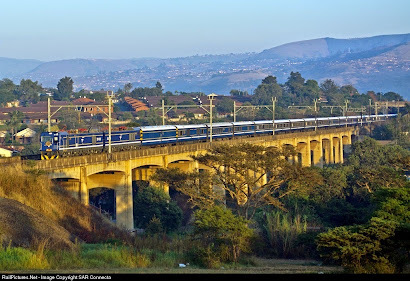 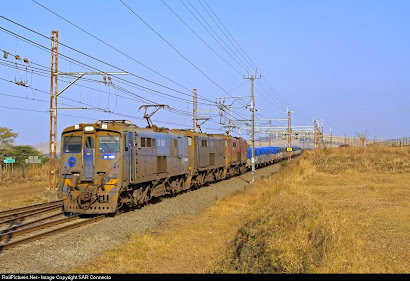 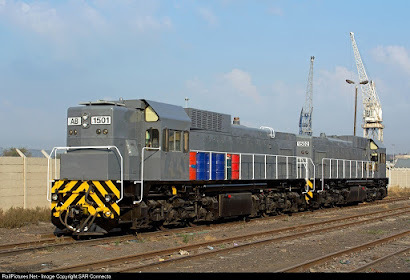 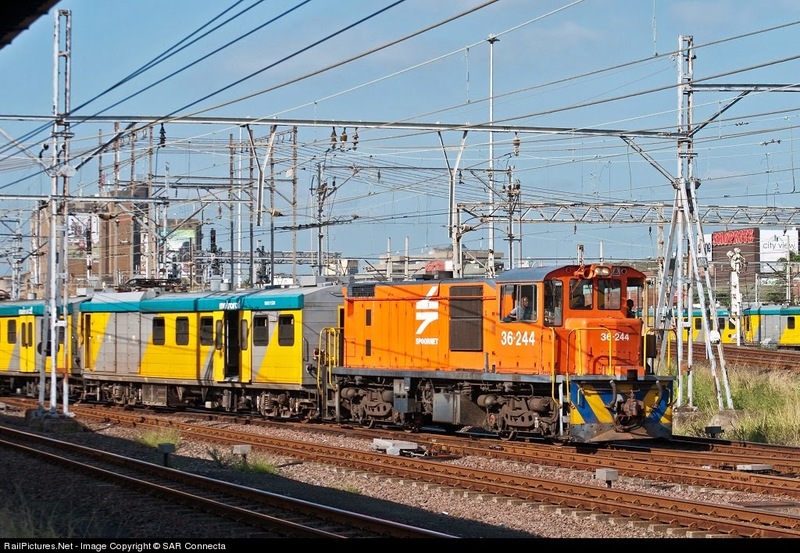 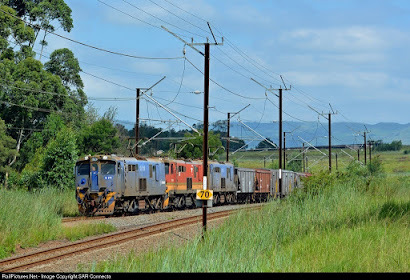 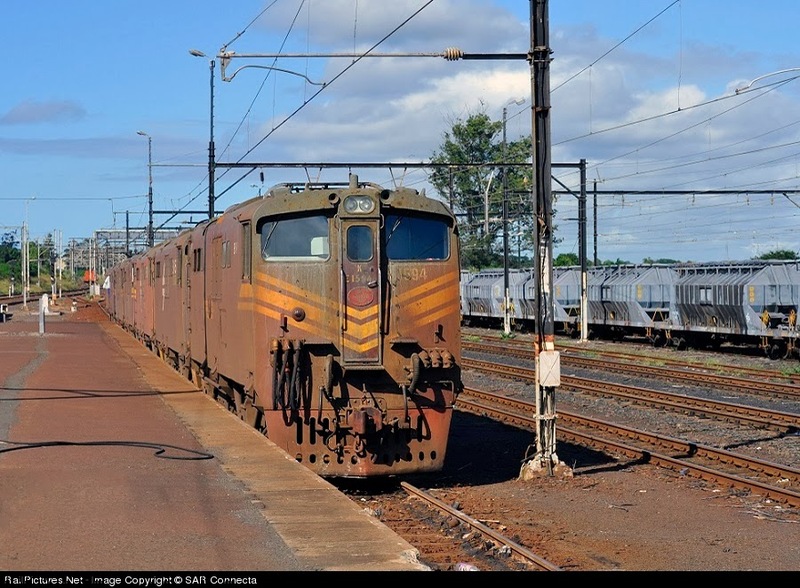 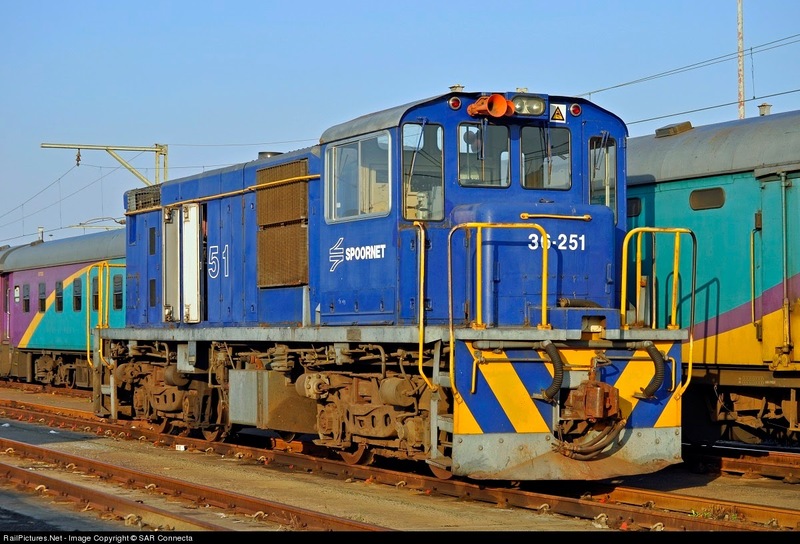 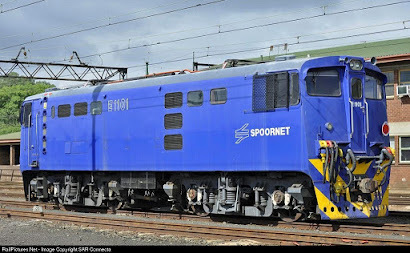 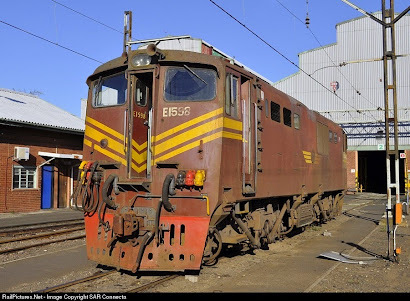 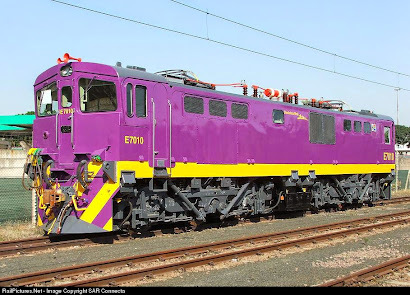 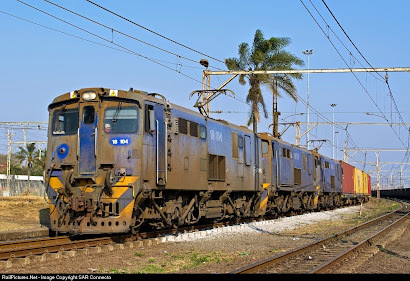 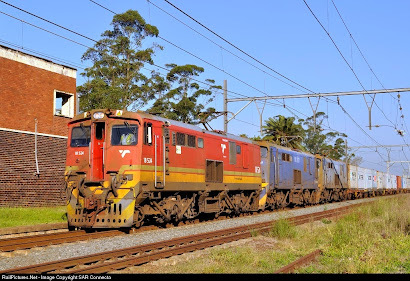 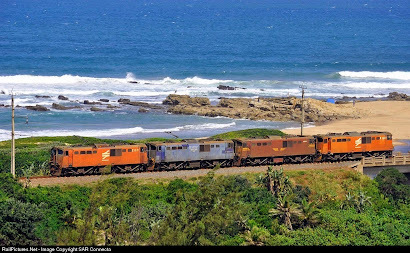 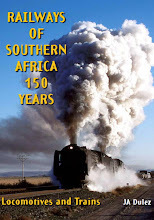 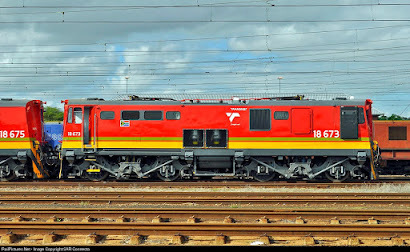 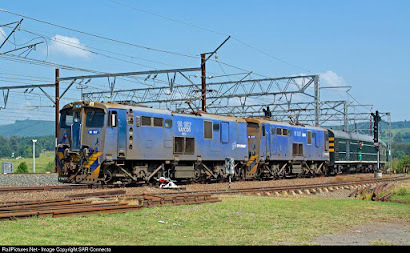 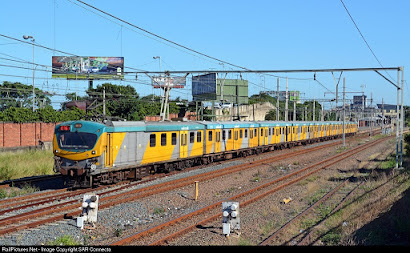 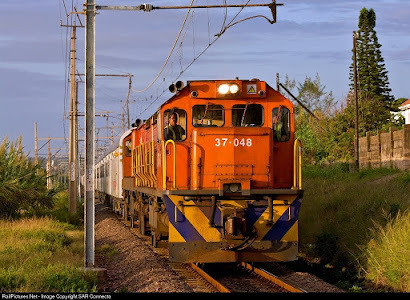 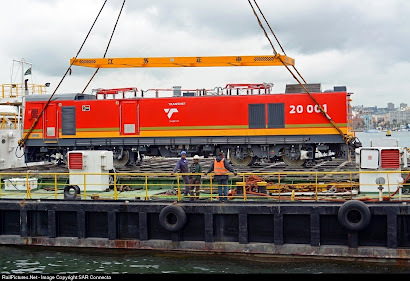 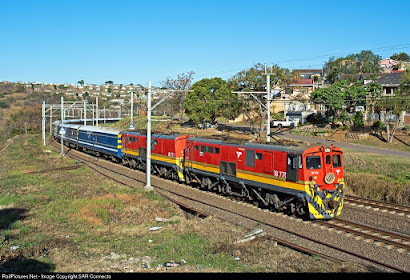 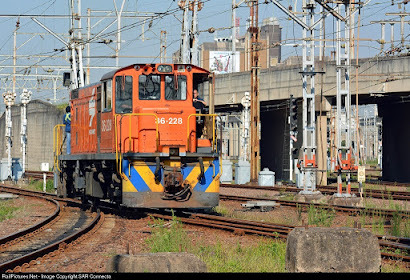 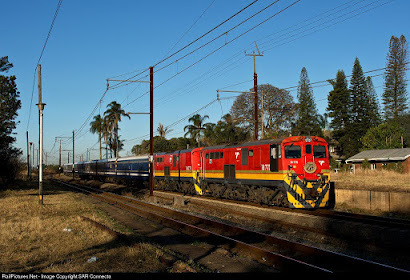 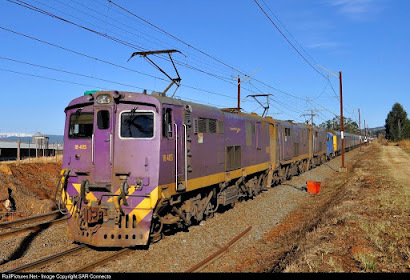 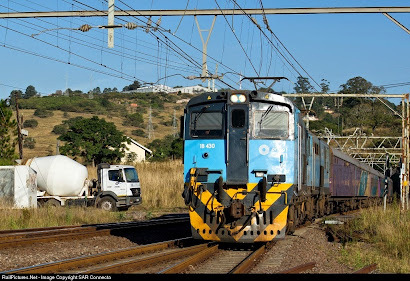 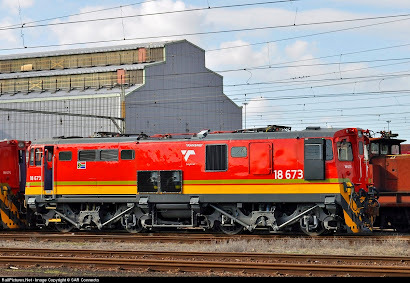 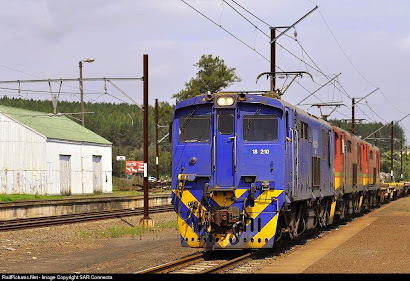 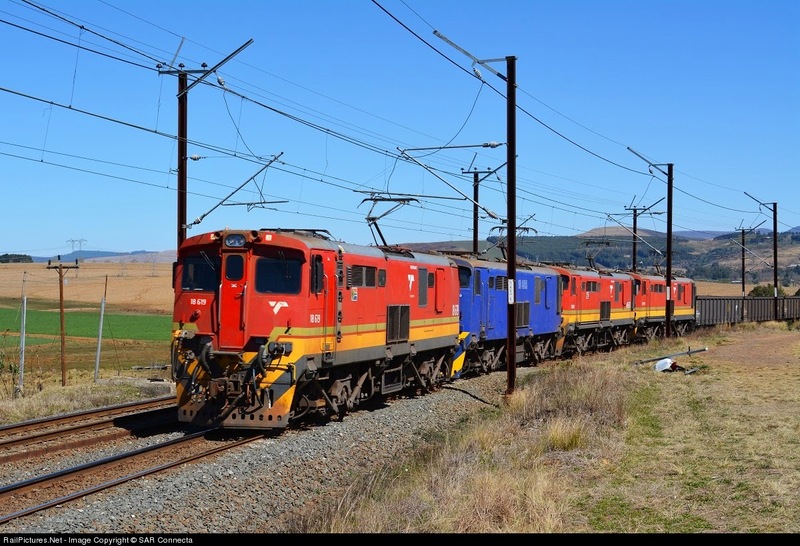 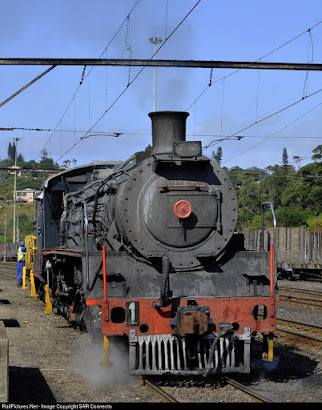 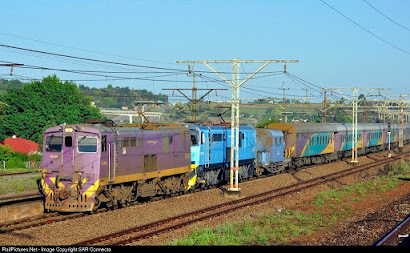 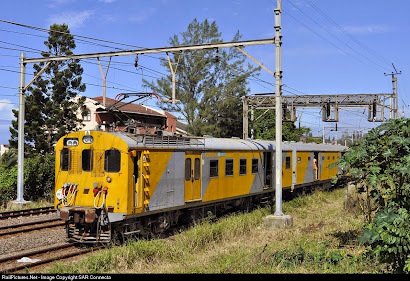 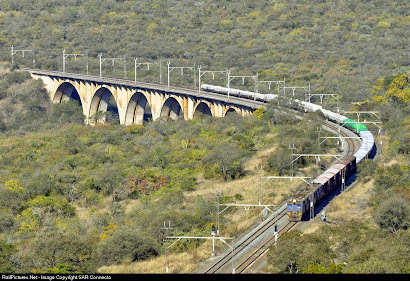 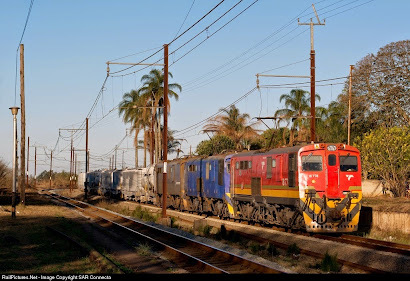 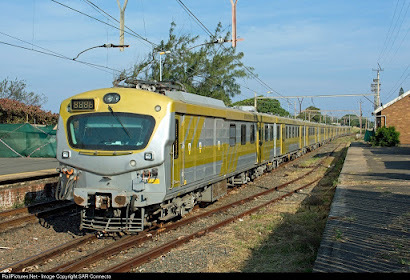 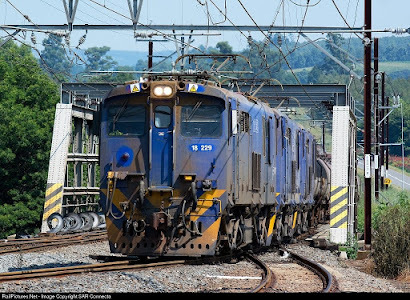 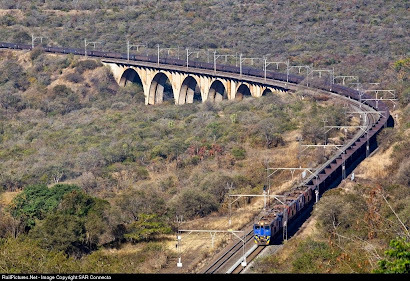 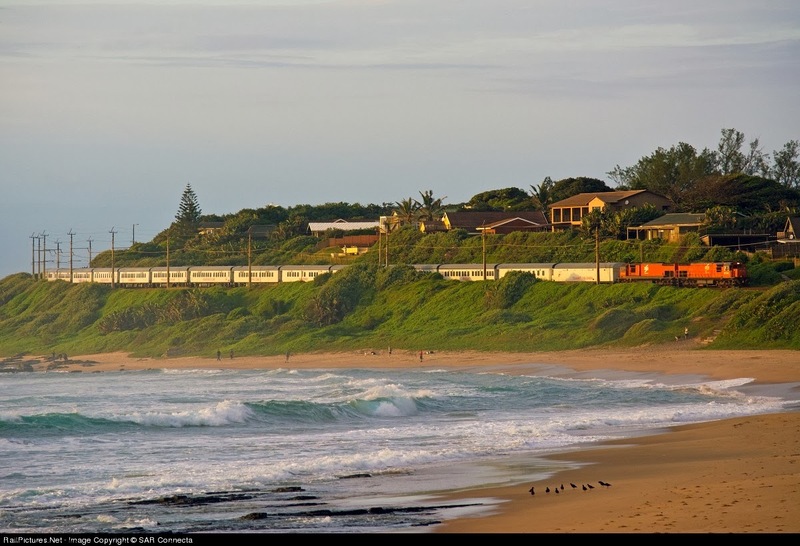 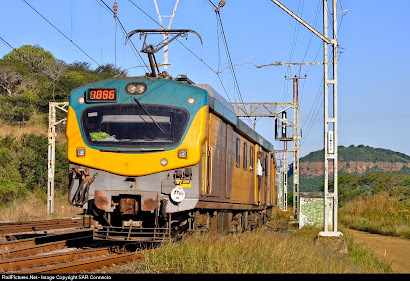 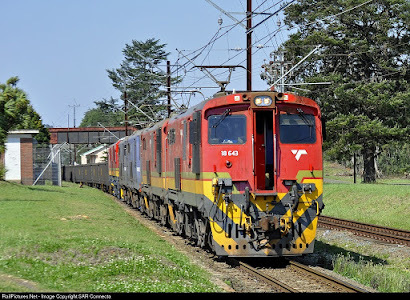 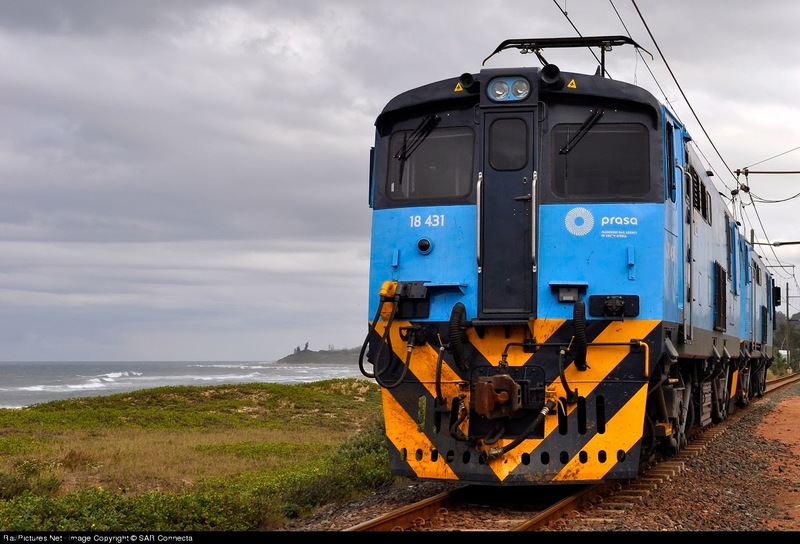 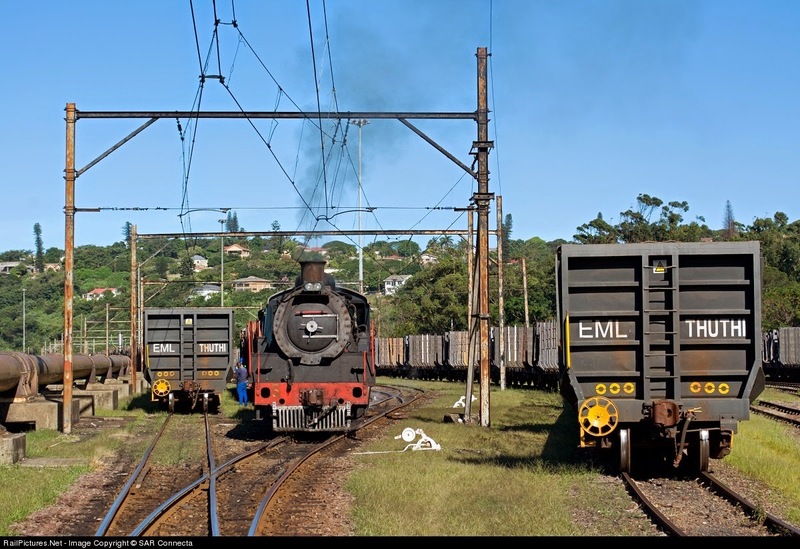 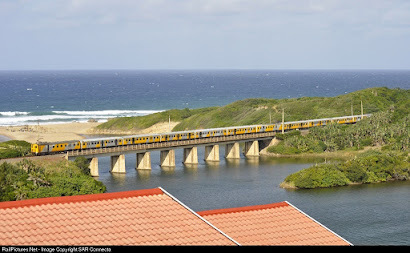 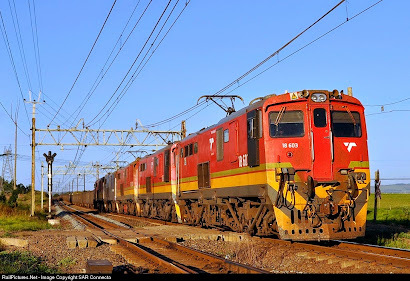 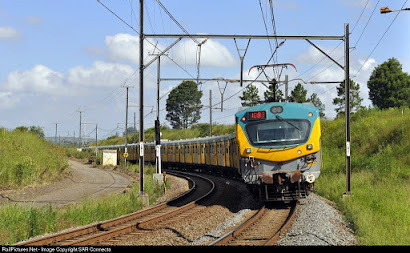 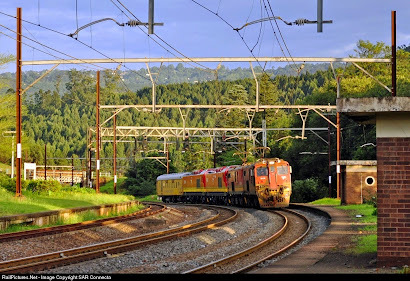 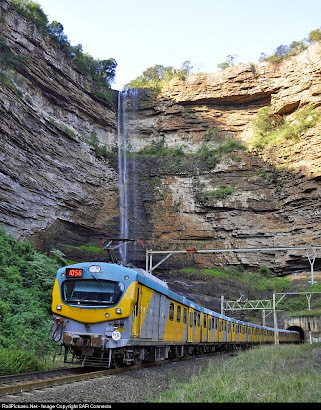 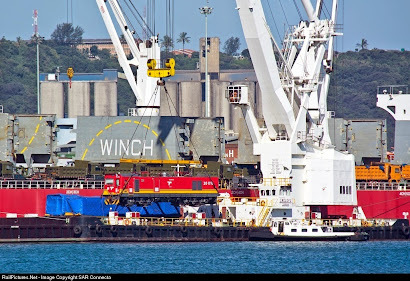 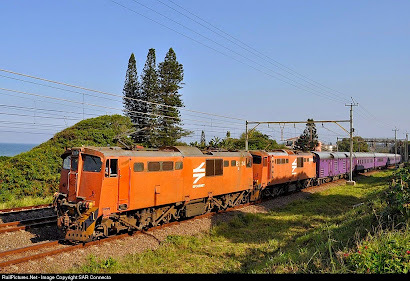 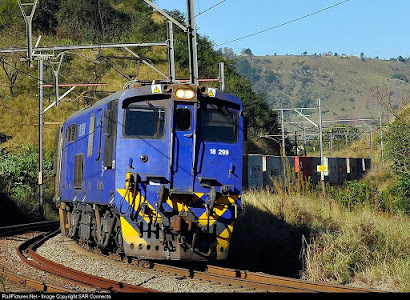 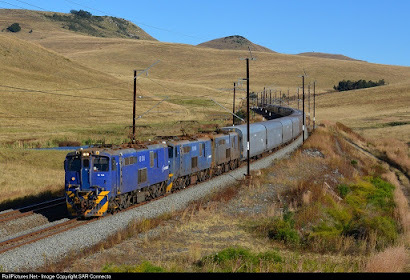 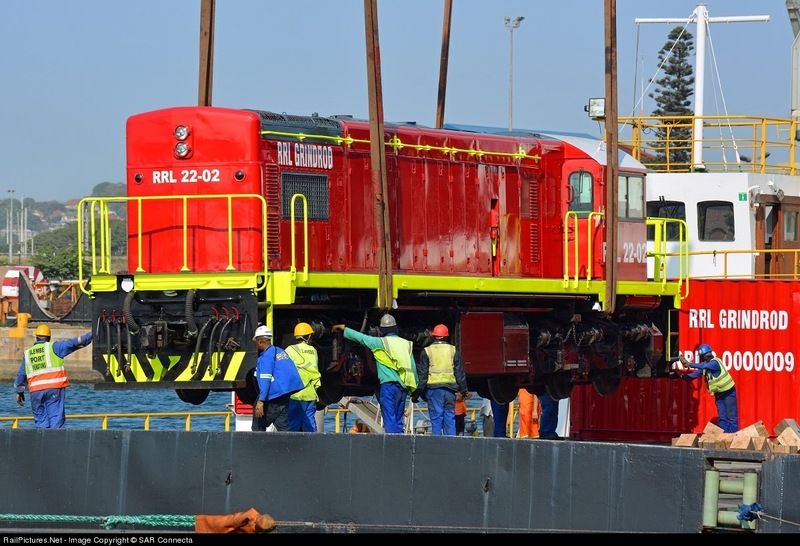 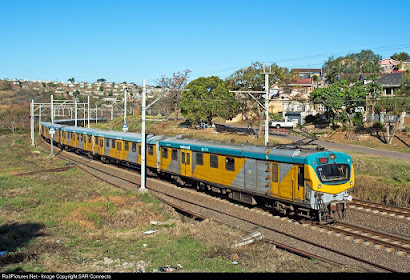 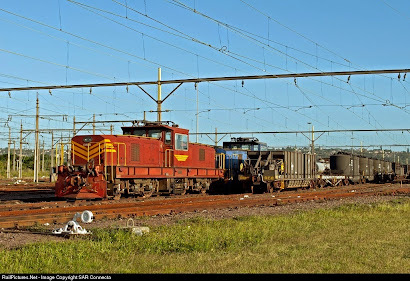 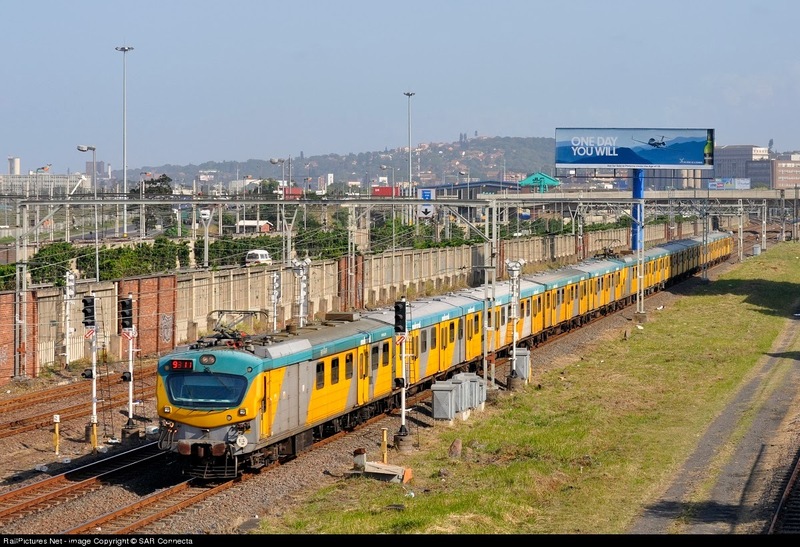 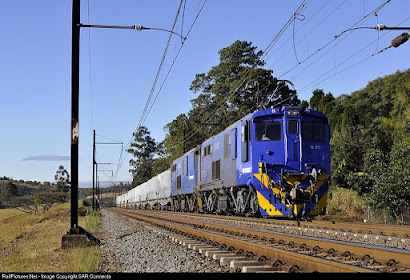 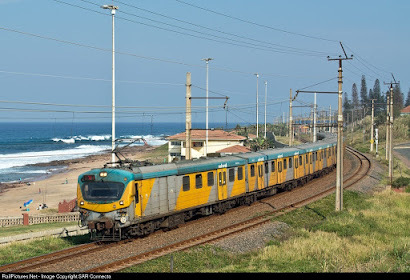 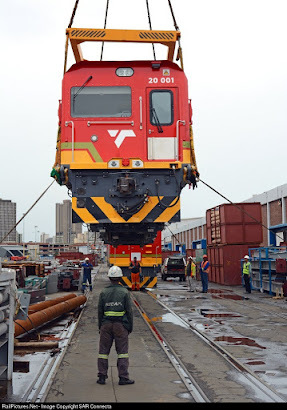 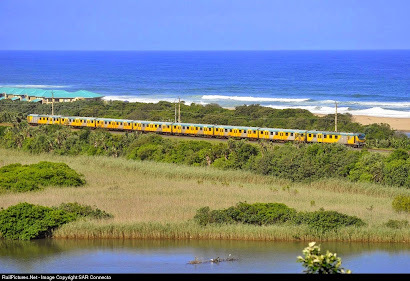 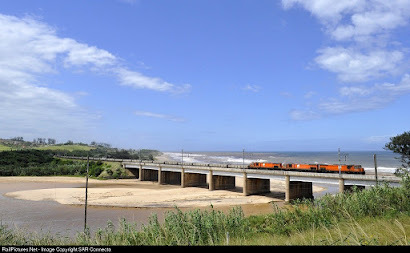 E1389 New Durban (7th April 2012). 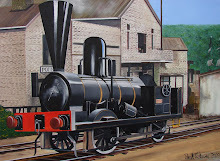 37-019 / 37-044 - Ilfracombe (2nd April 2012). 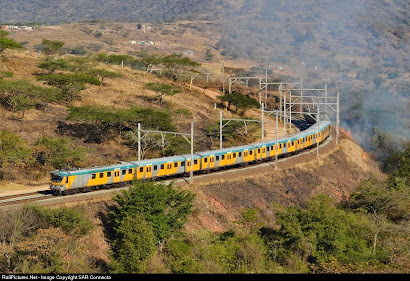 Metrorail - Ilfracombe (2nd April 2012). 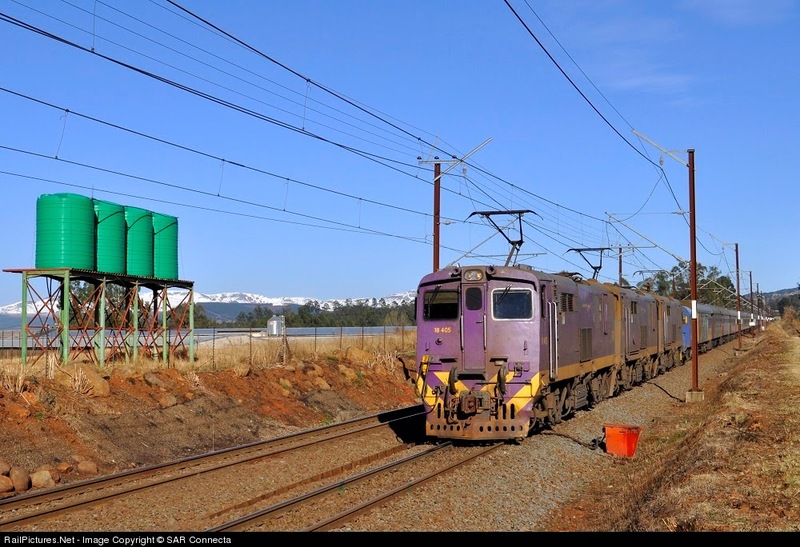 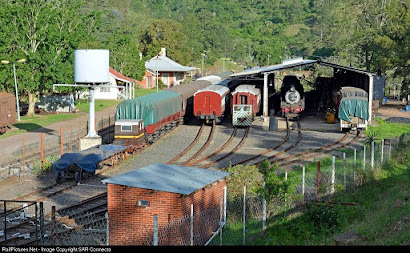 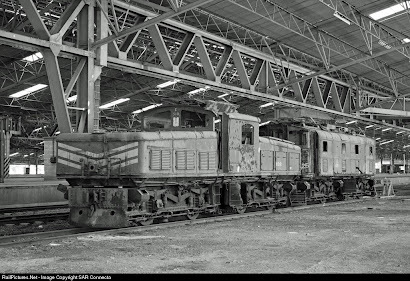 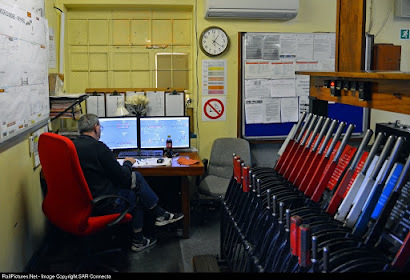 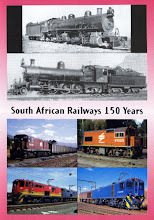 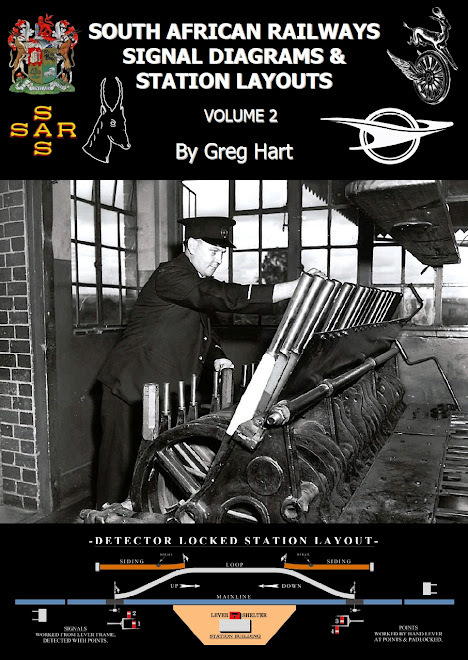 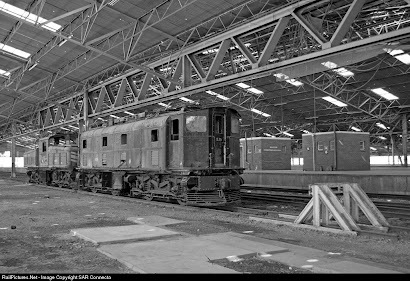 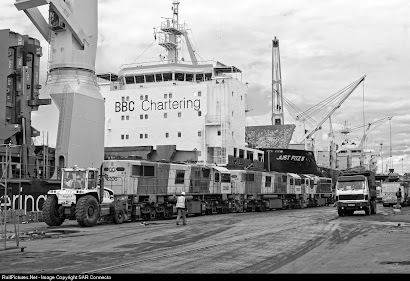 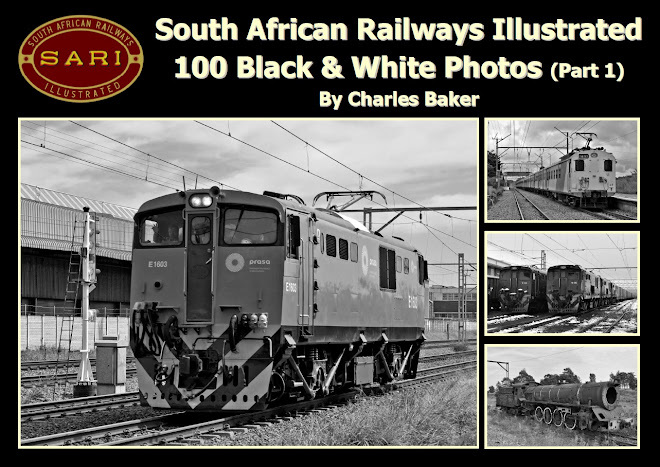 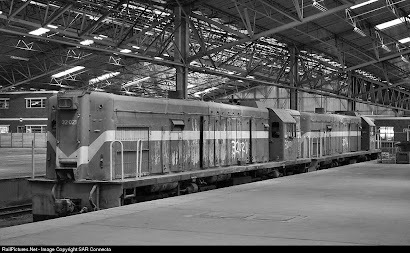 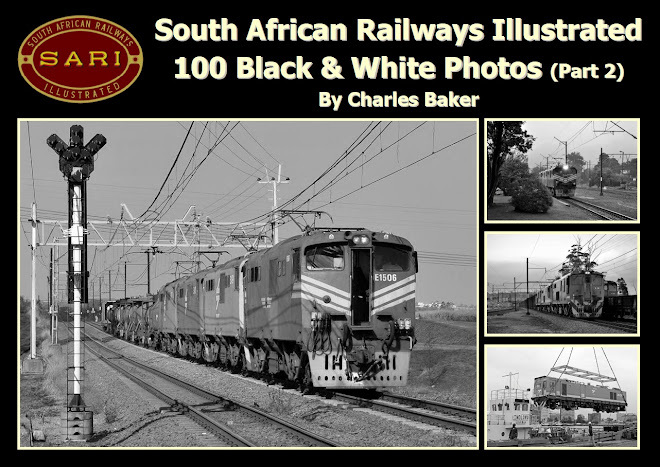 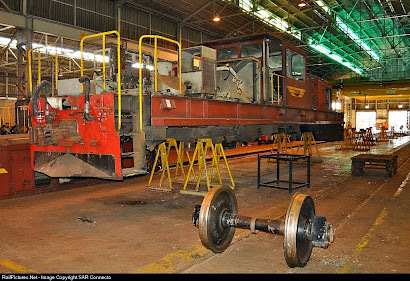 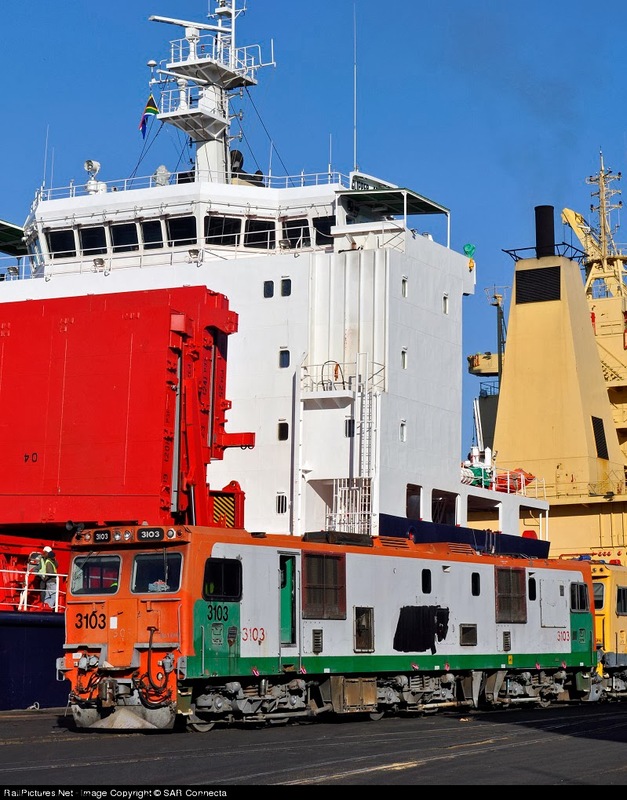 18-602 & Cement Wagons - Cedara (1st April 2012). 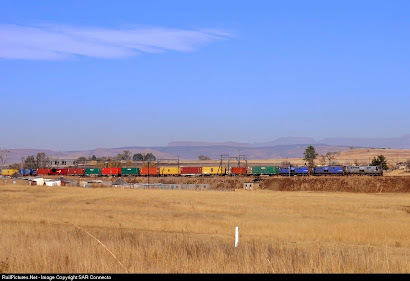 18-239 & Containers - Lidgetton (1st April 2012).